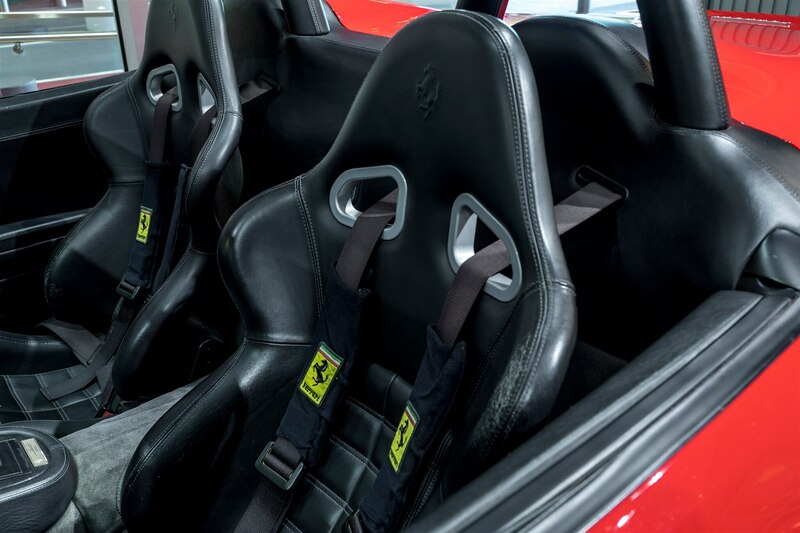 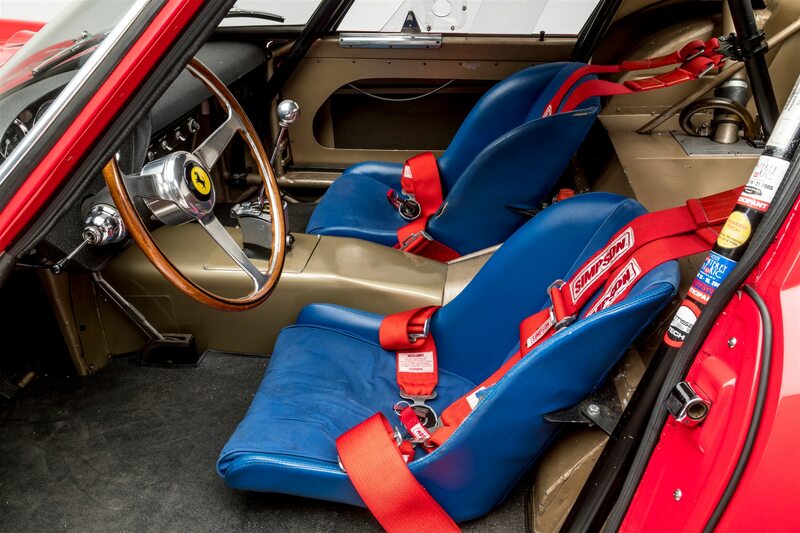 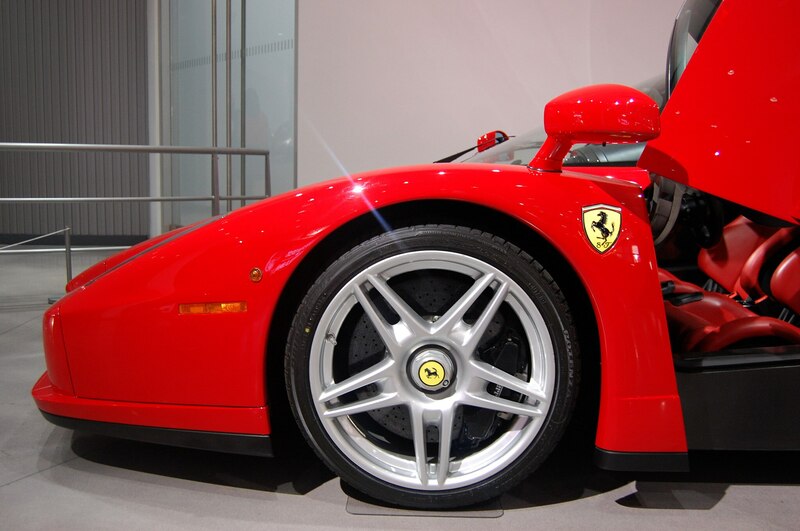 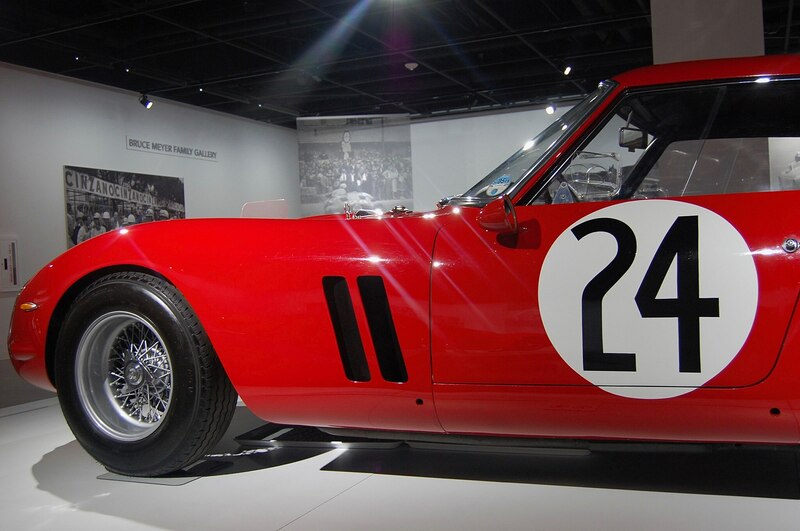 LOS ANGELES, California — Enzo Ferrari’s dream was to build the world’s best racecars. 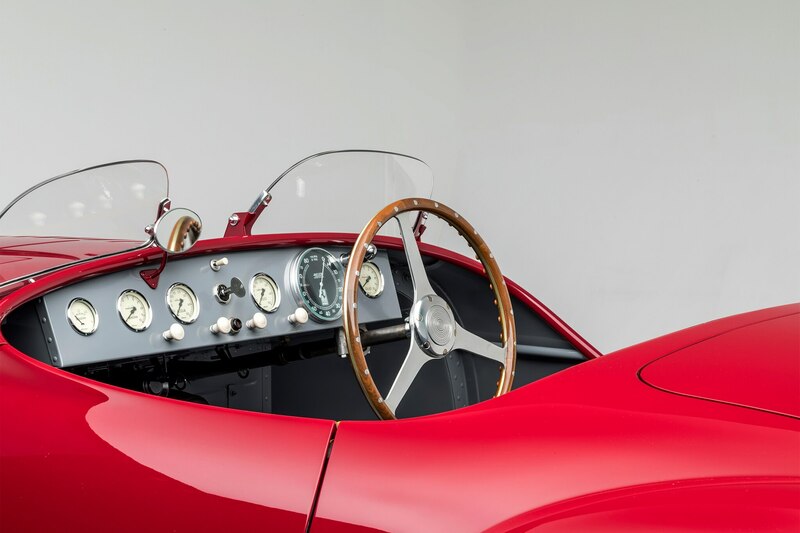 He funded that dream by building what would become some of the world’s most desirable road cars. 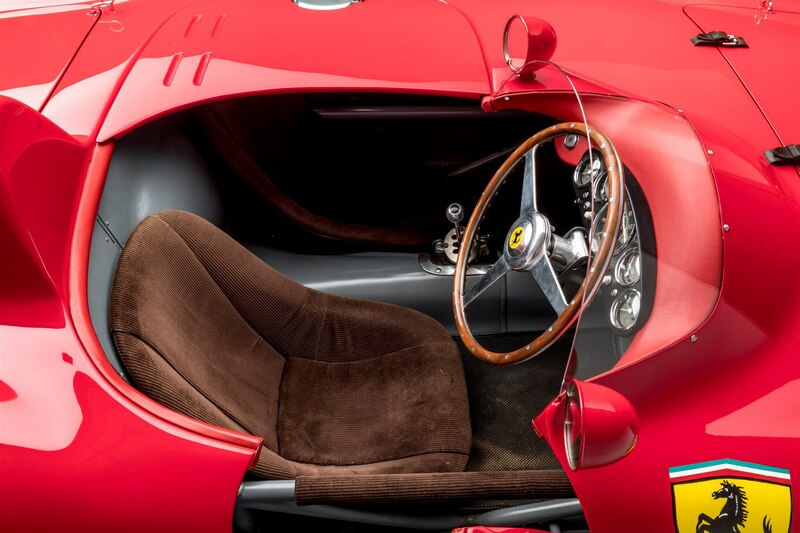 Every car fashioned by Ferrari attempts to balance brute force and grace, mechanical complexity and aesthetic simplicity. 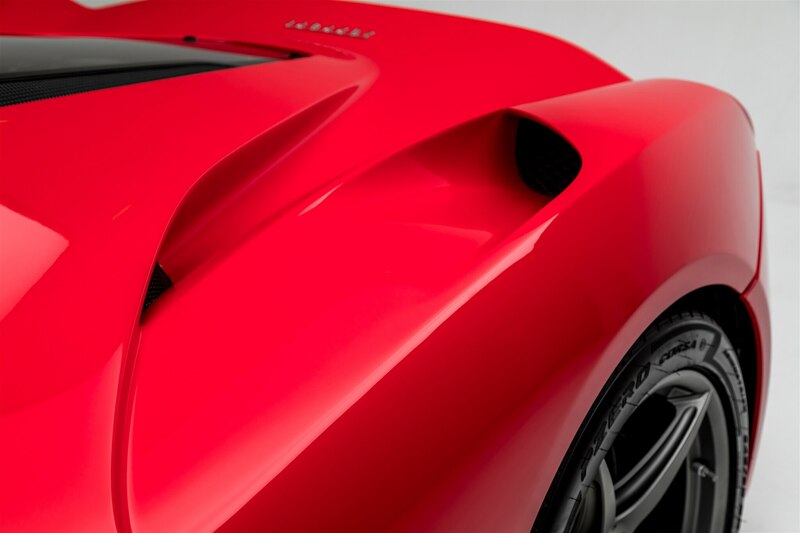 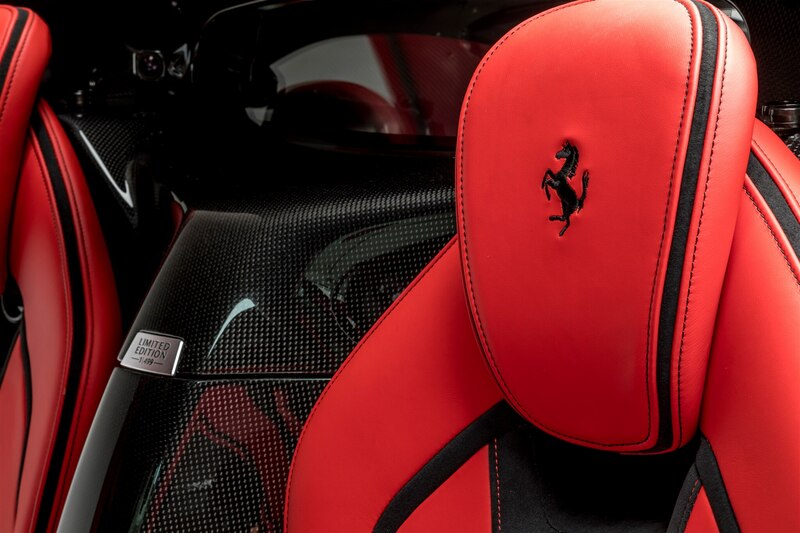 And then there’s Rosso Corsa, the “racing red” of which fantasies are made. 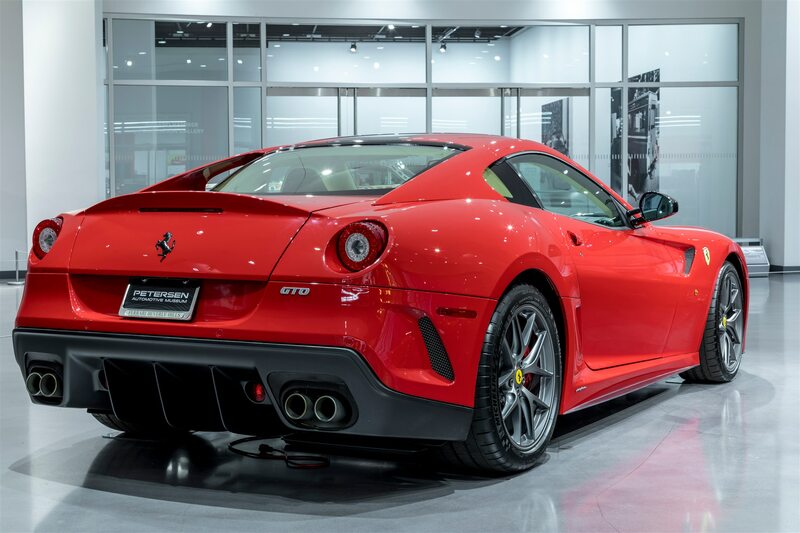 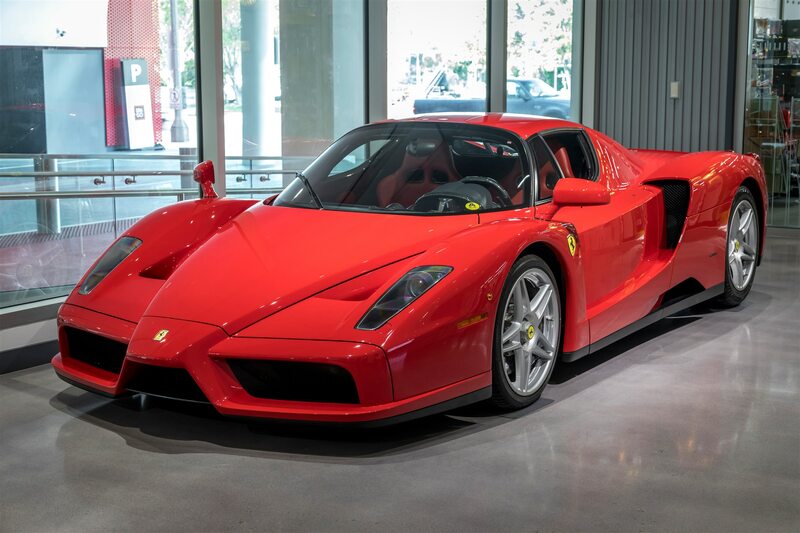 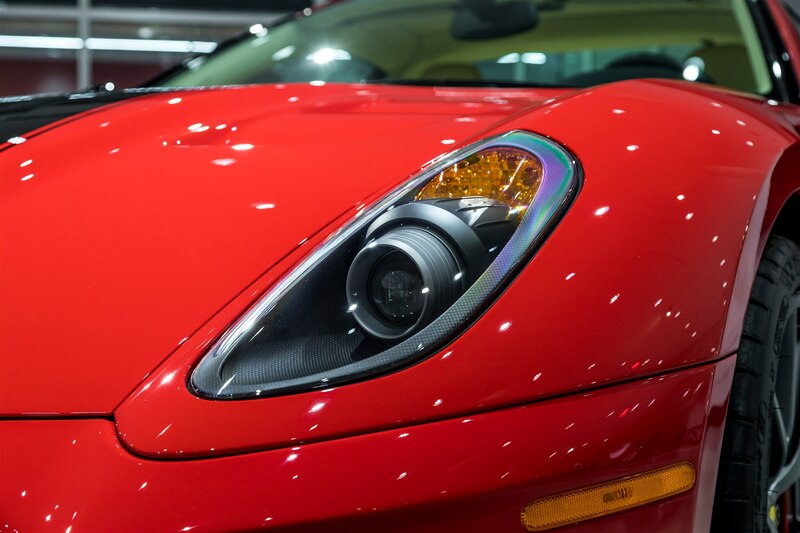 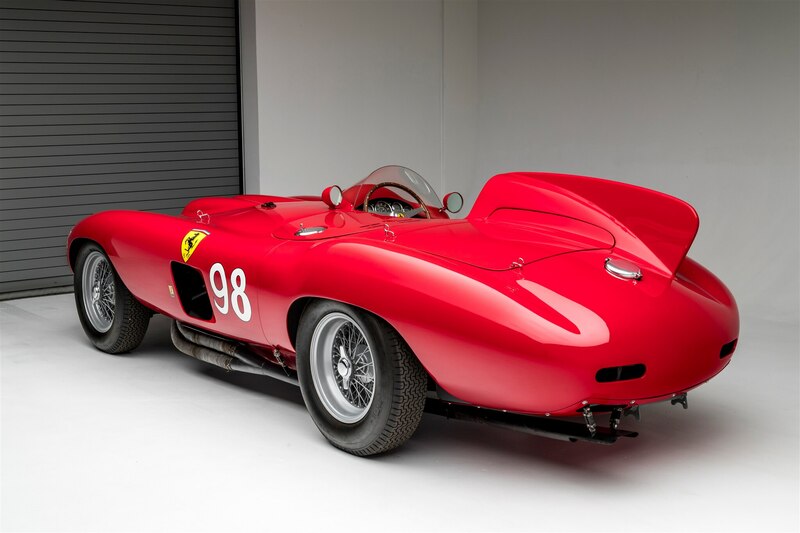 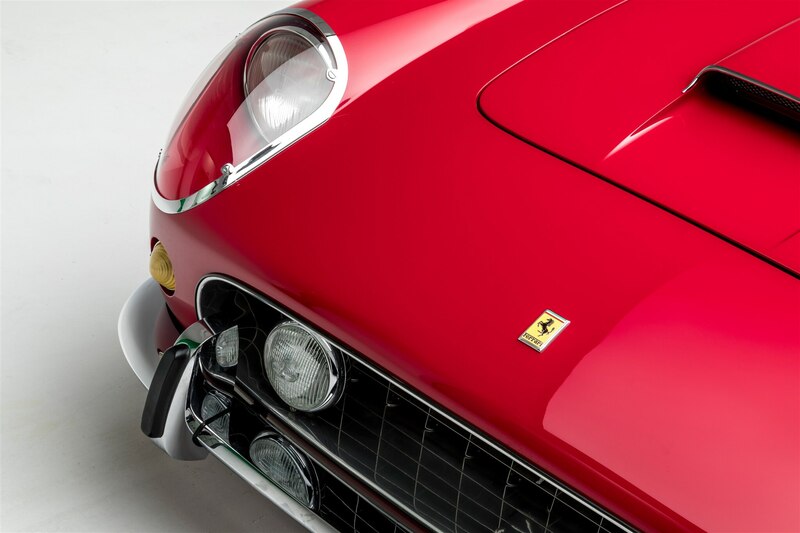 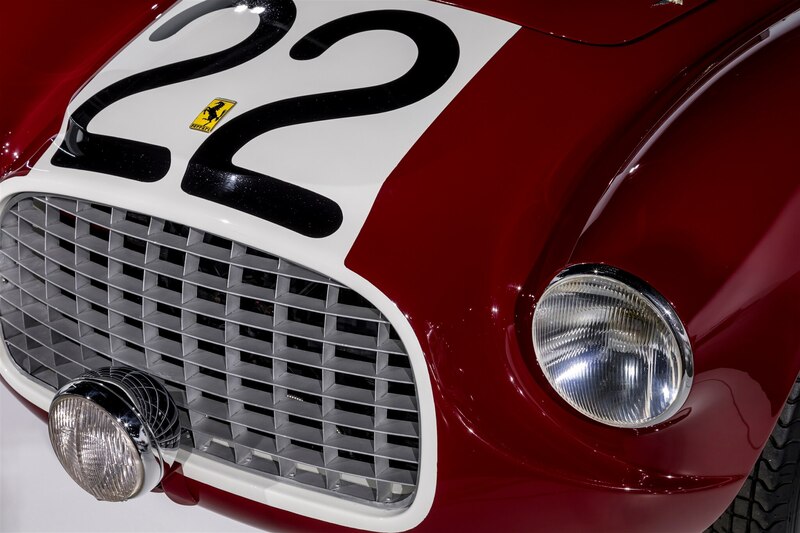 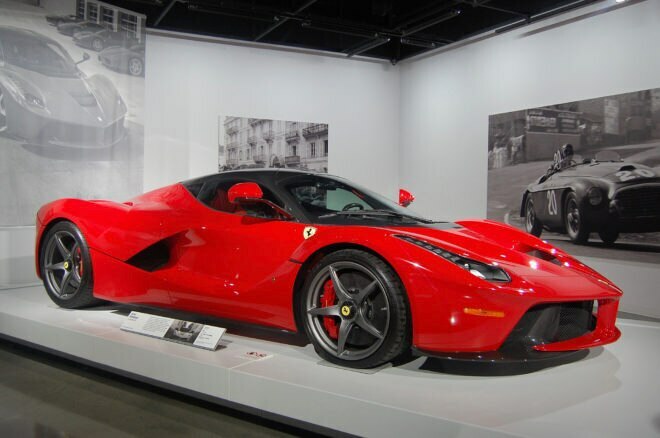 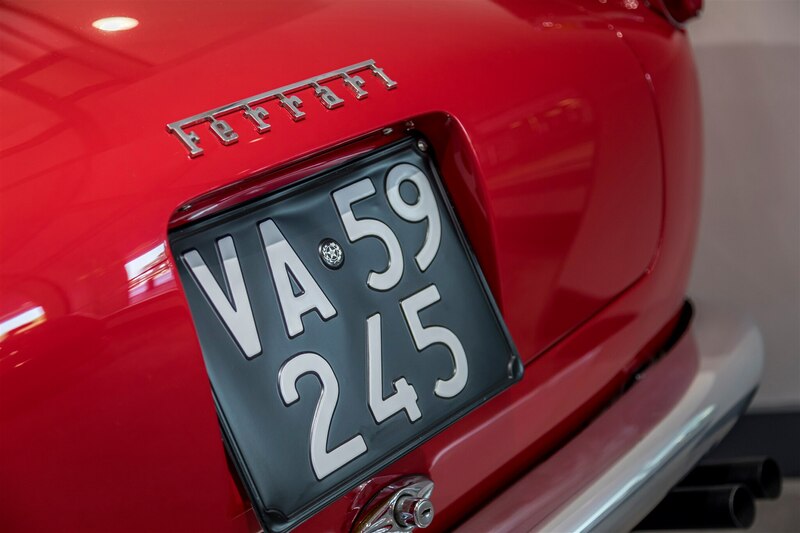 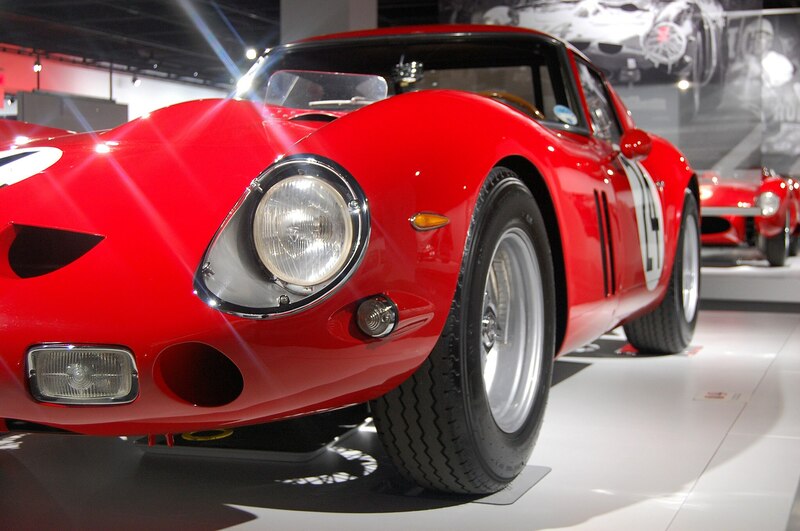 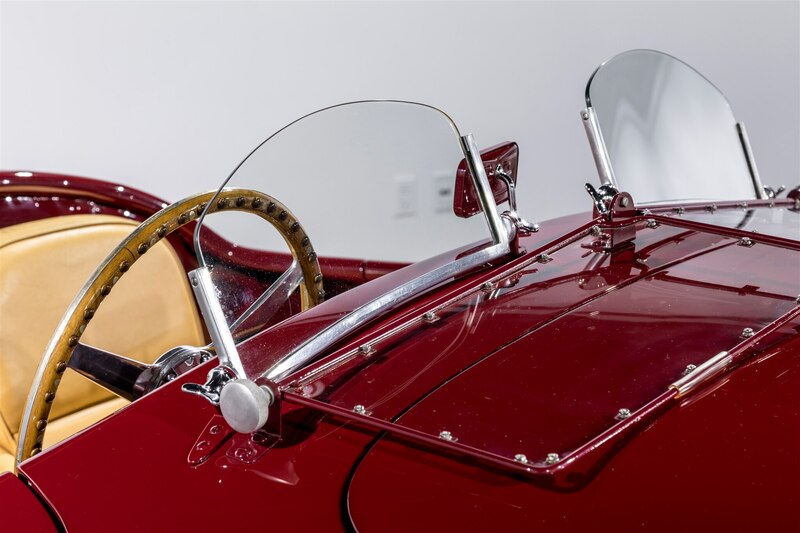 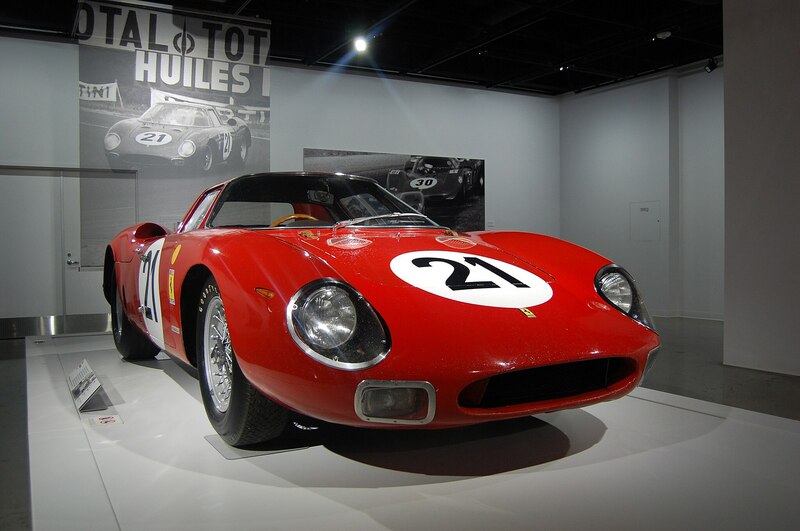 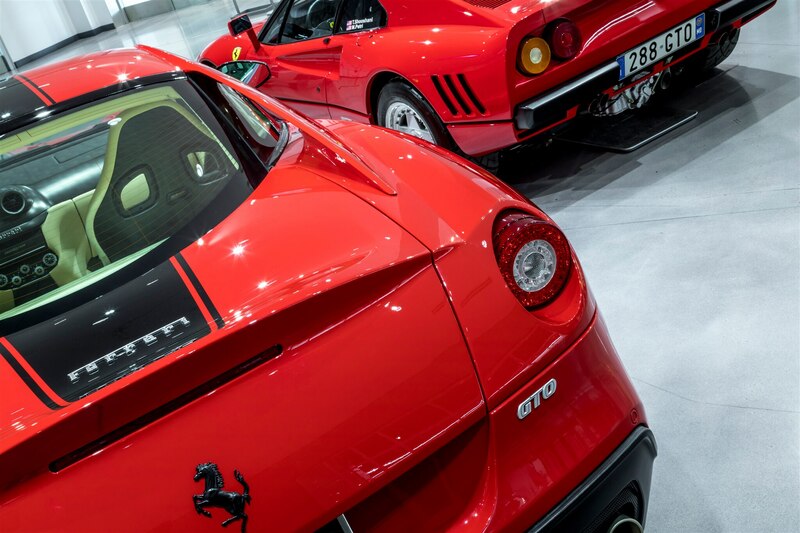 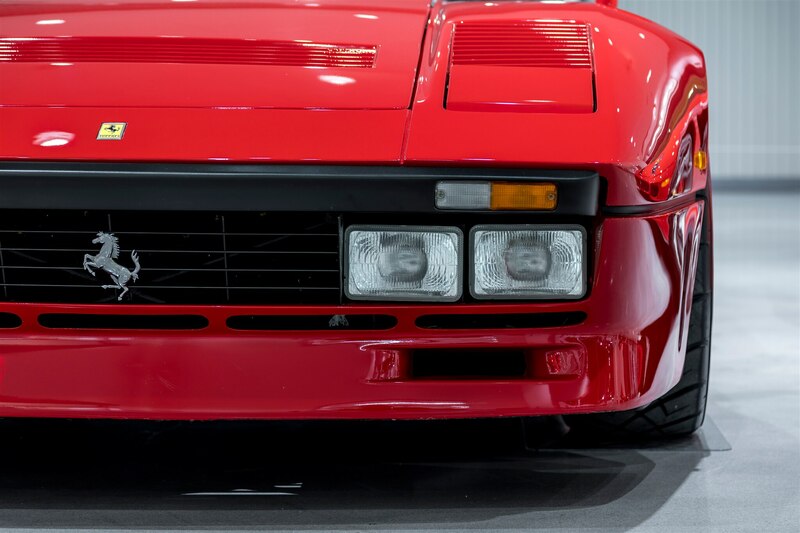 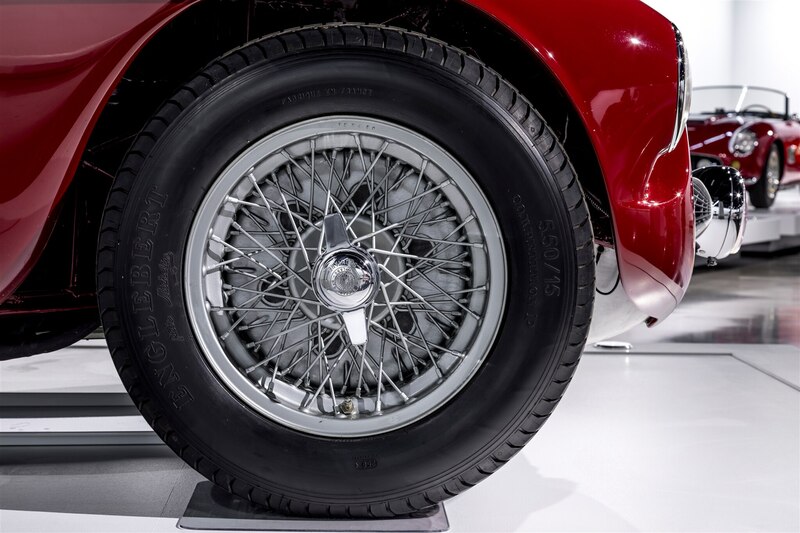 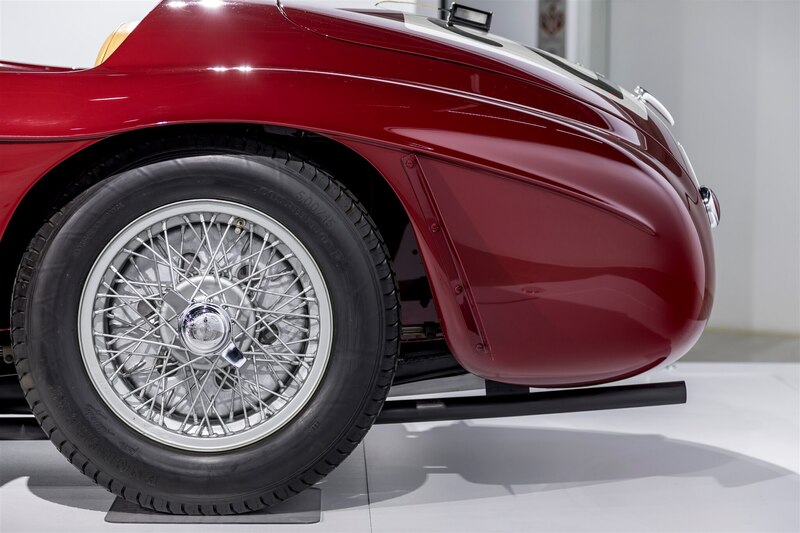 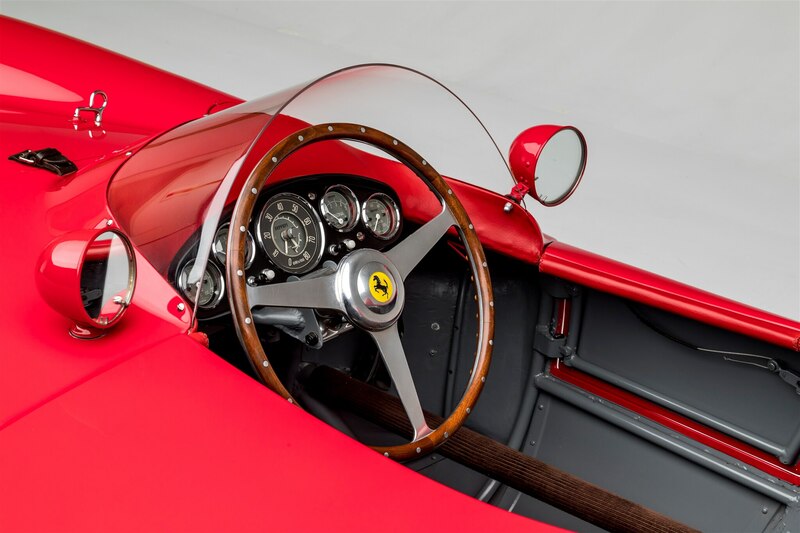 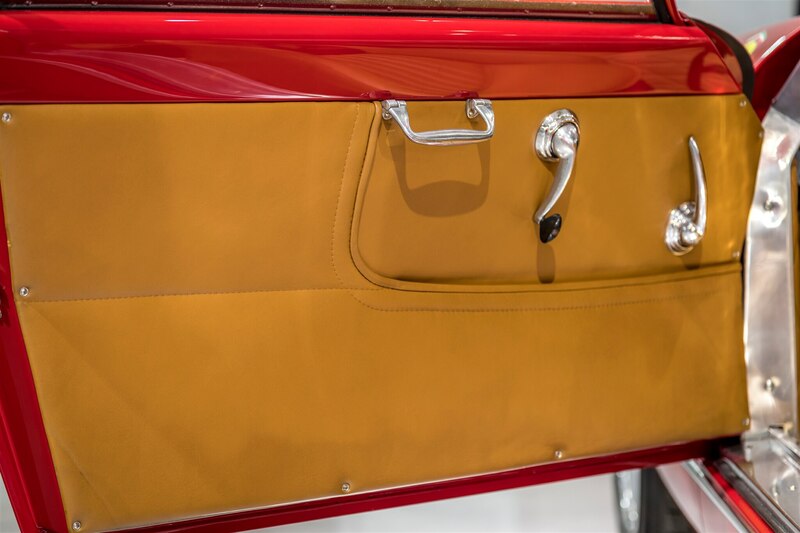 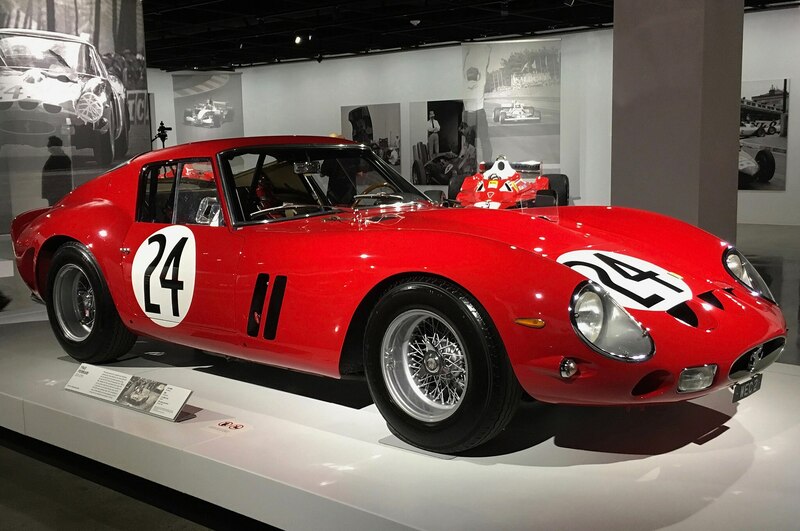 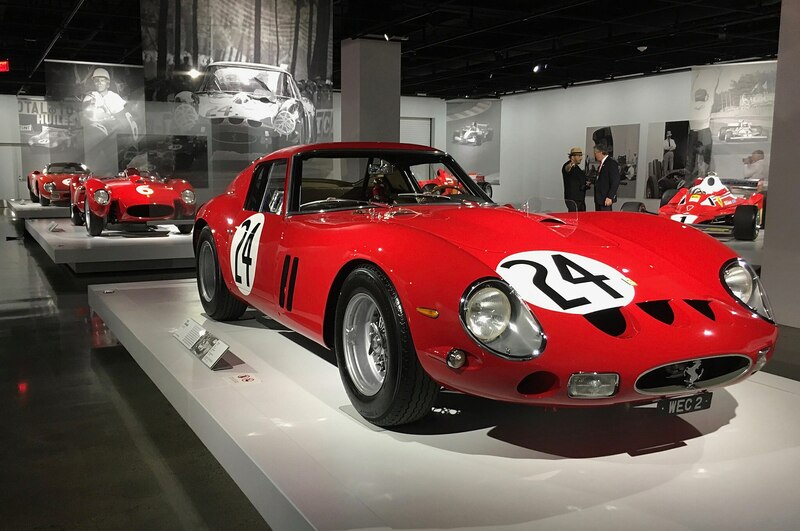 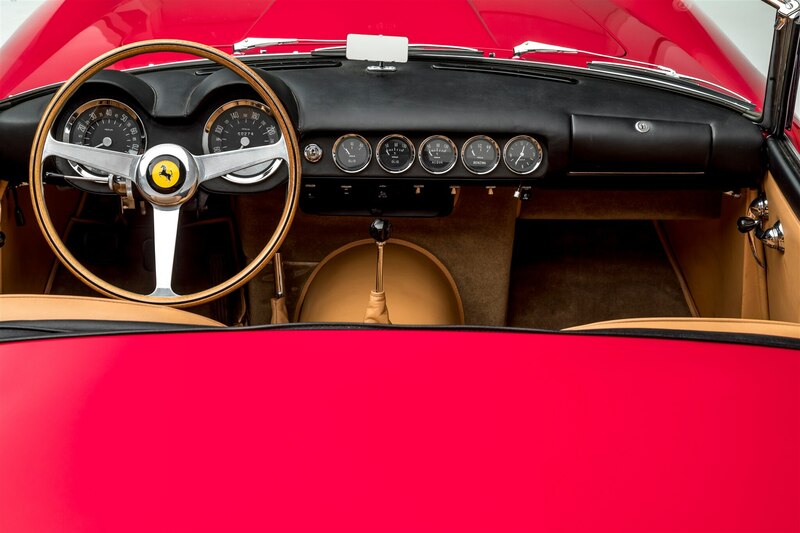 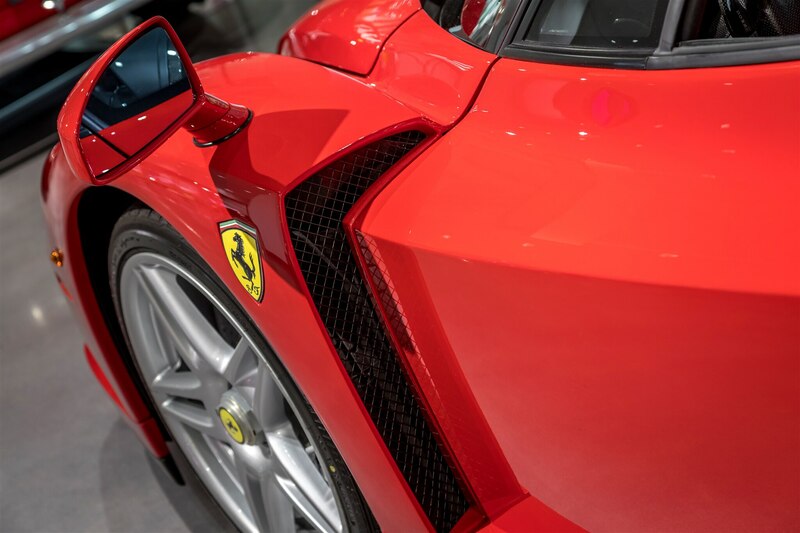 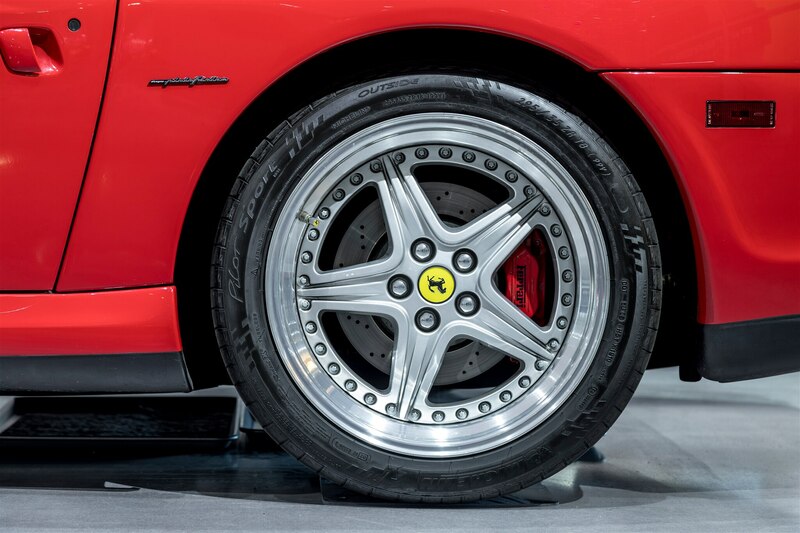 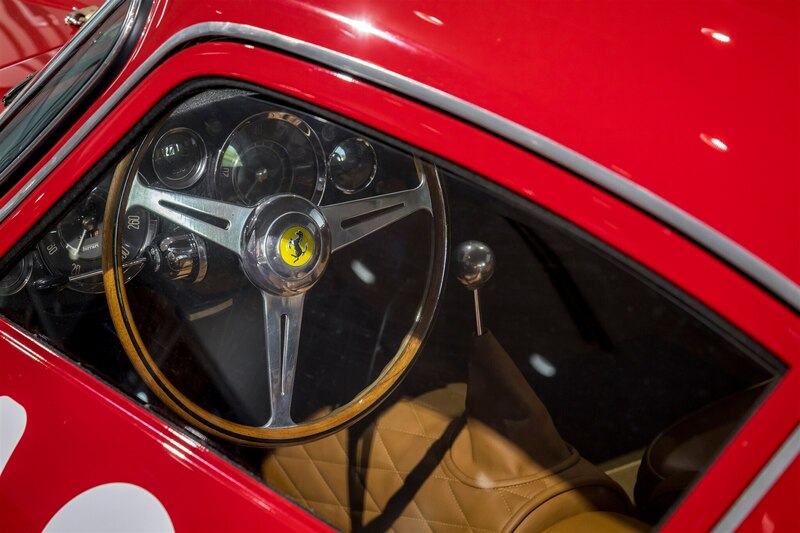 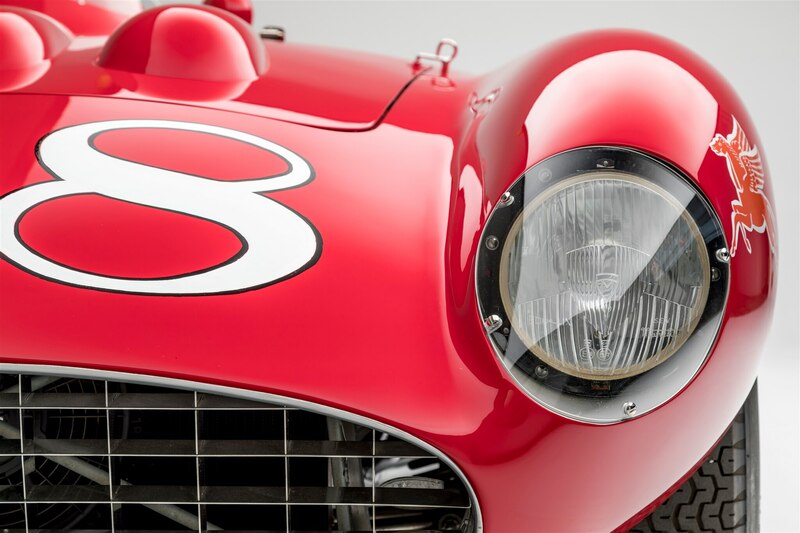 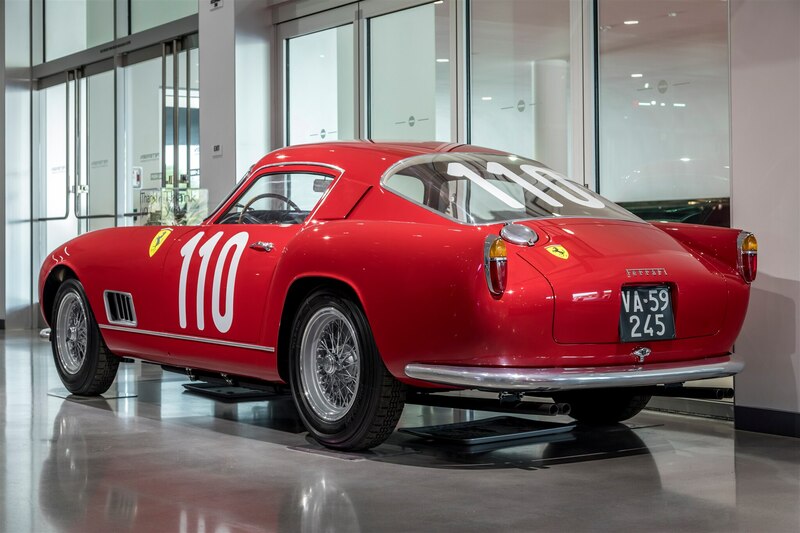 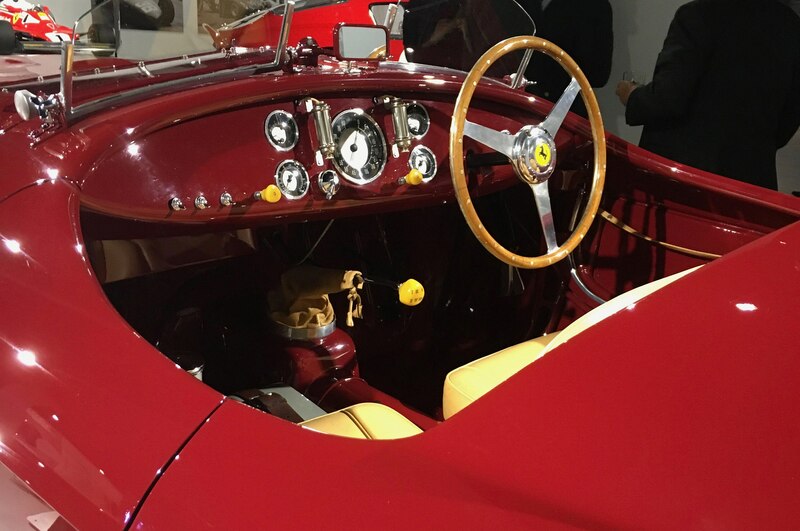 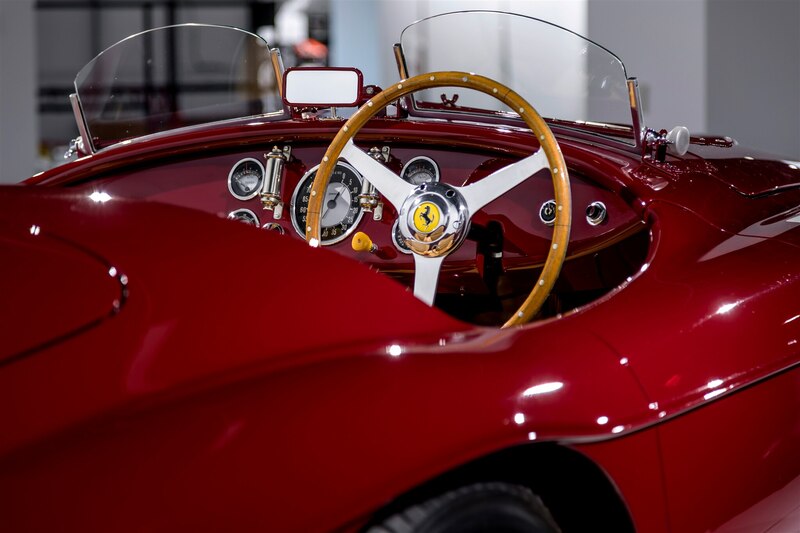 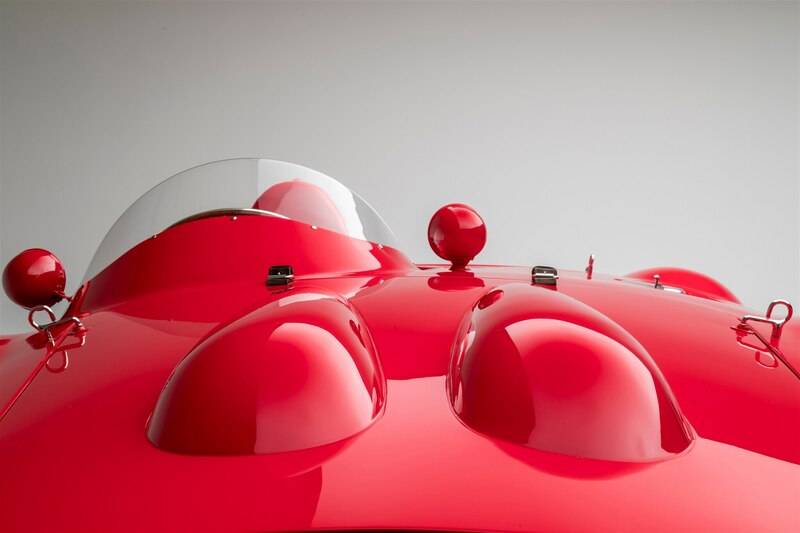 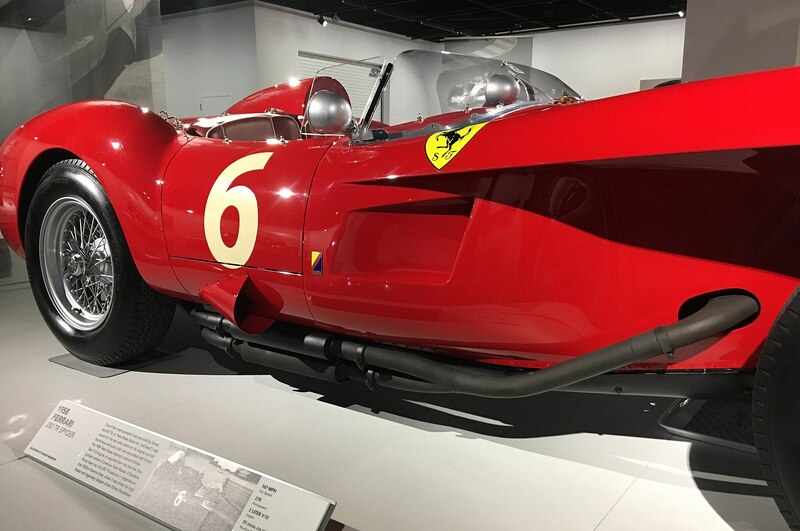 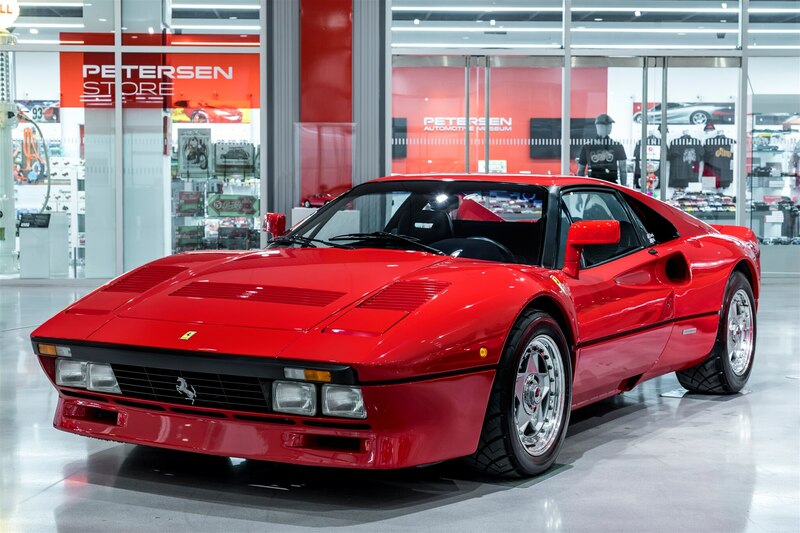 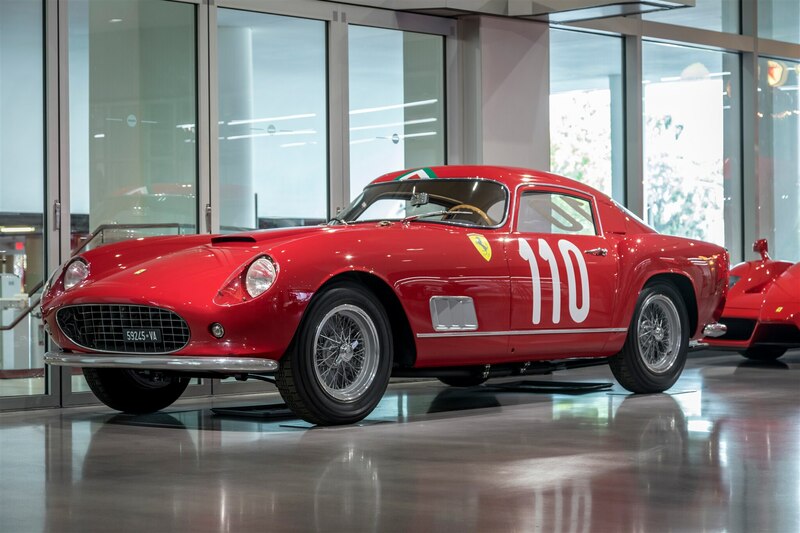 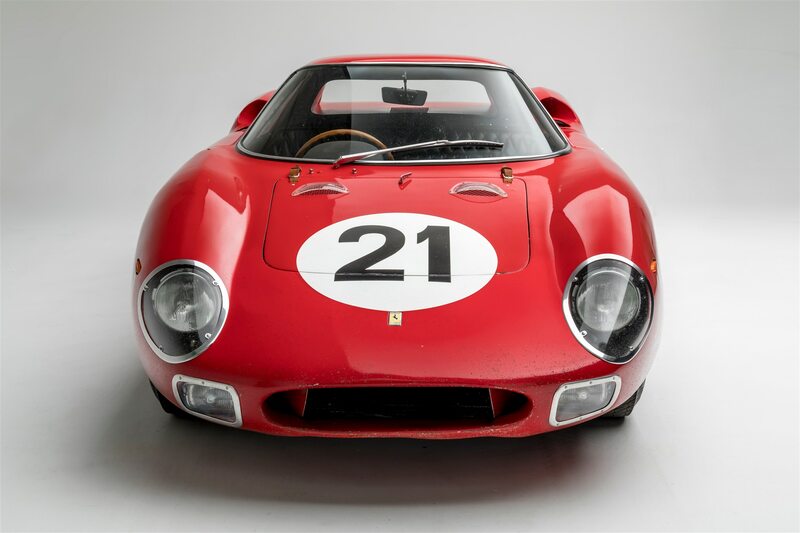 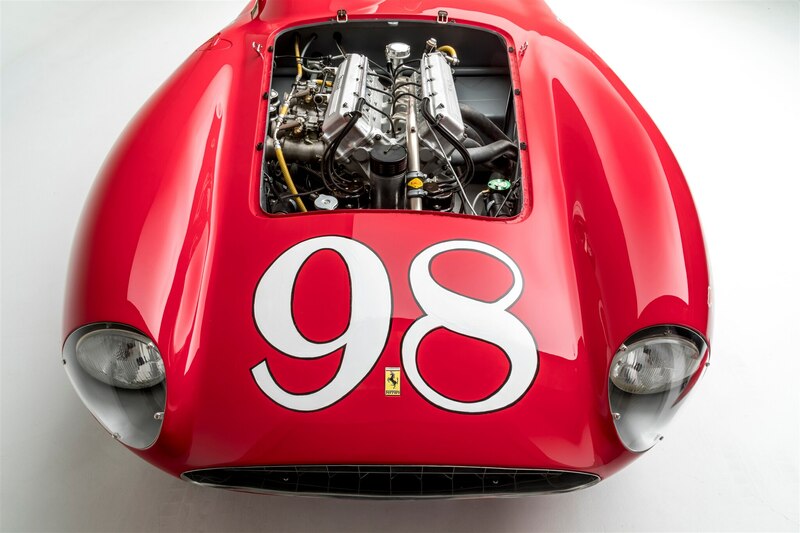 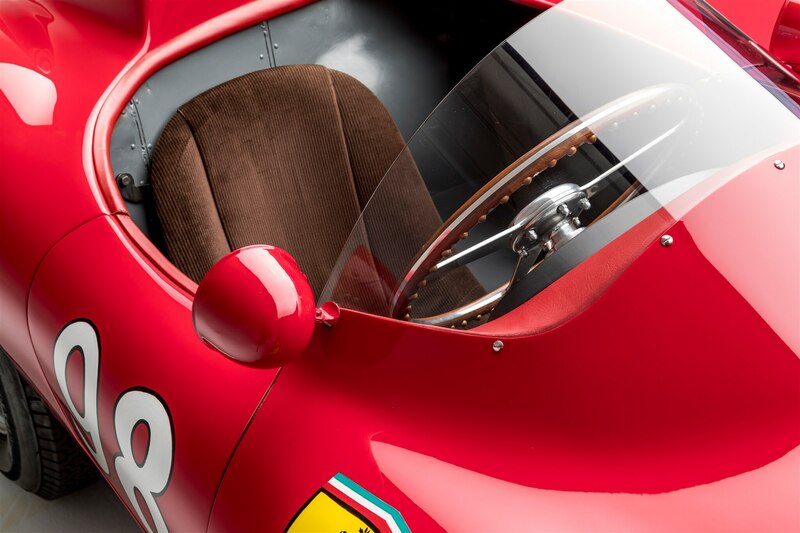 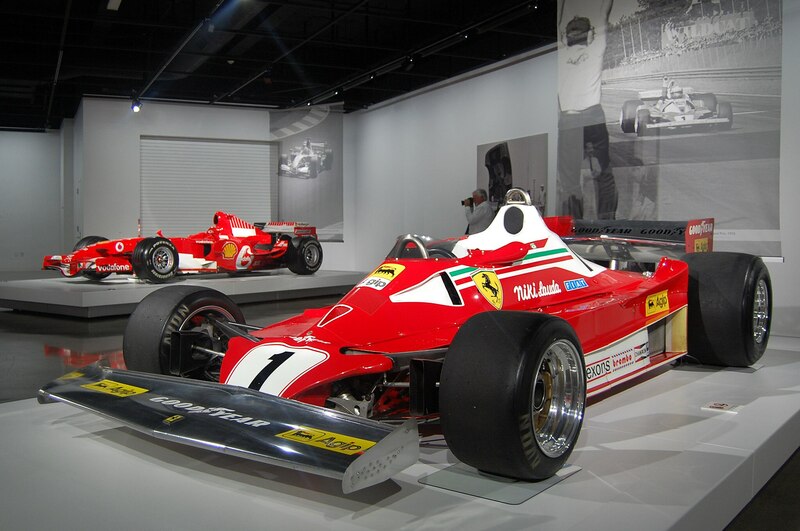 The opening of “Seeing Red: 70 Years of Ferrari,” the latest exhibit at the famous Petersen Automotive Museum, had us falling in love with the Prancing Horse all over again. 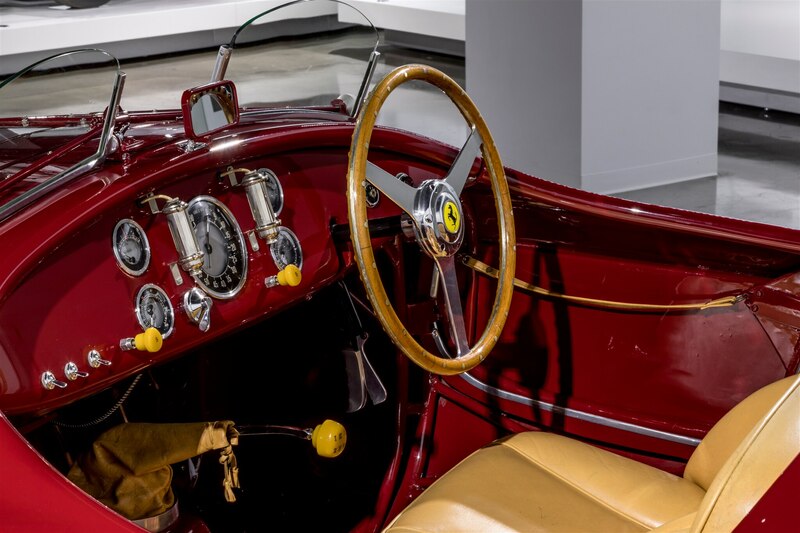 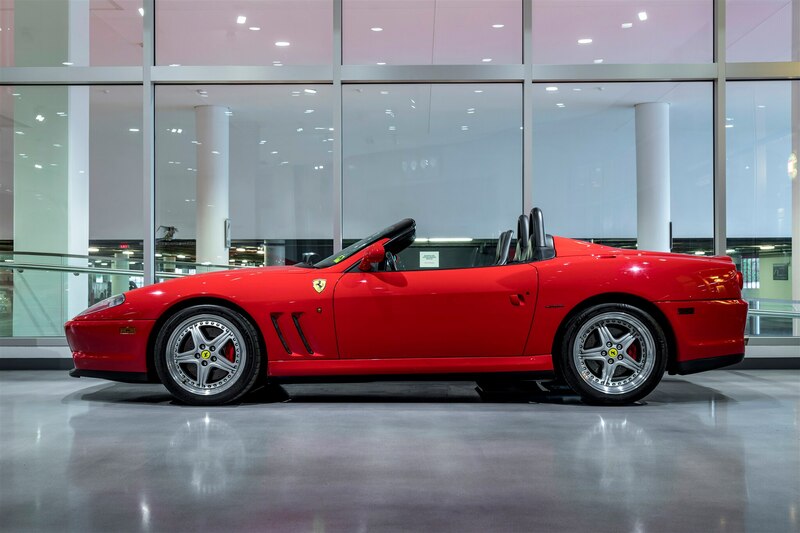 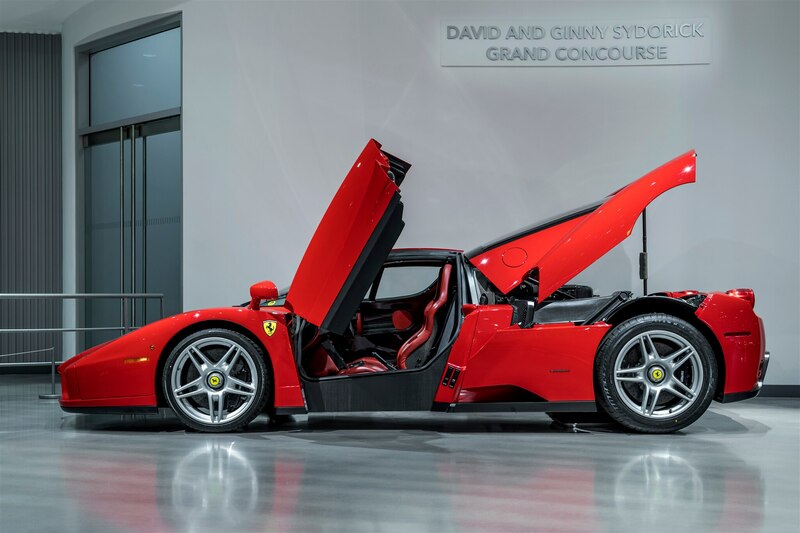 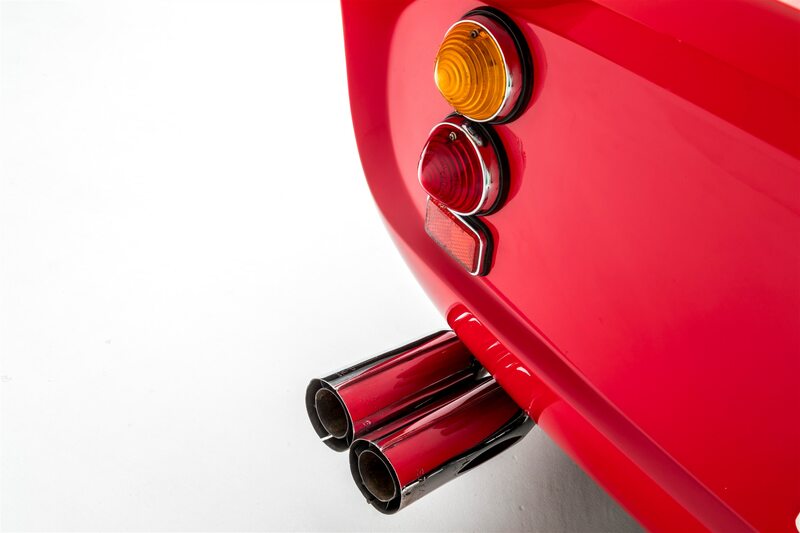 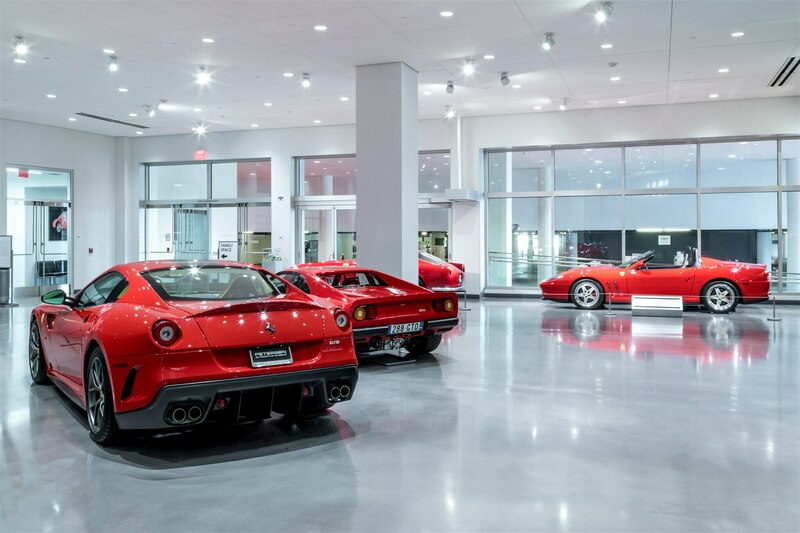 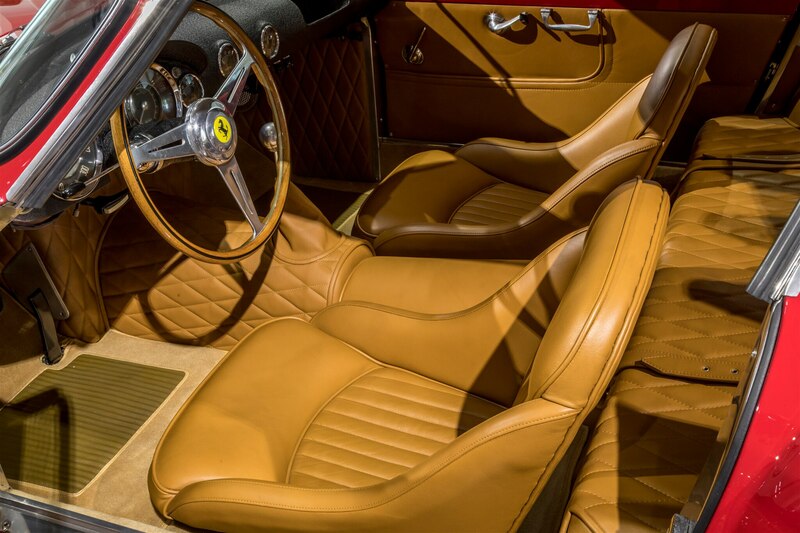 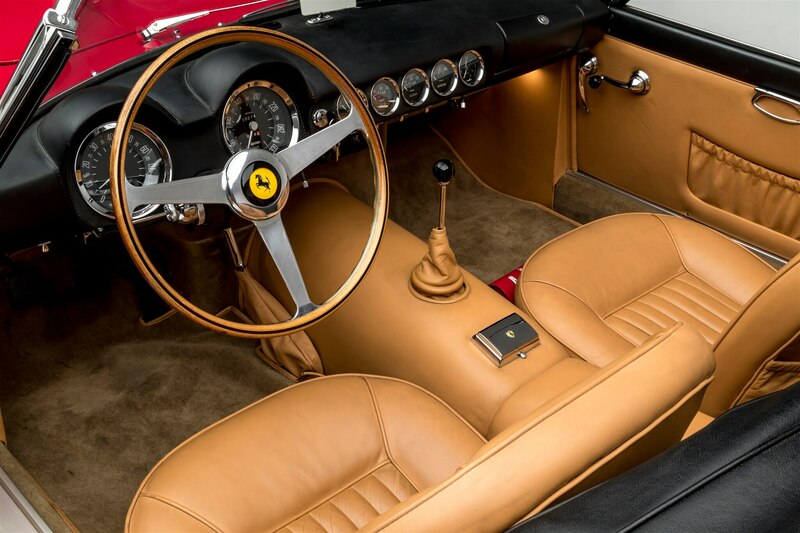 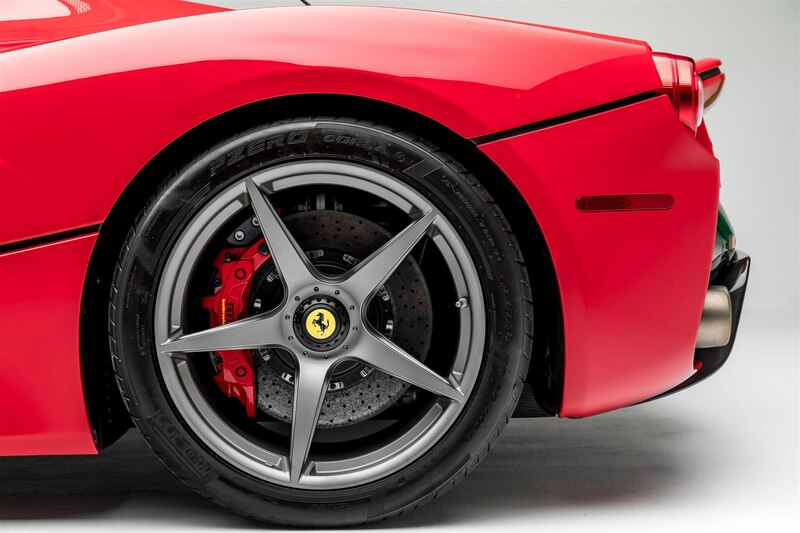 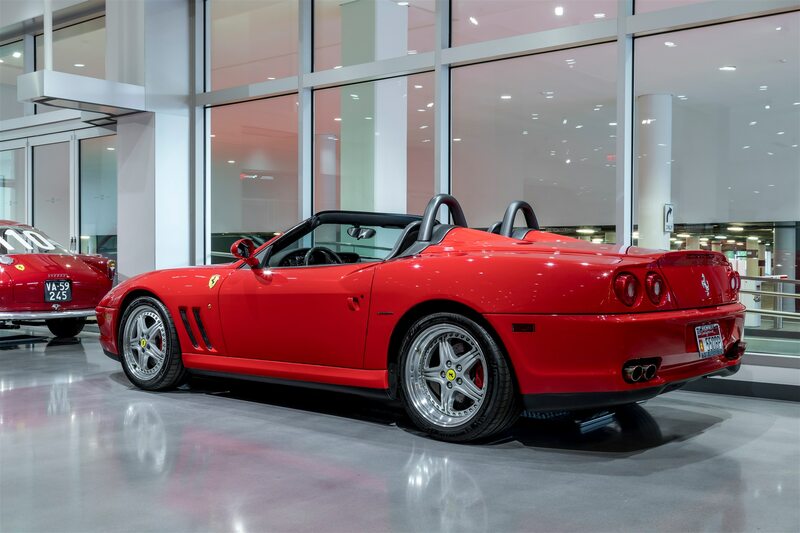 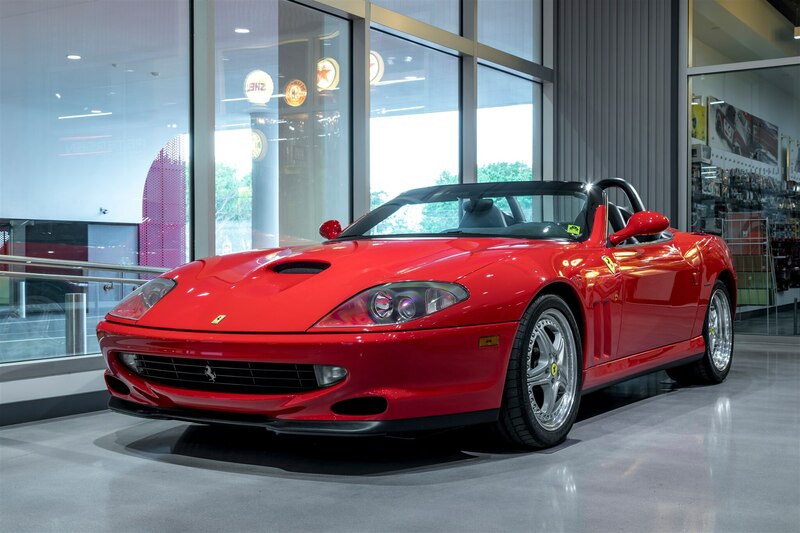 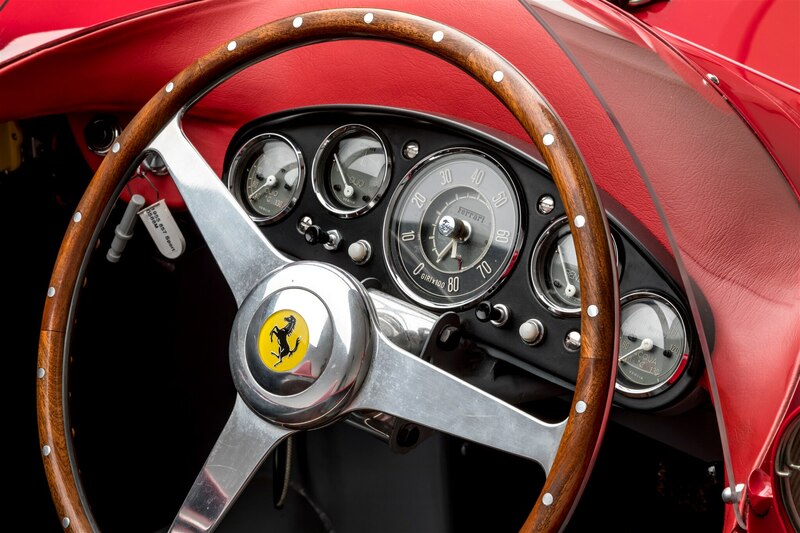 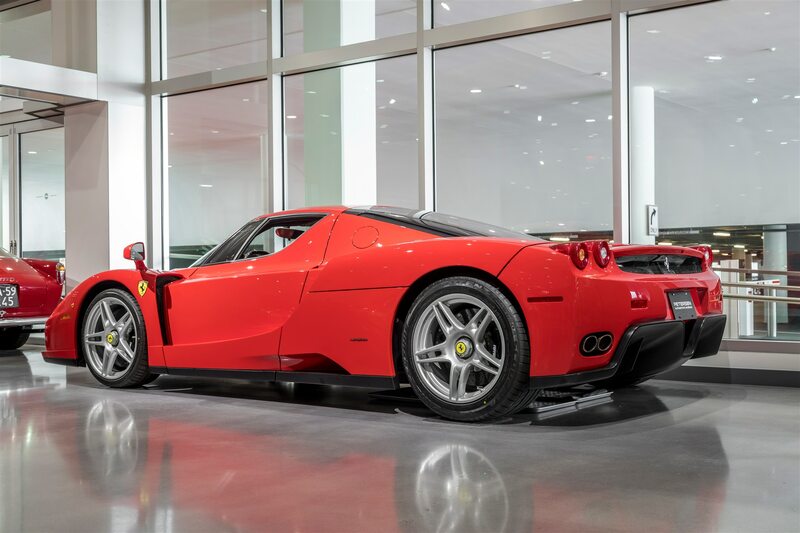 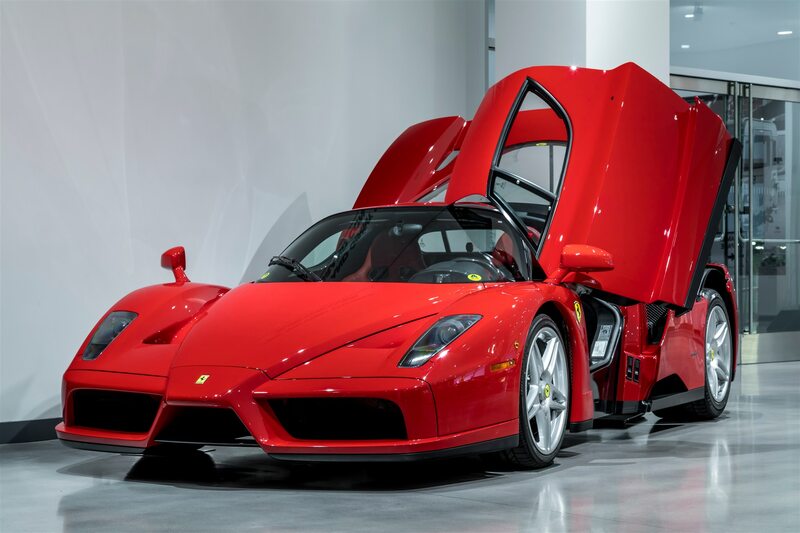 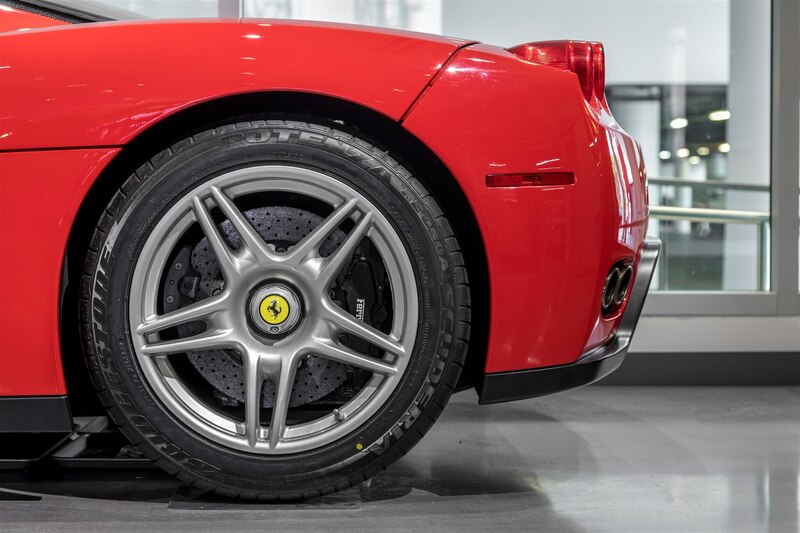 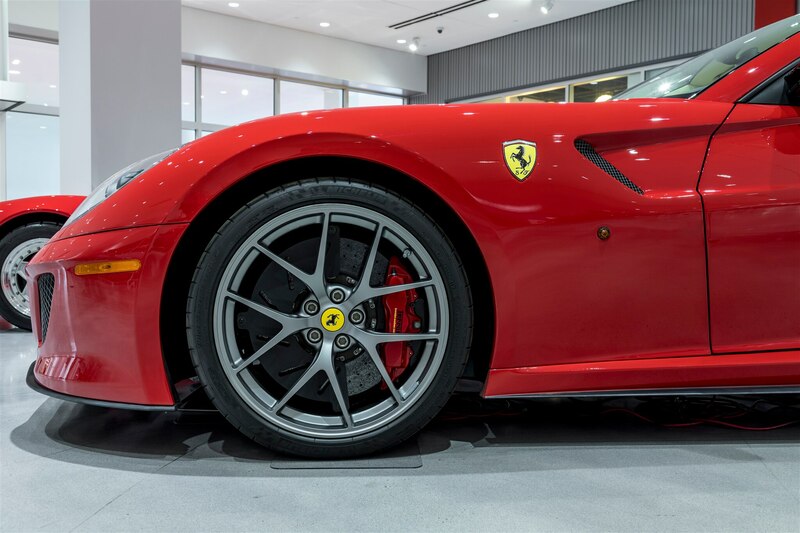 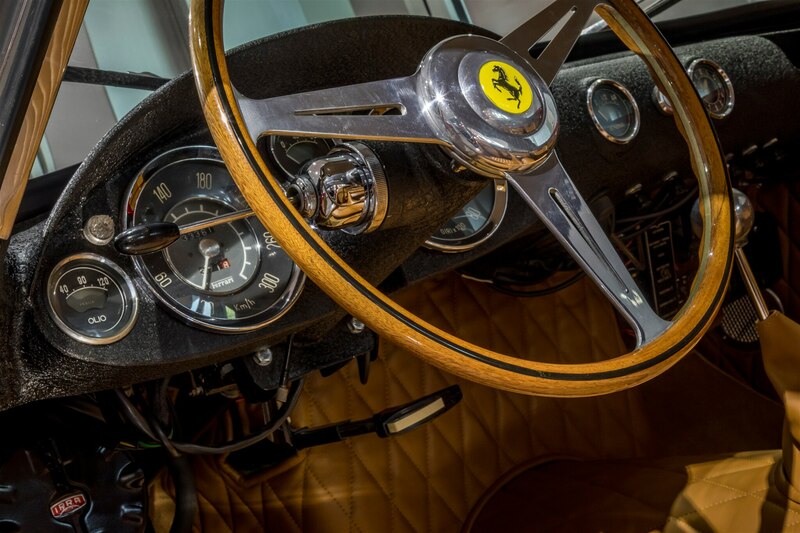 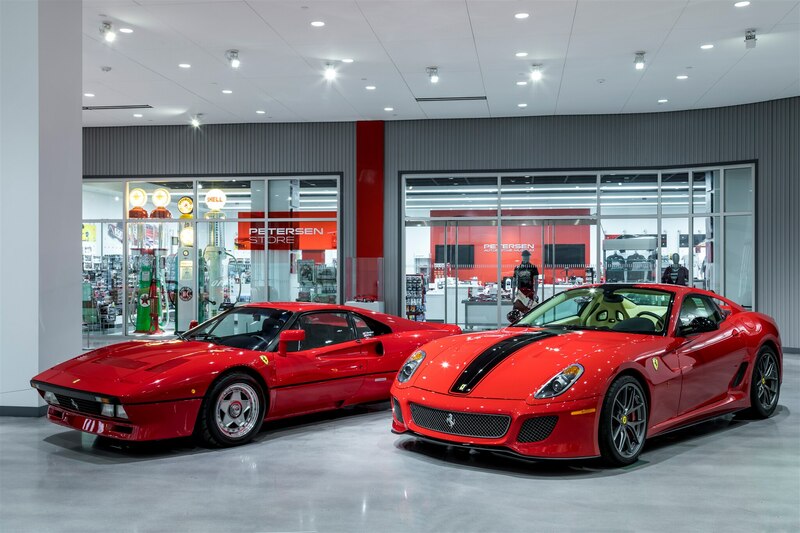 The collection highlights Ferrari’s passion for elegance, excellence, and purpose through 10 of the most spectacular and significant cars in the brand’s storied history. 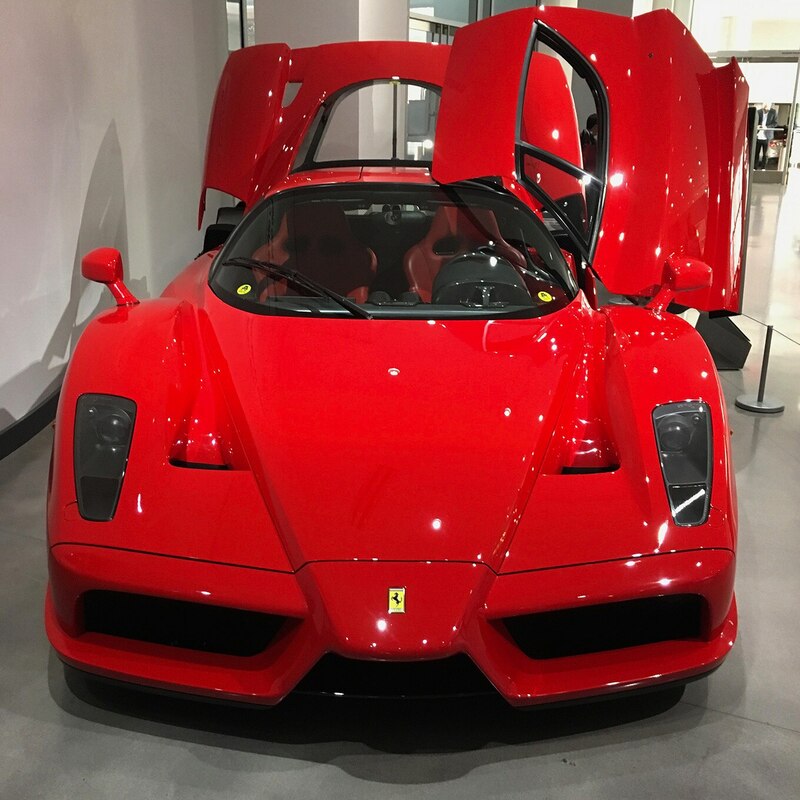 Here are eight of our favorite highlights and observations after seeing all that glorious red up close. 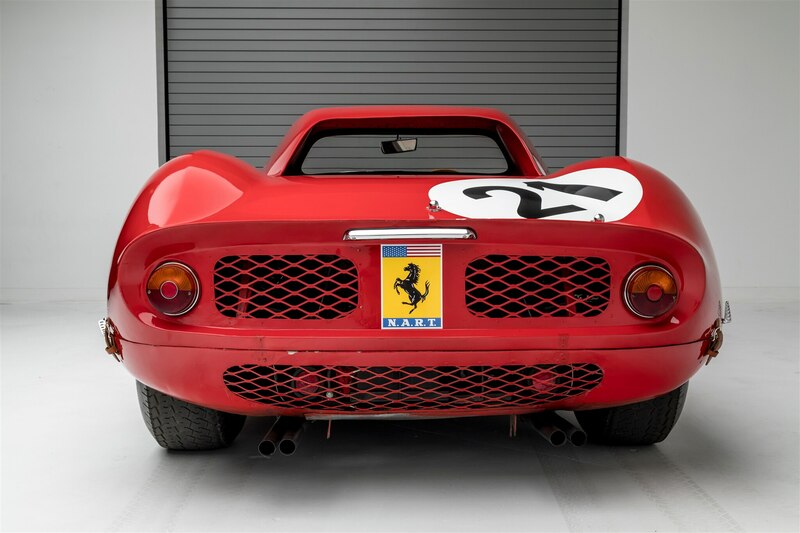 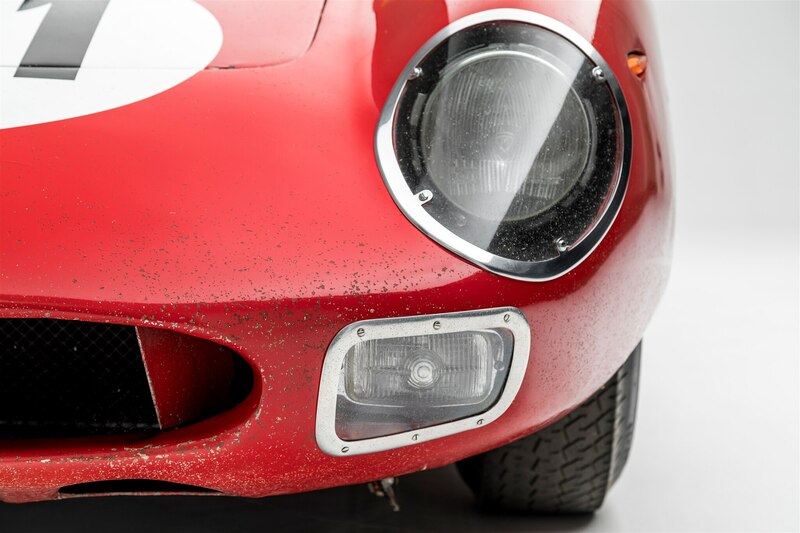 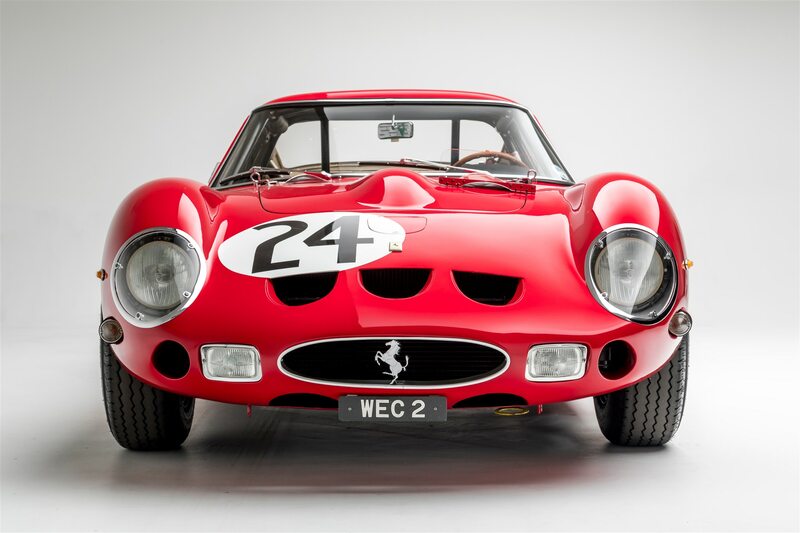 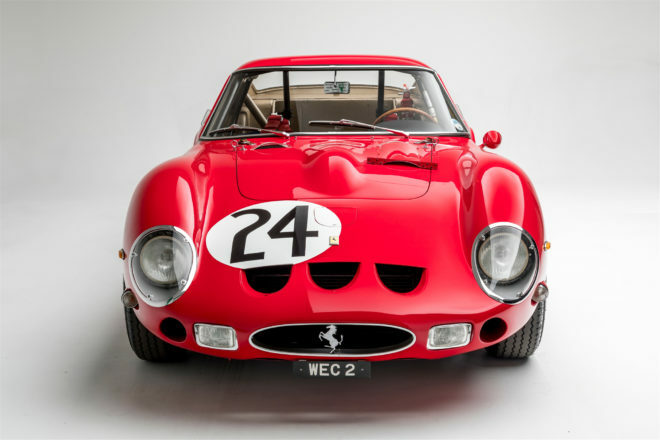 With a 3.0-liter V-12 that made 300 horsepower and catapulted the car down the Mulsanne Straight at 173 mph under its stylish Sergio Scaglietti-designed body, the 250 GTO did precisely what Enzo Ferrari intended it to do — smoke the competition. 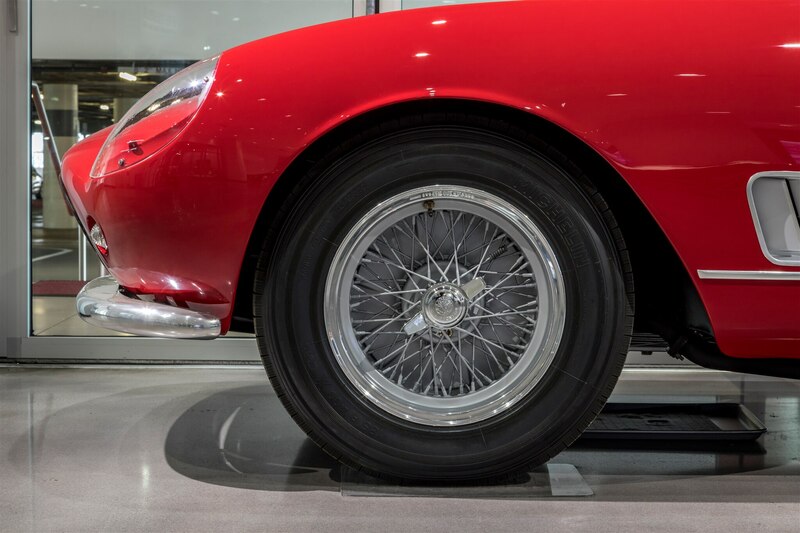 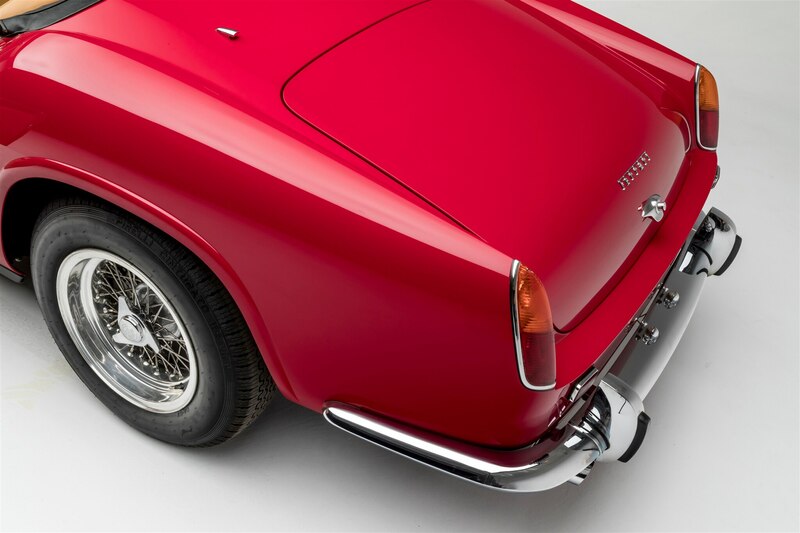 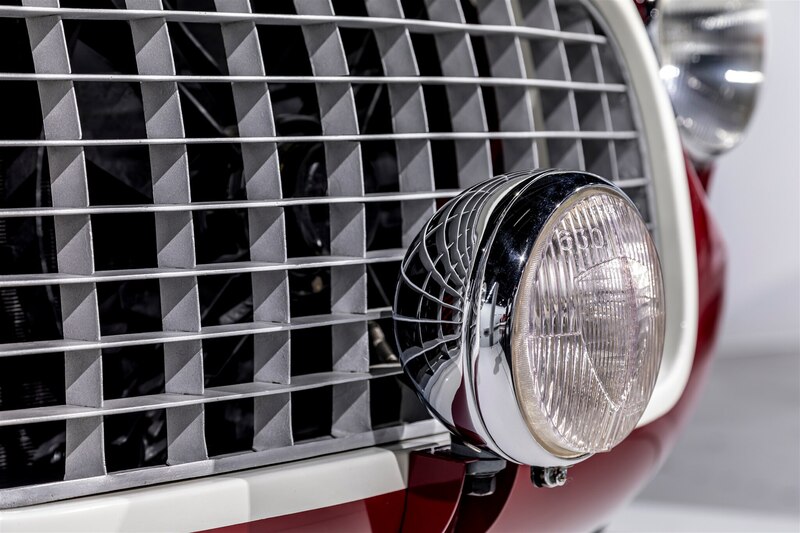 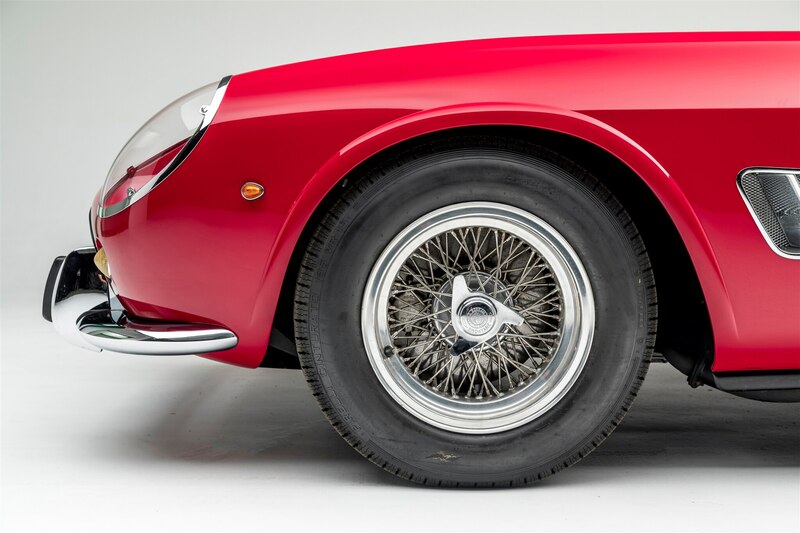 The 250 GT was initially engineered by Giotto Bizzarini, but mechanical work was completed by newcomer Mauro Forghieri after the infamous great walkout of 1961. 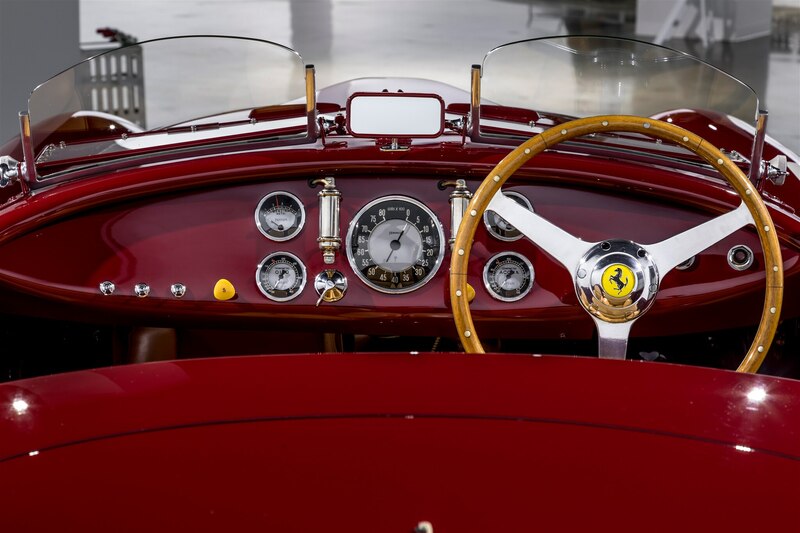 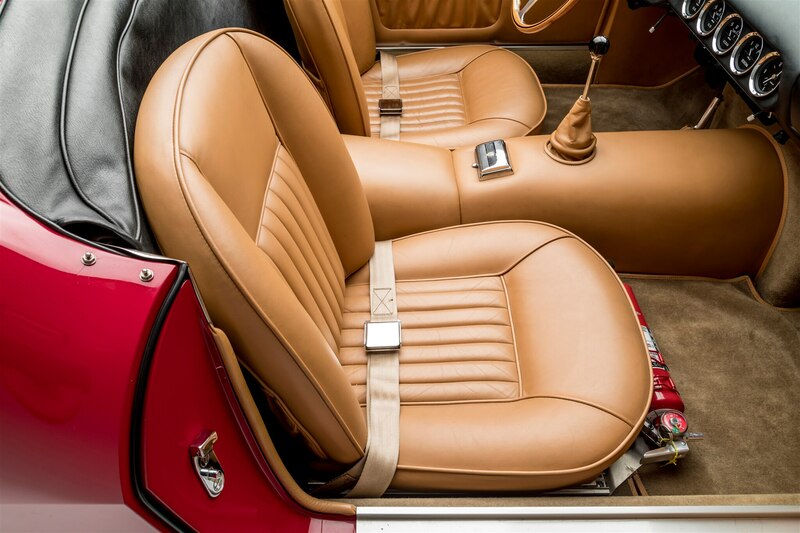 Only 39 examples of this “production” car were made, making it one of the most desirable automobiles in history. 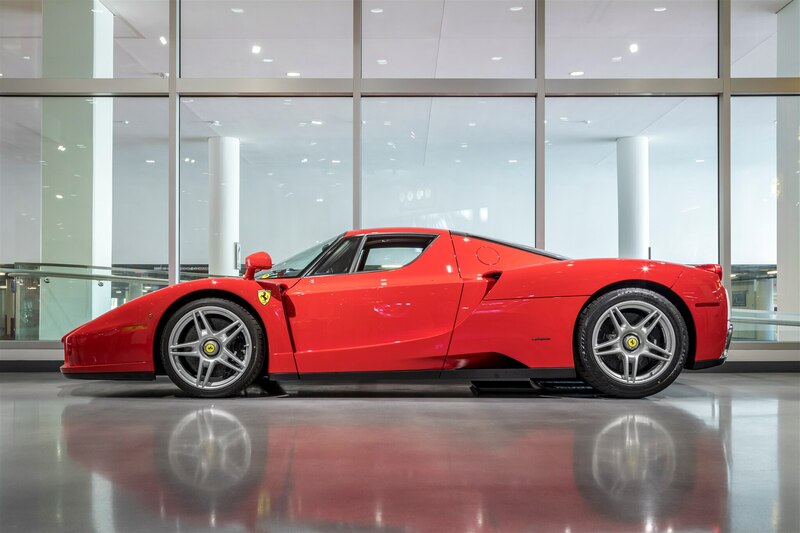 It’s not impossible to get your hands on one, but save your ducats because the last one to sell at auction went for a cool $38.1 million. 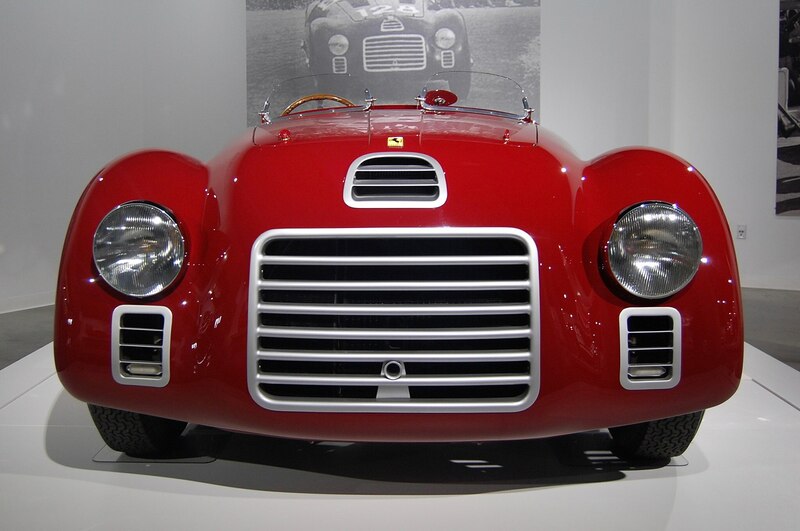 The 125 S was the first car to bear the Ferrari name. 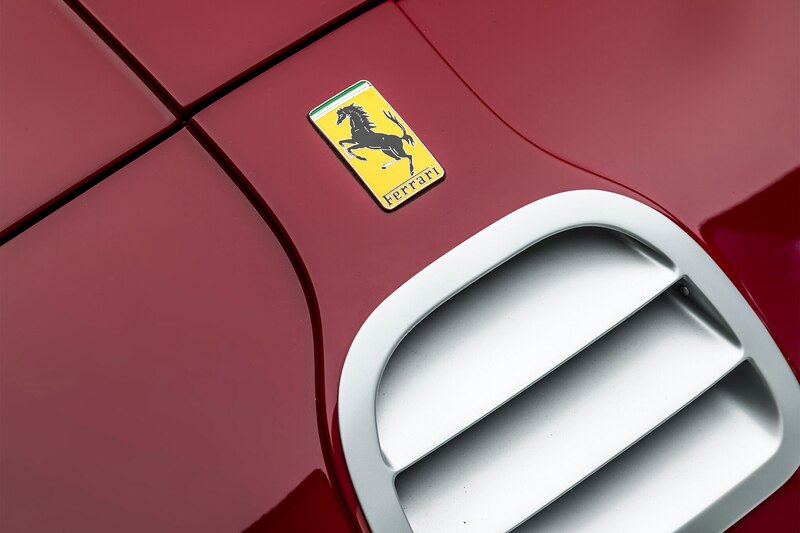 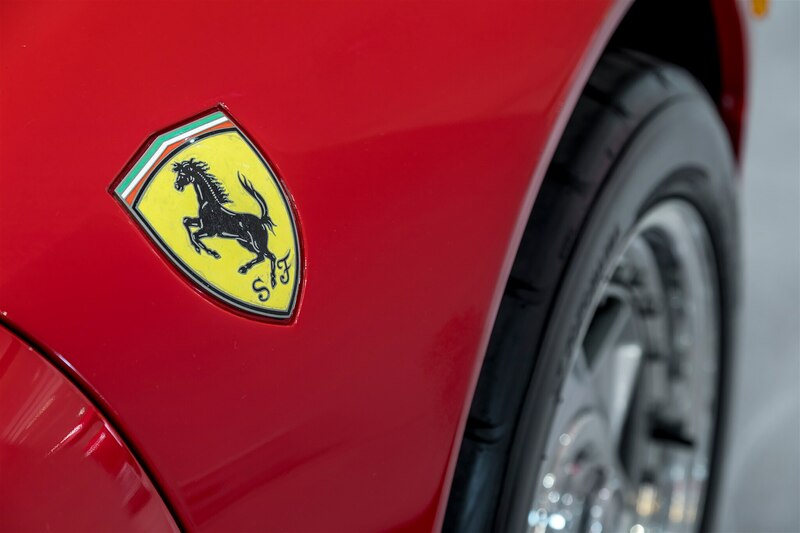 It’s also the first to don the Cavallino Rampante (“Prancing Horse”) badge. 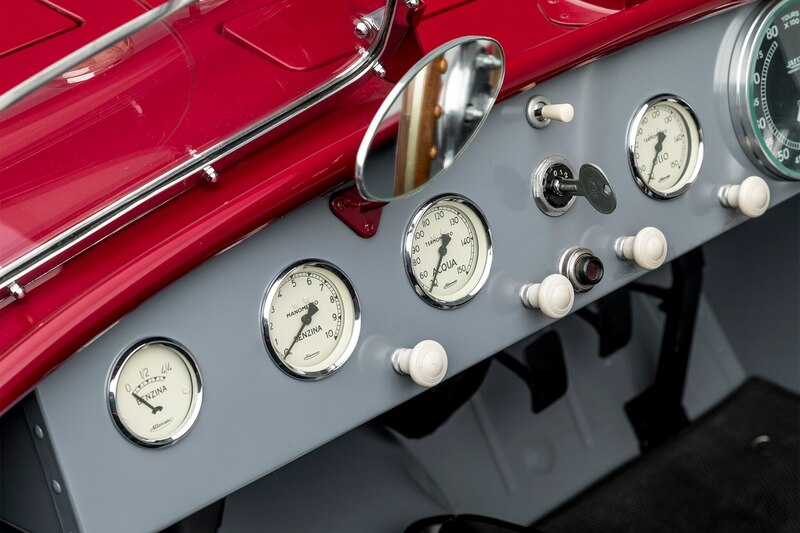 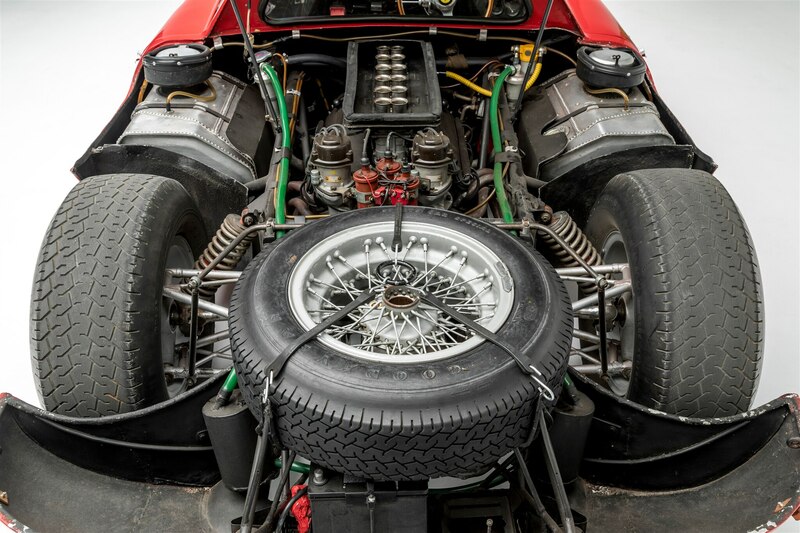 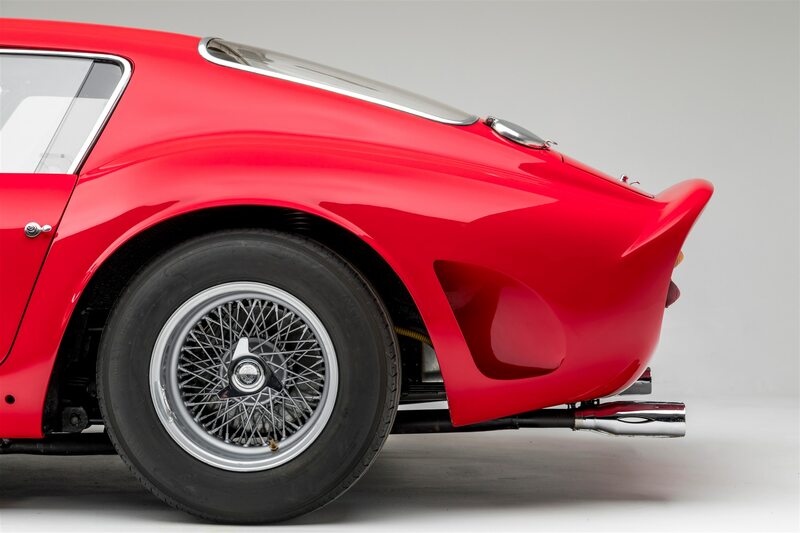 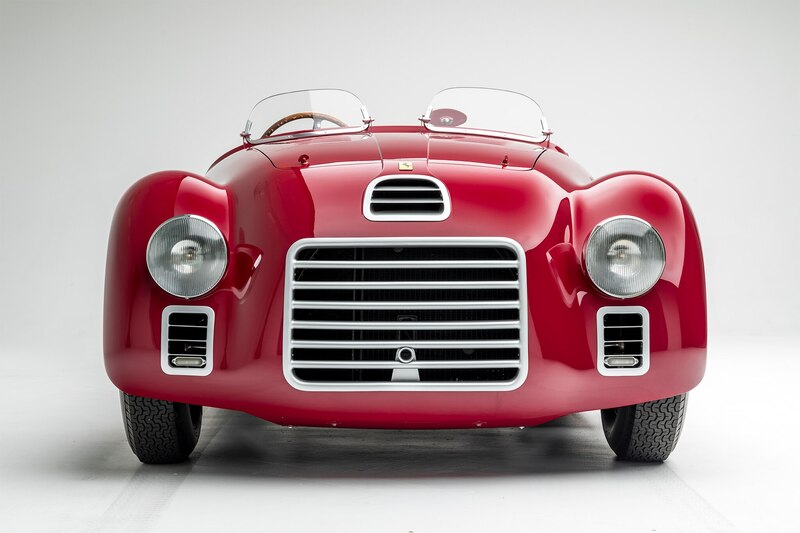 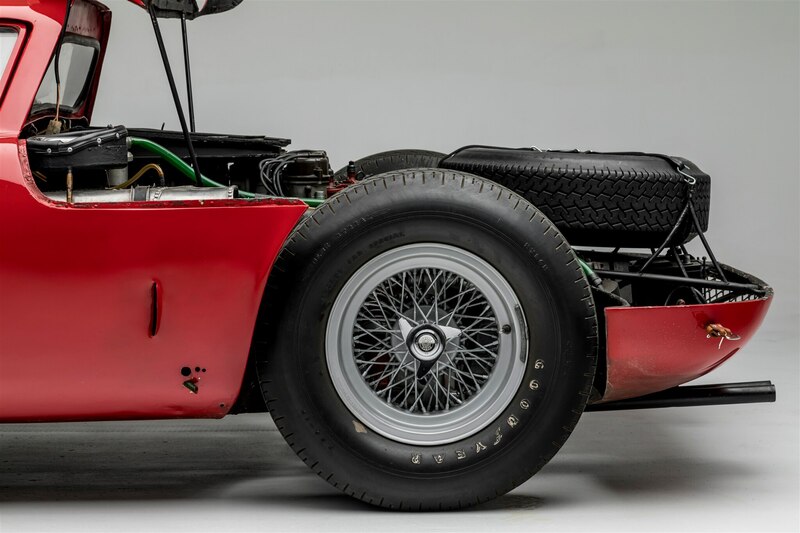 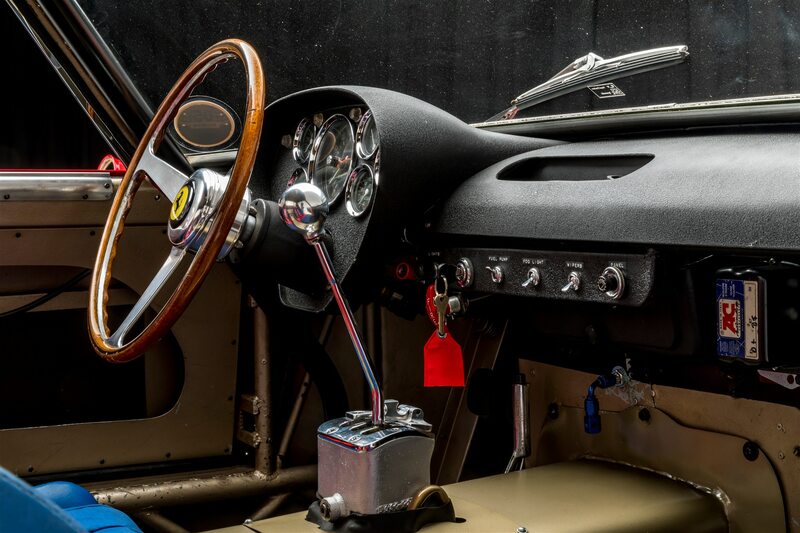 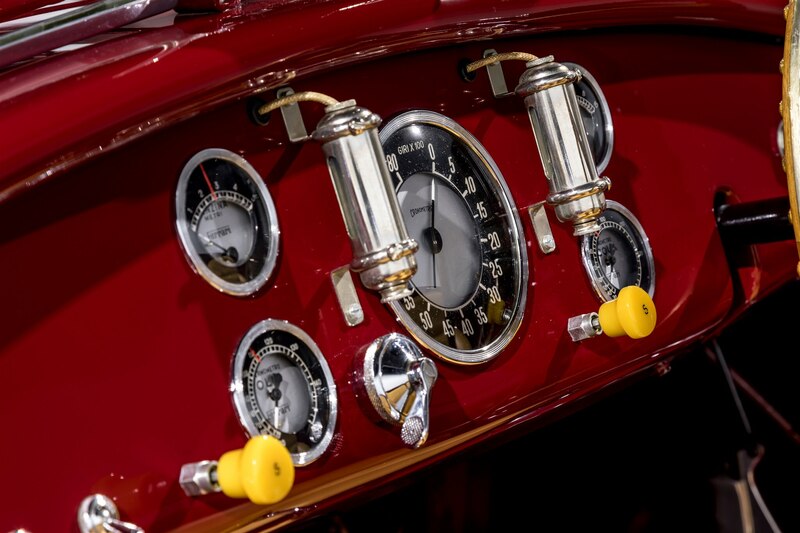 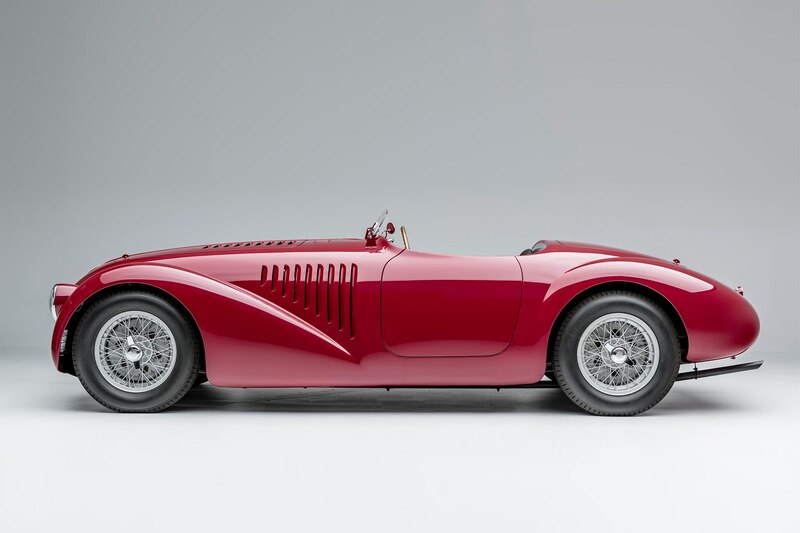 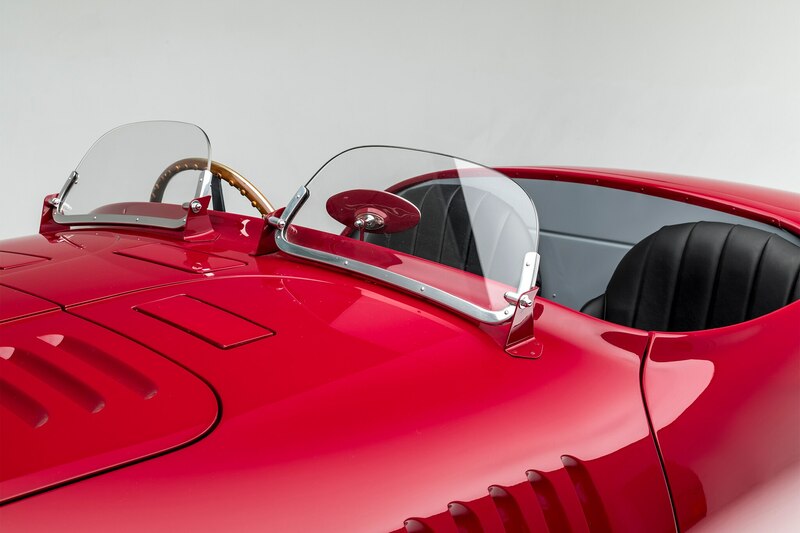 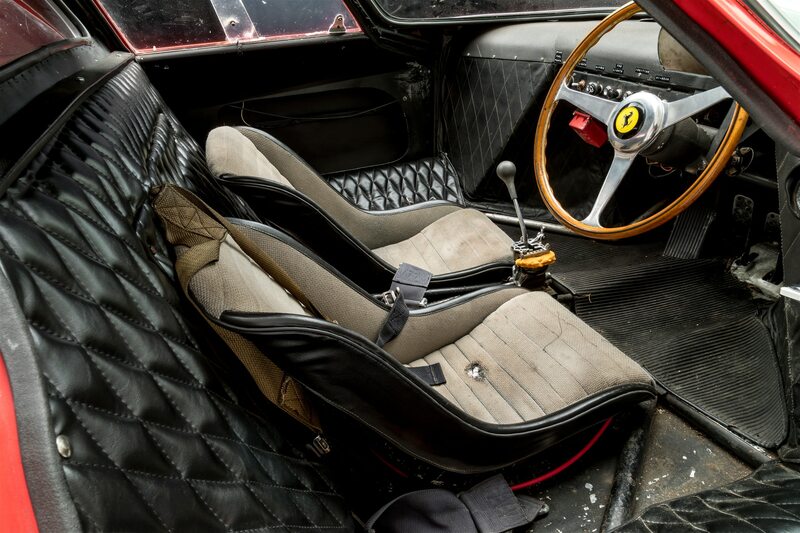 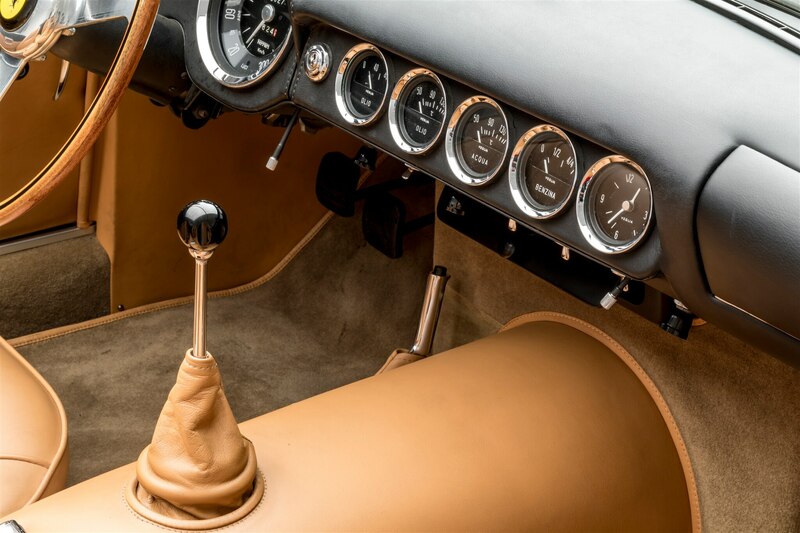 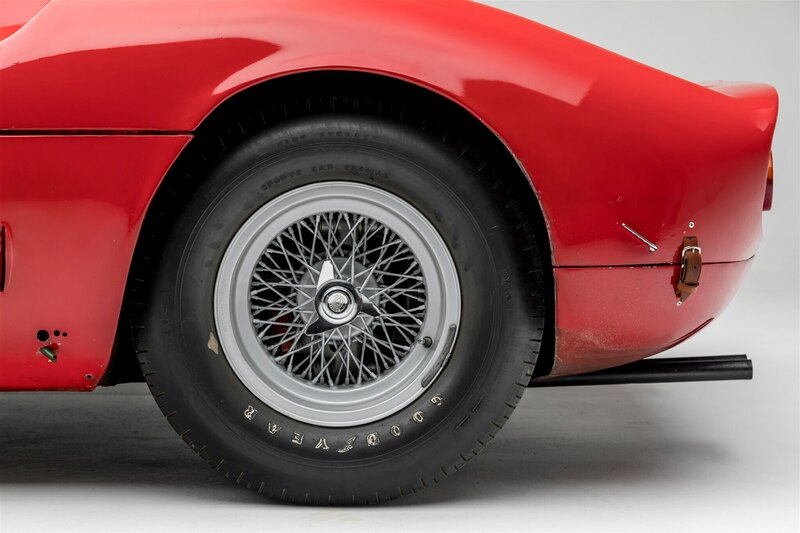 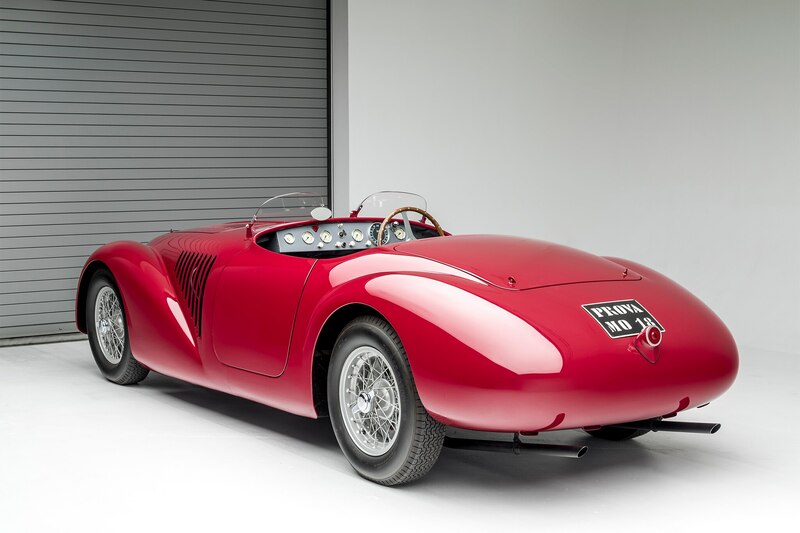 Built to compete in the 1947 Piacenza Circuit race, it was also the first car to be equipped with what would become a Ferrari staple — a 12-cylinder engine. 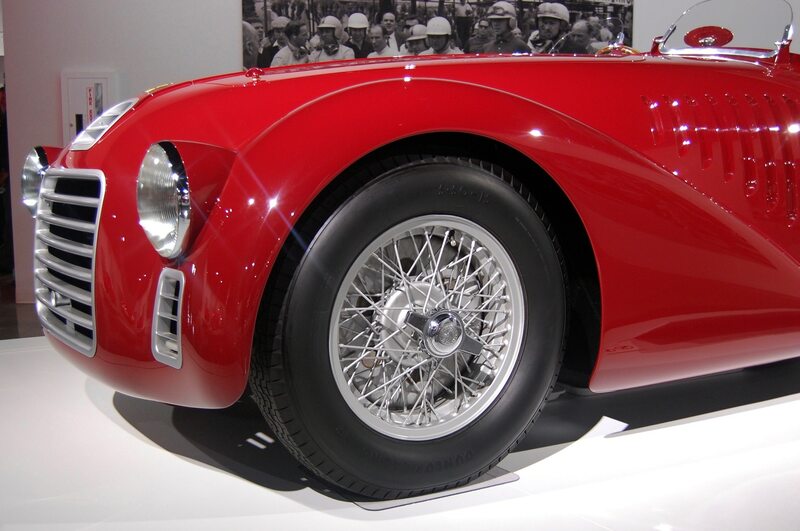 Though the 125 S reached a top speed of 130 mph, it didn’t finish the Piacenza race. 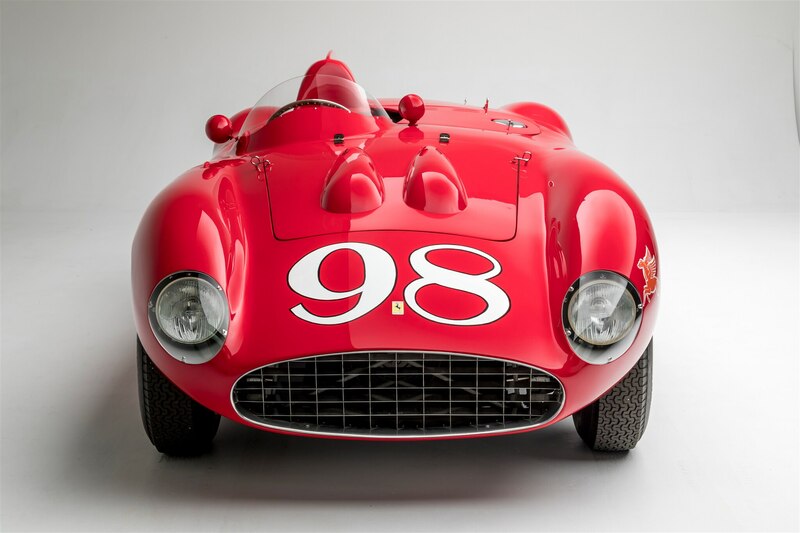 Despite the disappointing result, Ferrari himself considered it “a promising failure.” We sure are happy young Enzo kept his day job. 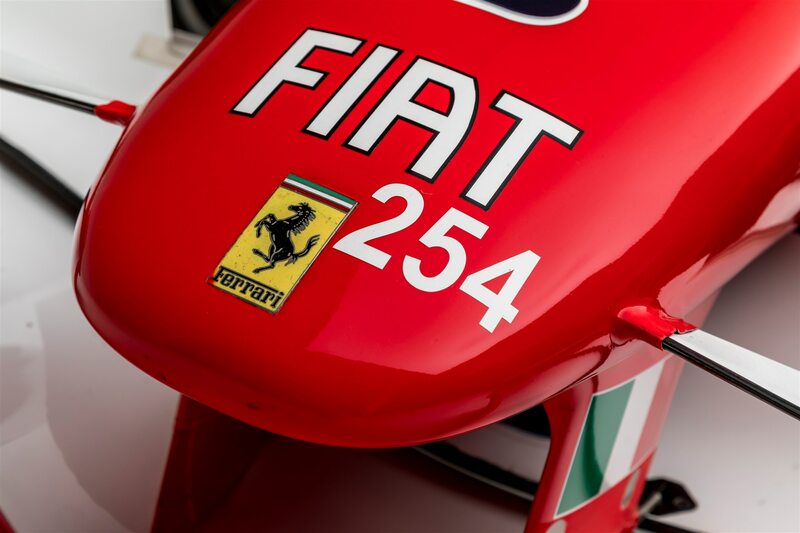 The 125 S went on to claim victory in Rome at the Terme di Caracalla circuit, a result that helped the Ferrari name become synonymous with winning. 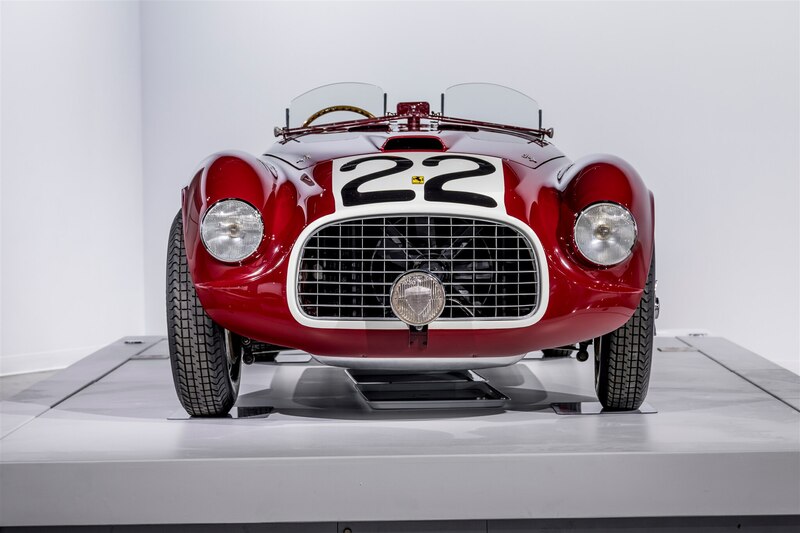 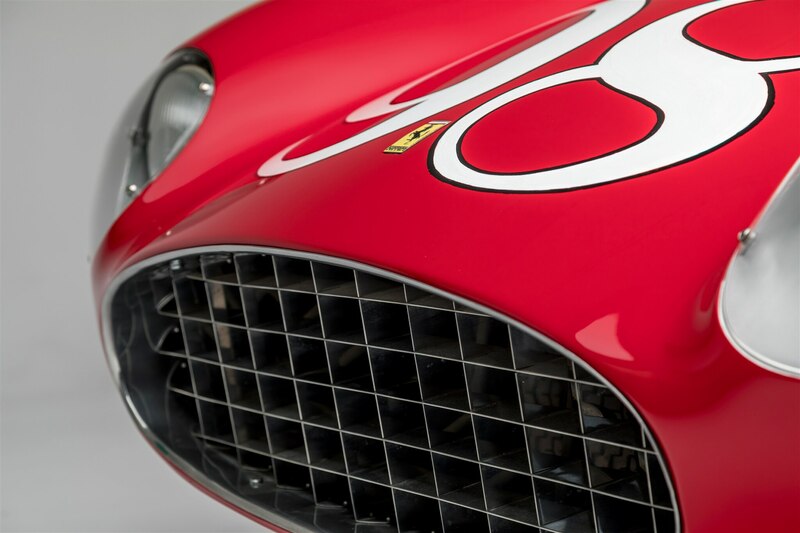 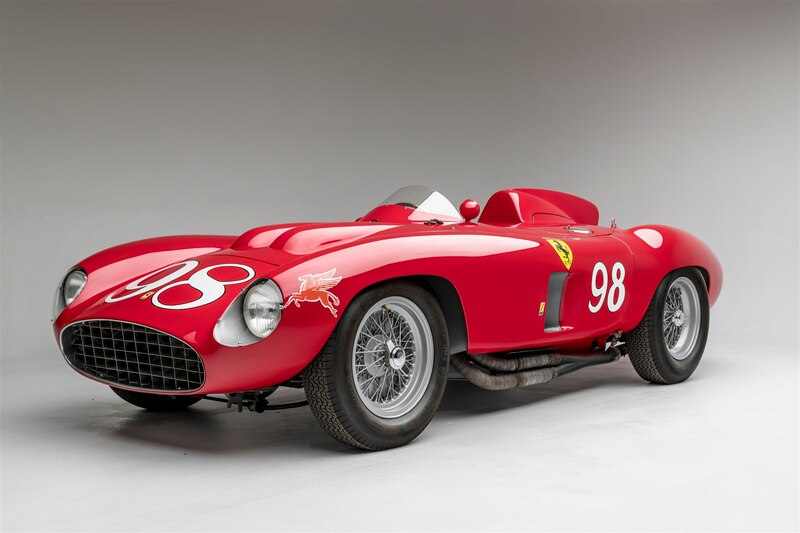 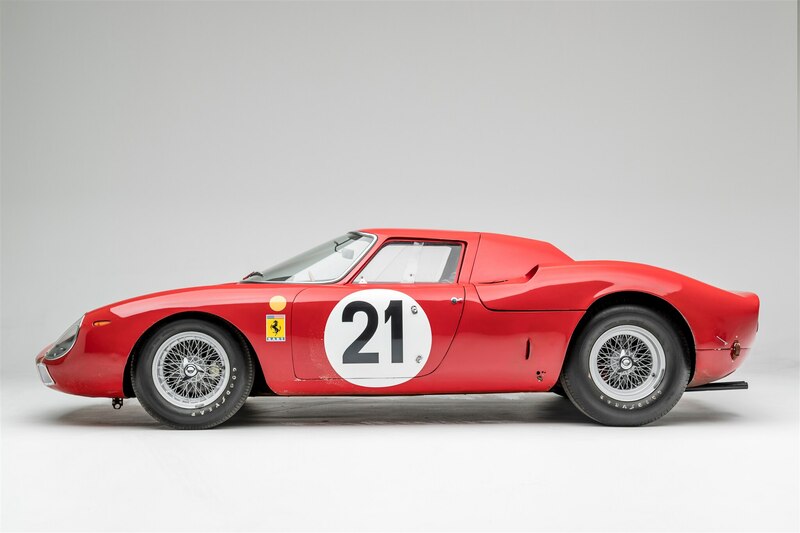 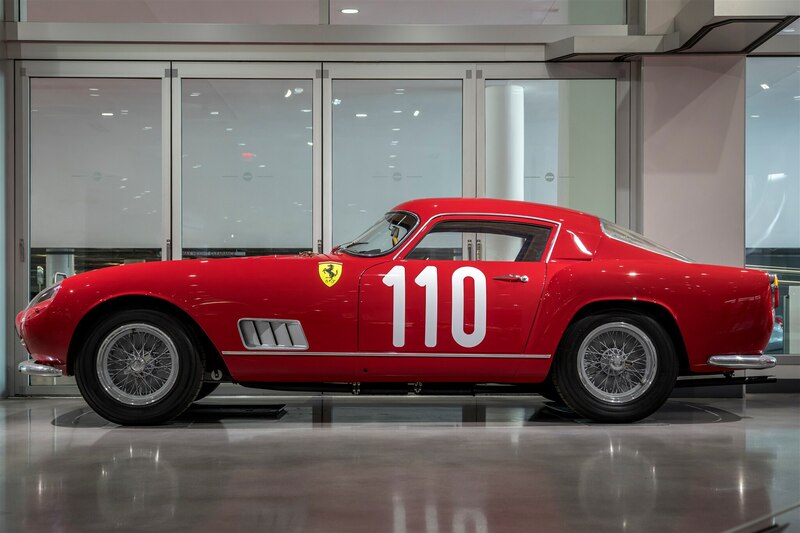 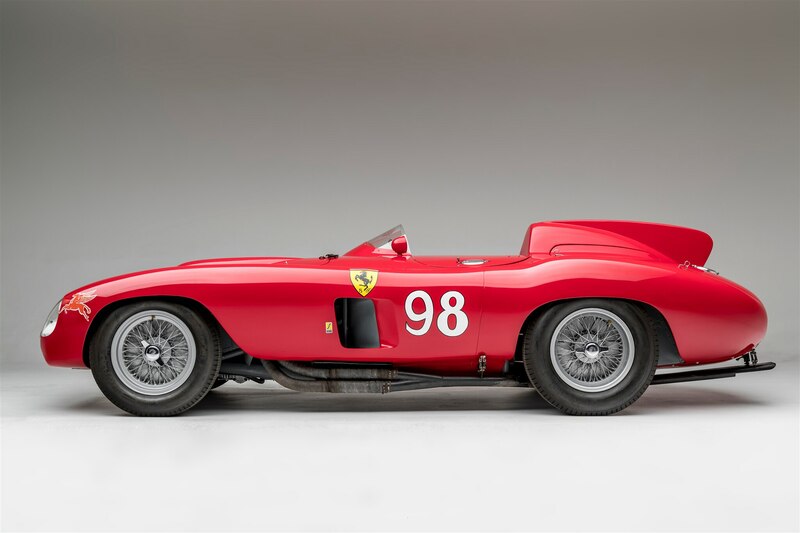 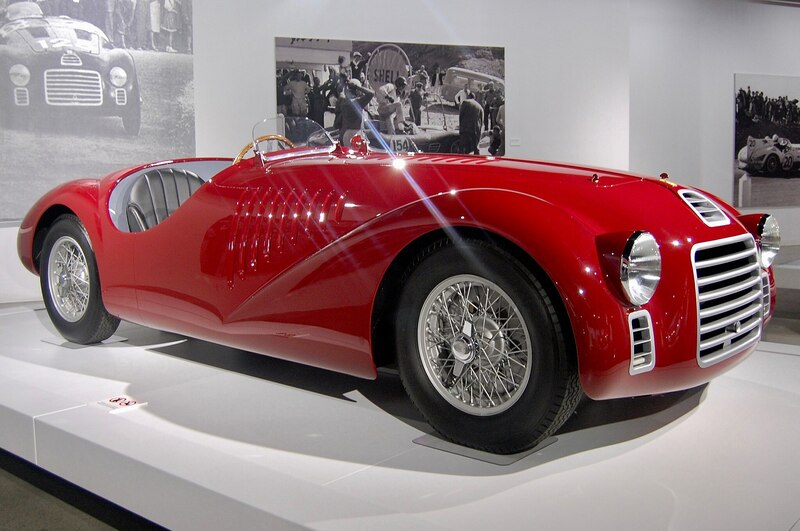 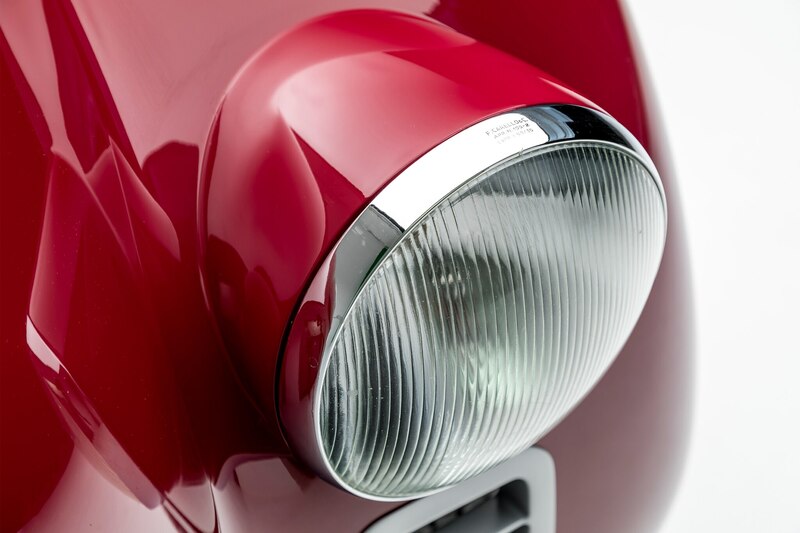 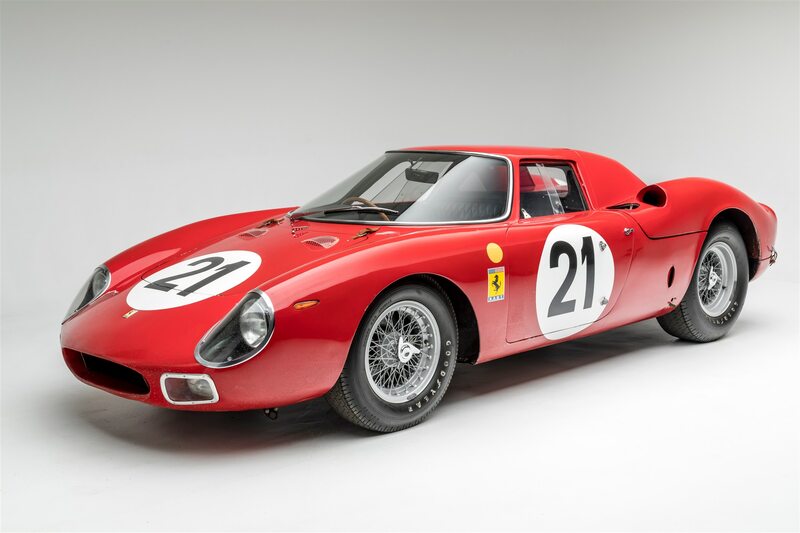 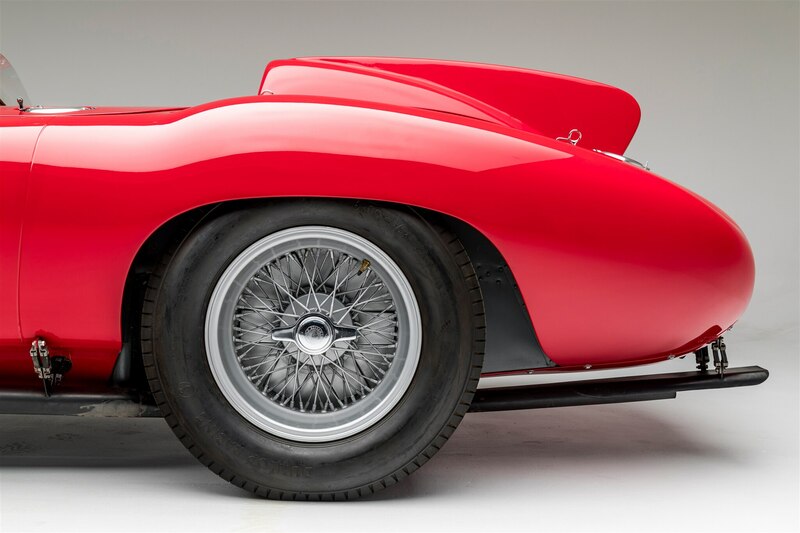 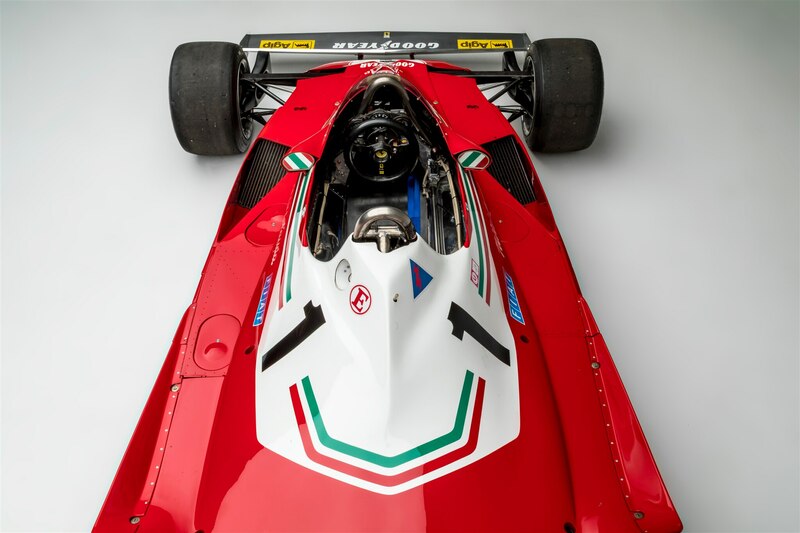 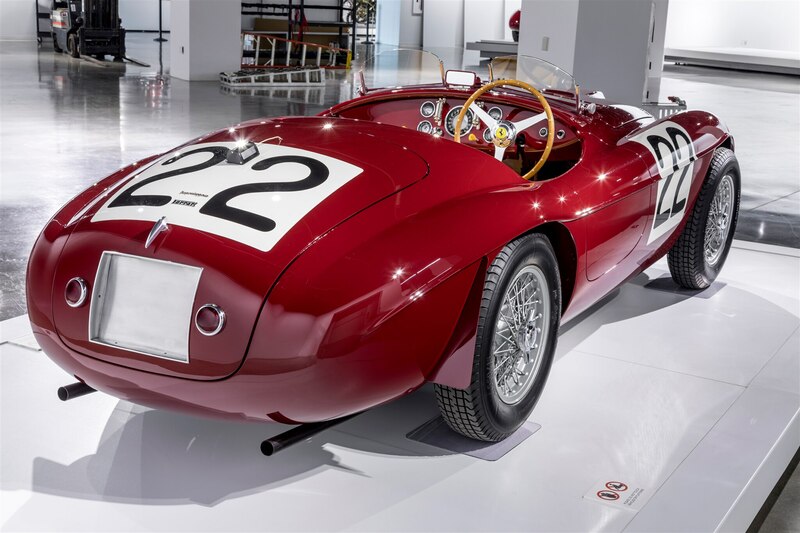 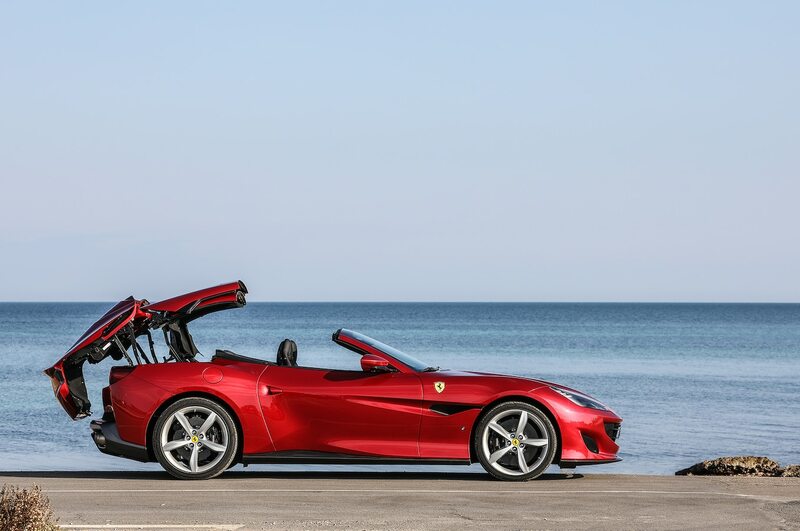 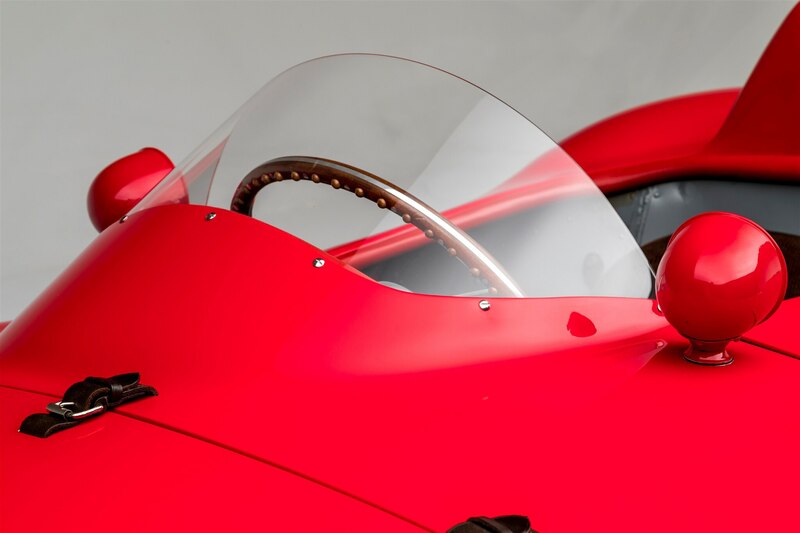 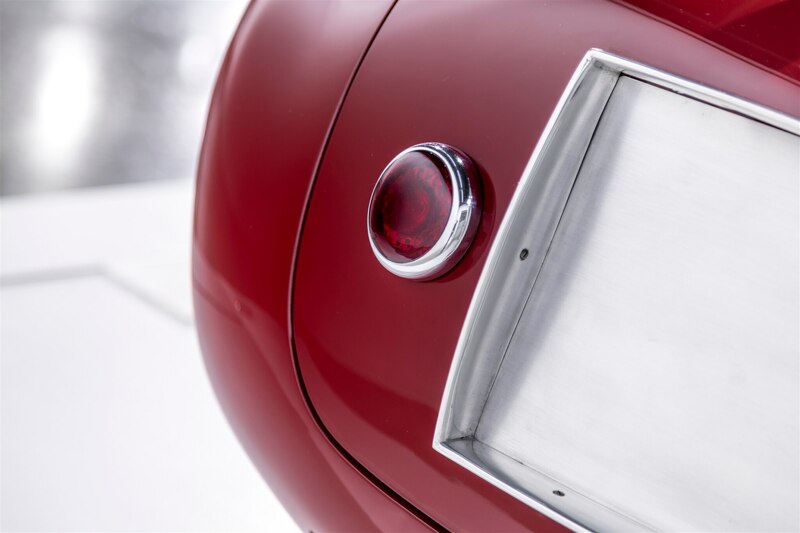 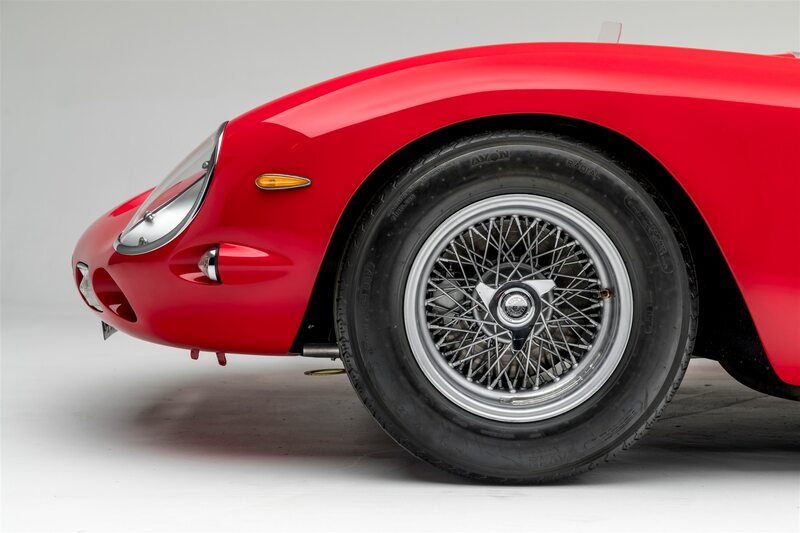 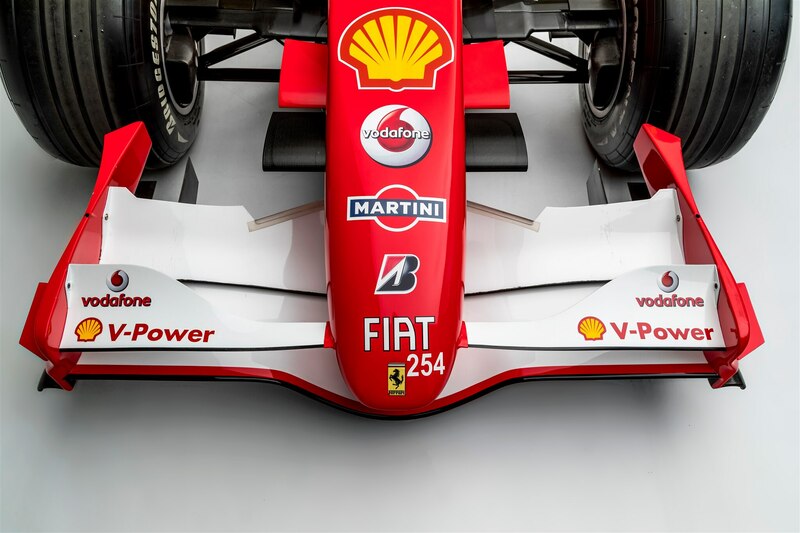 Since only two examples of the 125 S were made, this exhibit is likely the best opportunity mere mortals will have to see the Ferrari of firsts in person. 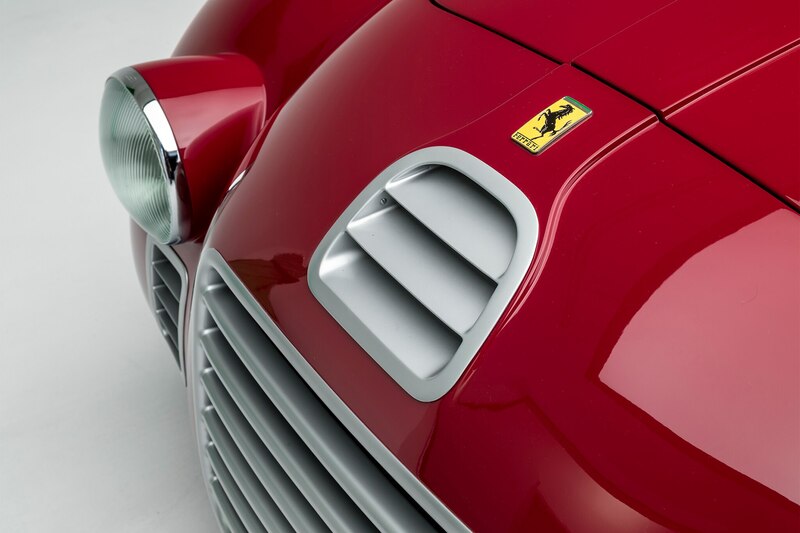 If you do, let us know what you think of the grille, which while beautiful, looks oddly like it’s made of plastic up close. 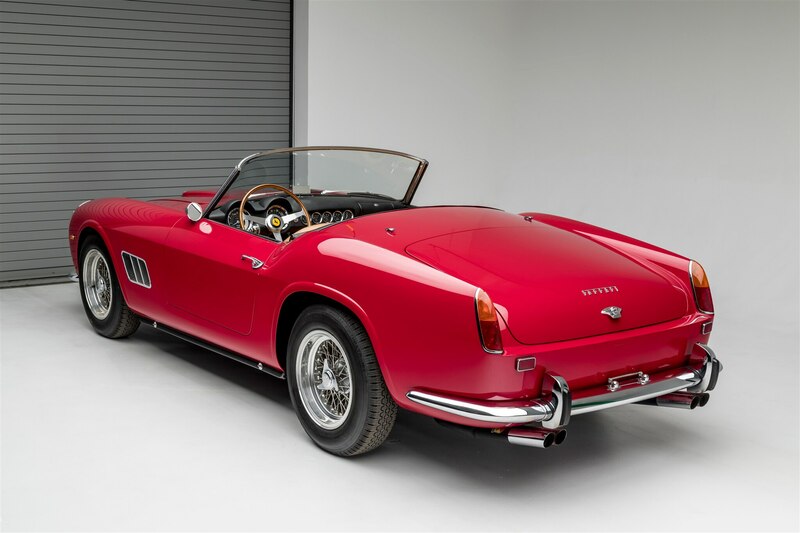 In 1957, Ferrari’s U.S. West Coast representative John von Neumann made the initial proposal for this Pininfarina-styled cabriolet. 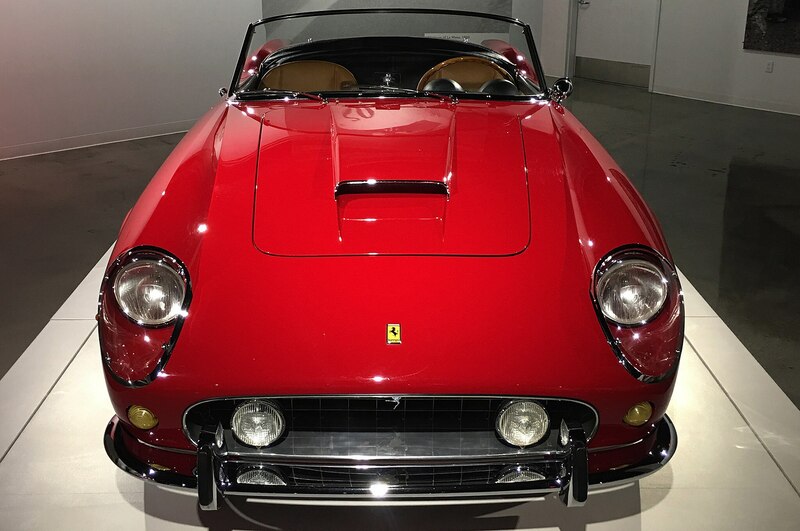 He was of the opinion that wealthy Californians would be interested in driving an elegant, expensive convertible. 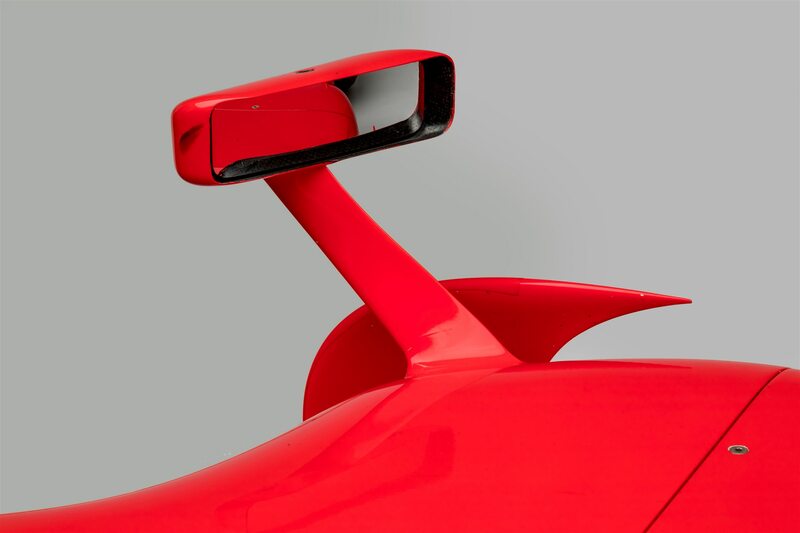 What a concept! 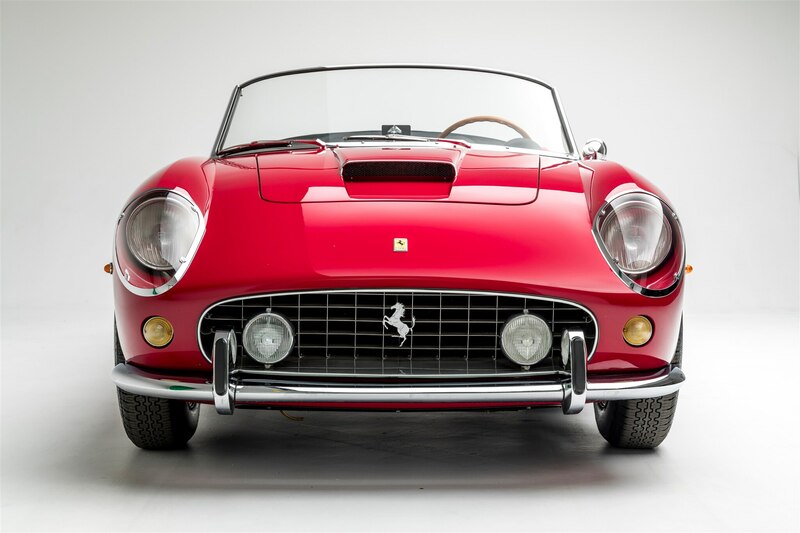 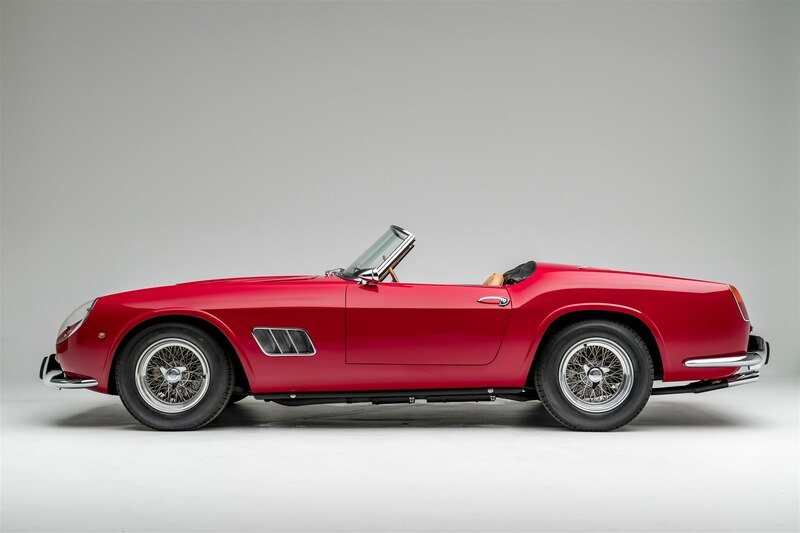 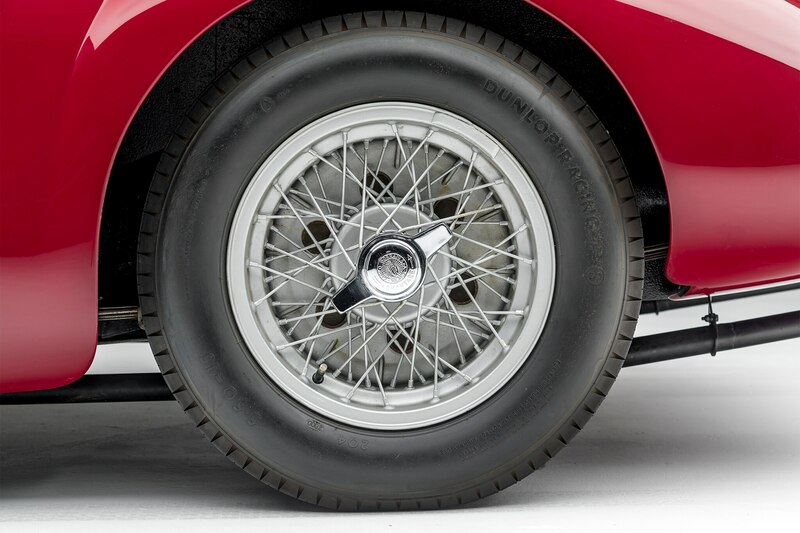 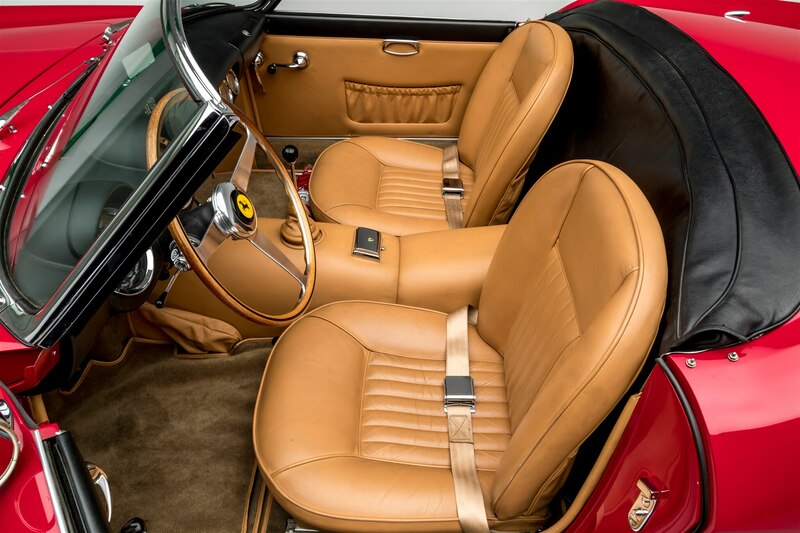 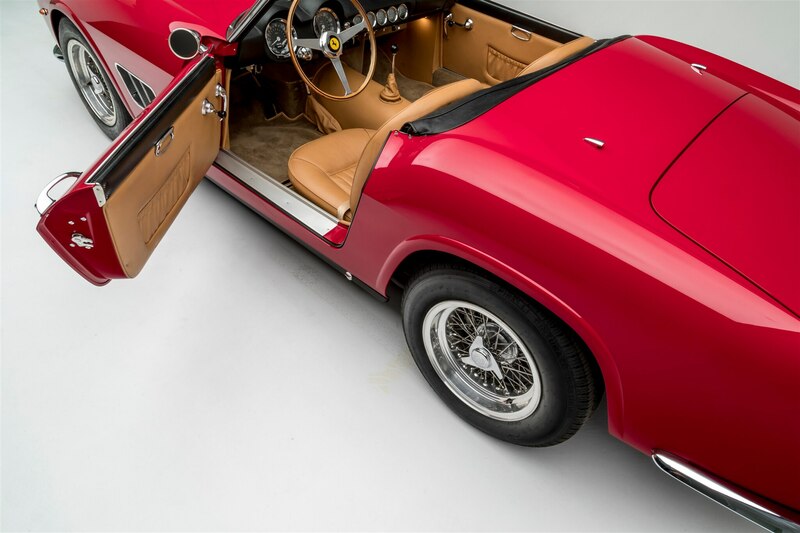 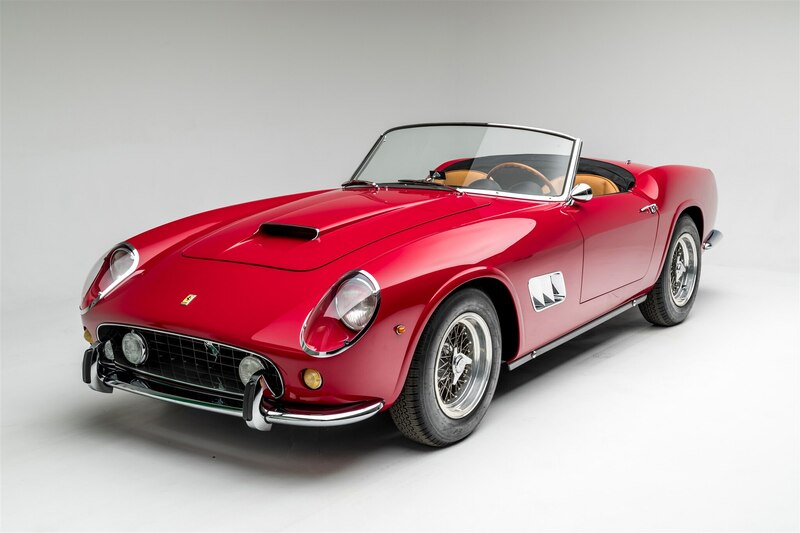 Production of the 250 GT California Spyder began that same year with a long wheelbase model. 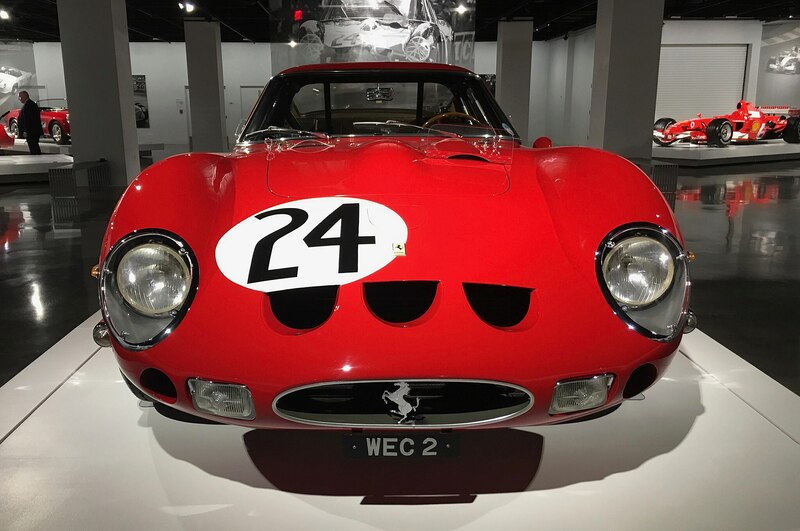 The model on display at the Petersen is the shorter — and much better-looking, at least to us — car built from 1960-’62, of which only 56 were made. 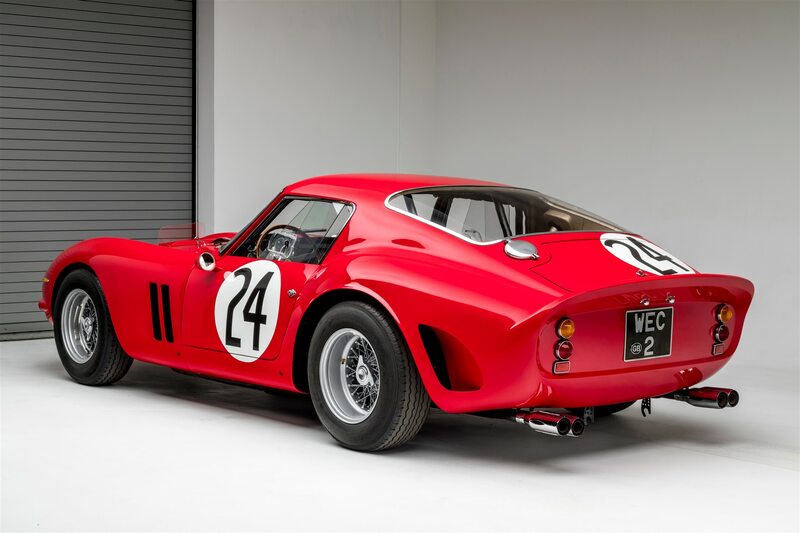 The short wheelbase provided the car with a more solid stance and improved its acceleration and handling. 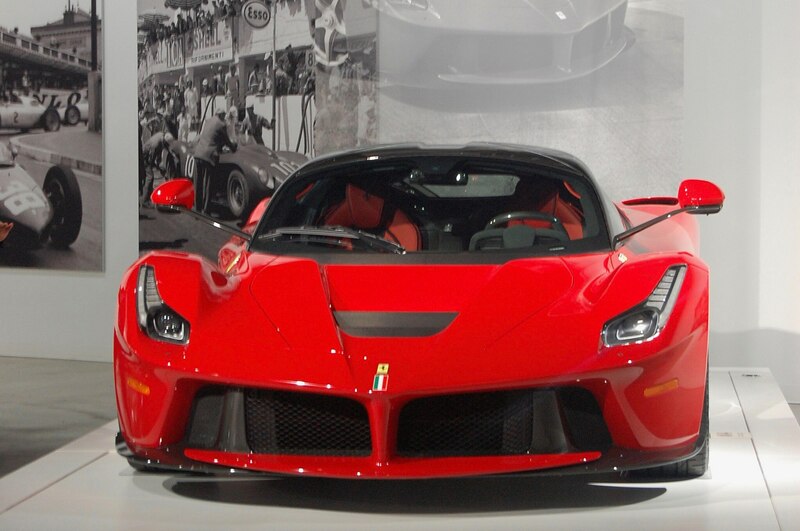 Translated literally, LaFerrari means “The Ferrari.” Sounds like someone in Maranello thinks this car is pretty good. 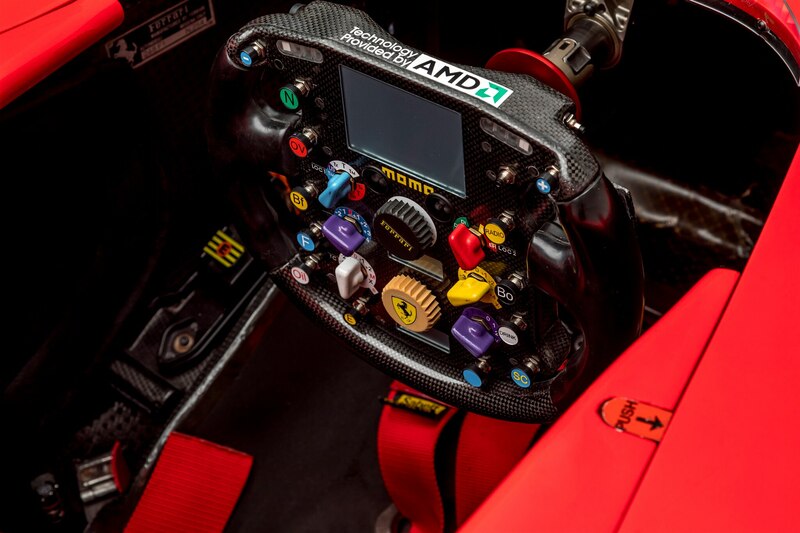 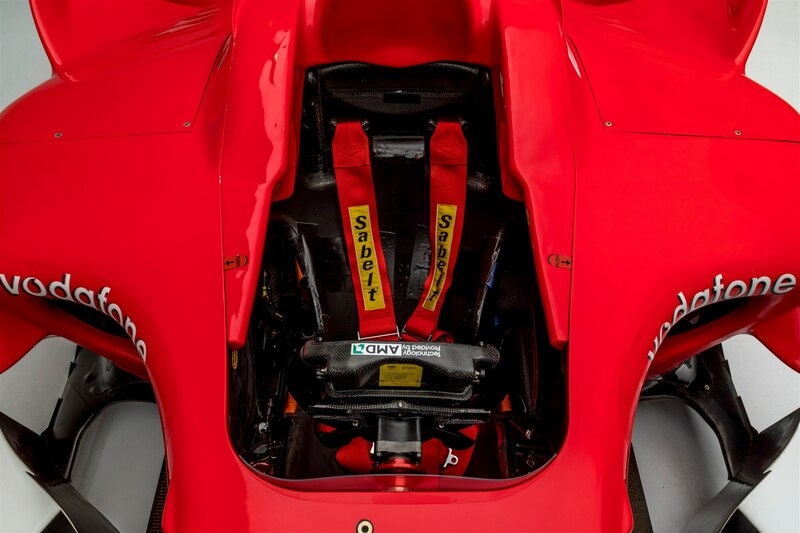 When your key technical and design consultant is 11-time F1 winning designer Rory Byrne, you can call it whatever you want. 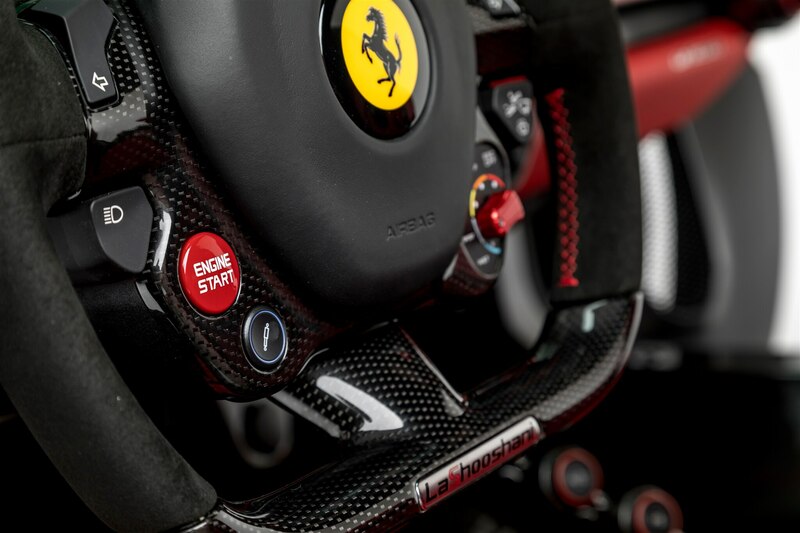 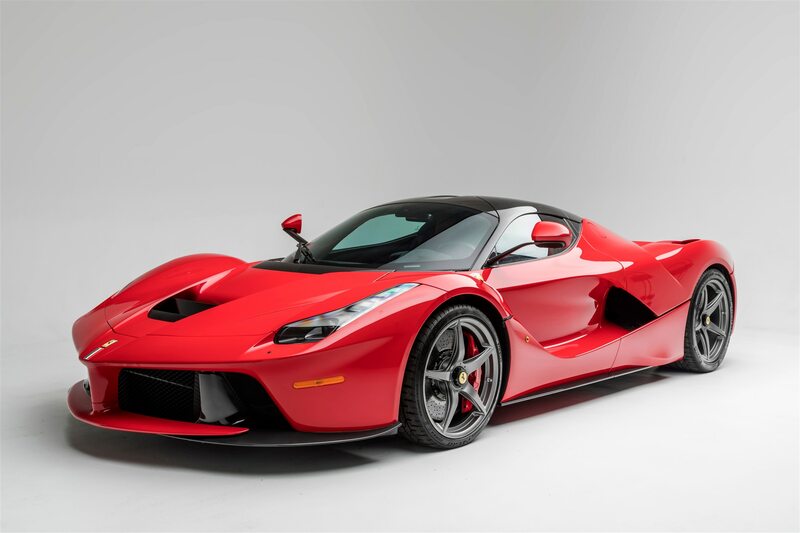 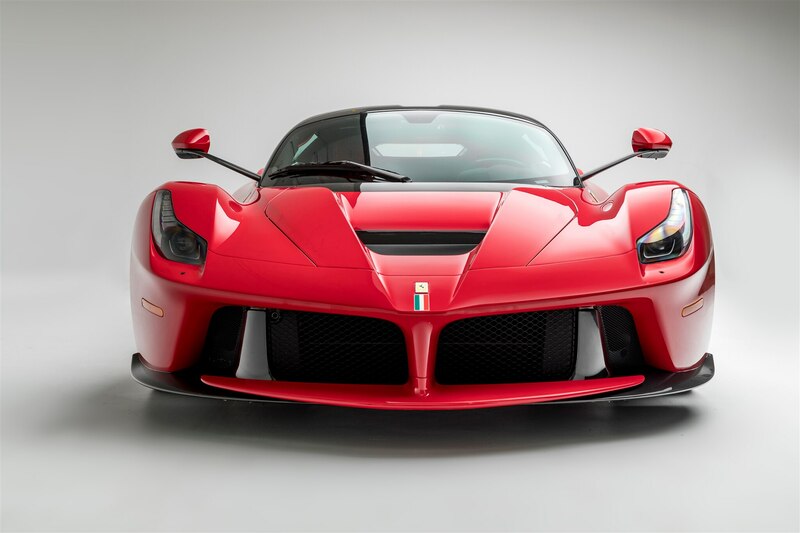 Production of the LaFerrari, which was Ferrari’s first foray into the world of hybrid production cars, began in 2013. 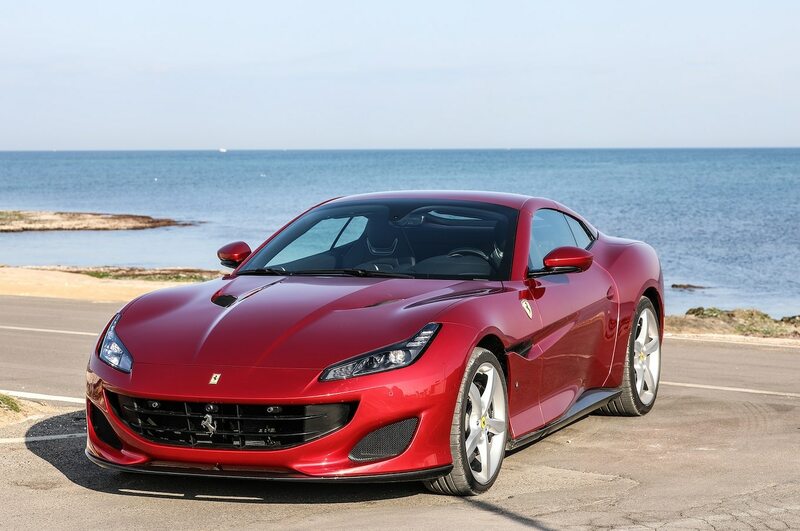 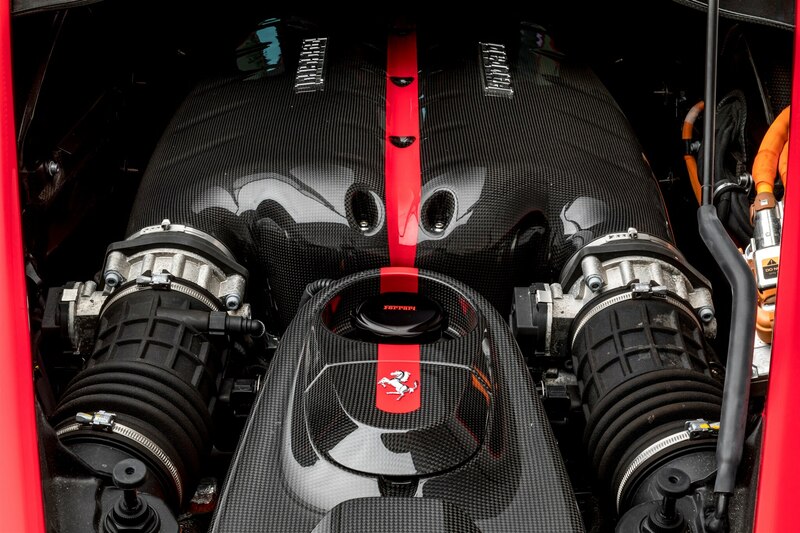 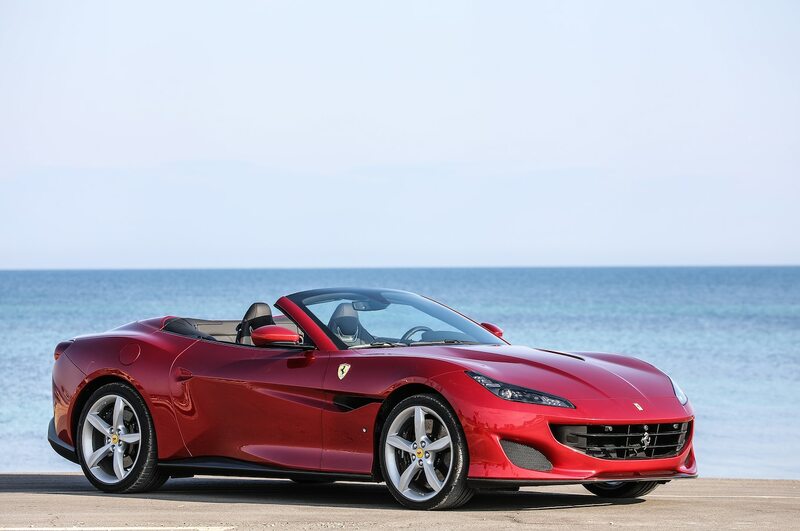 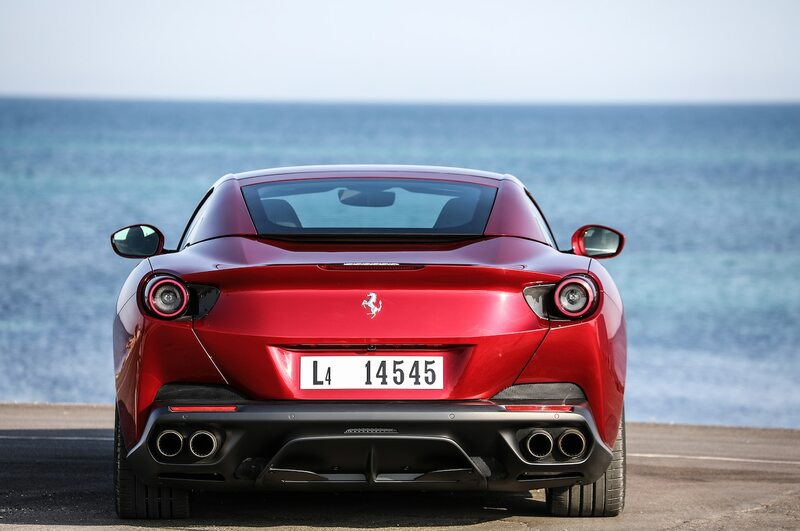 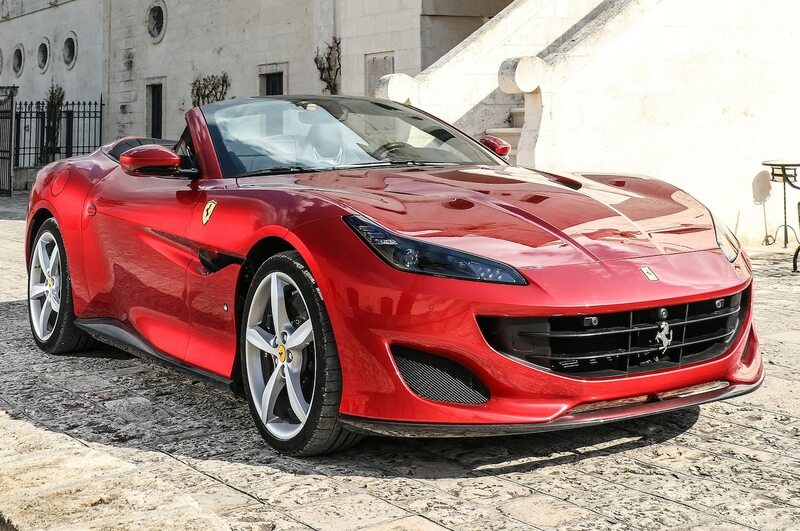 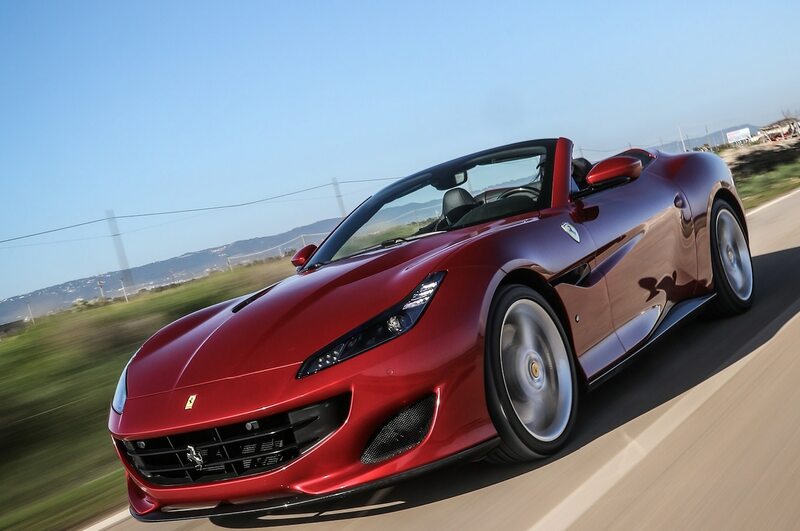 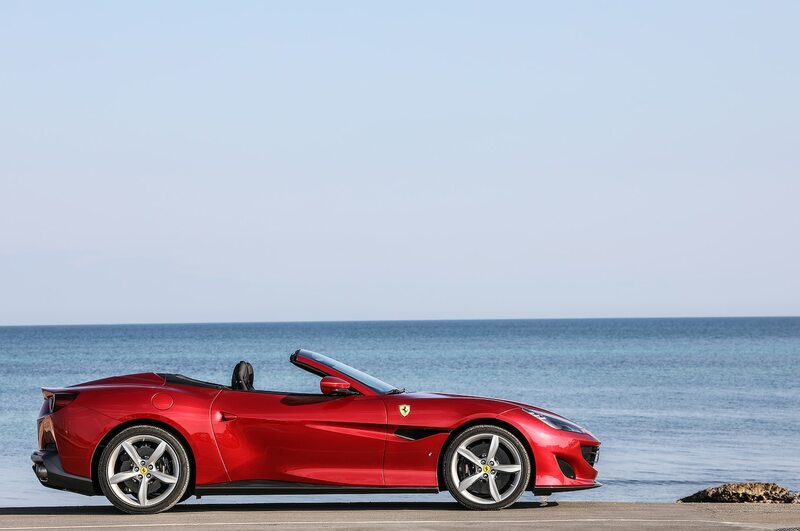 It combines a robust 161-horsepower electric motor with Ferrari’s mighty 6.3-liter V-12. 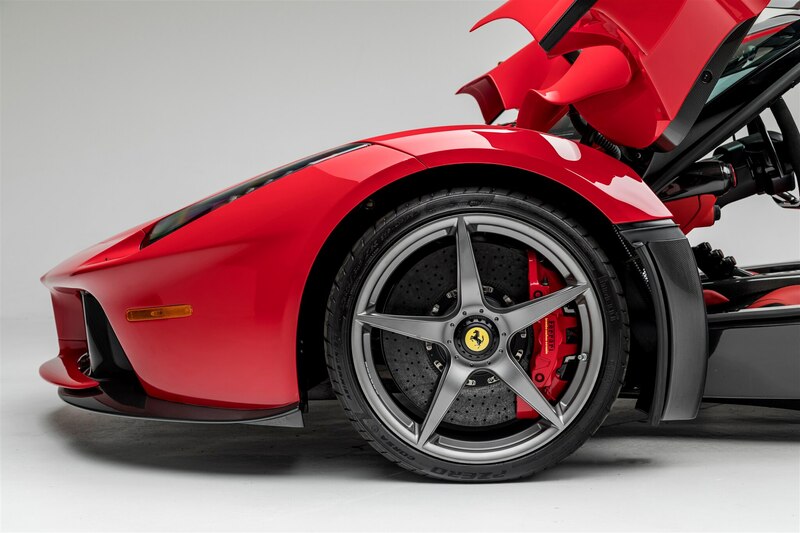 Together those motivators produce a staggering 949 prancing ponies in this mid-engine juggernaut. 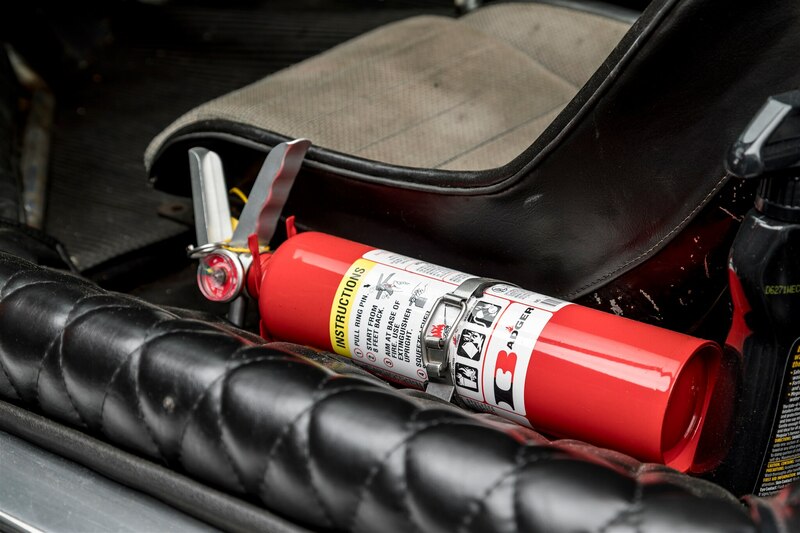 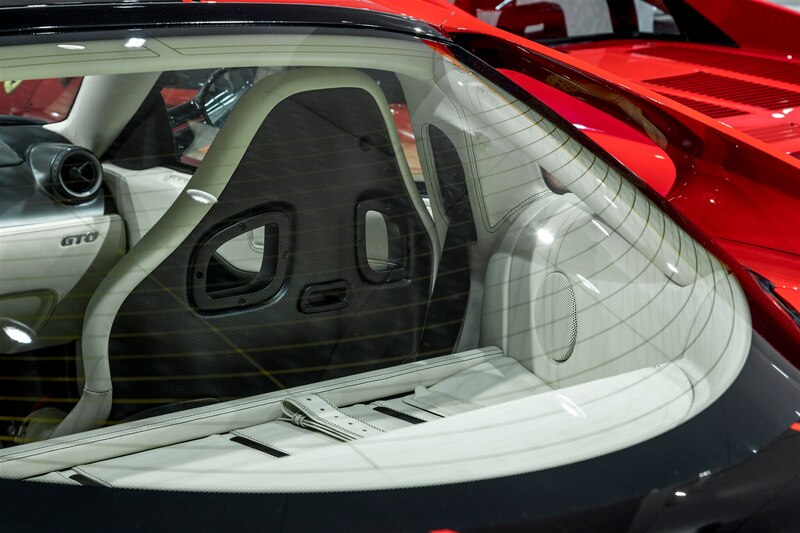 Four different types of carbon fiber, each engineered for different purposes, are used to lower the number of overall components in the car and reduce weight. 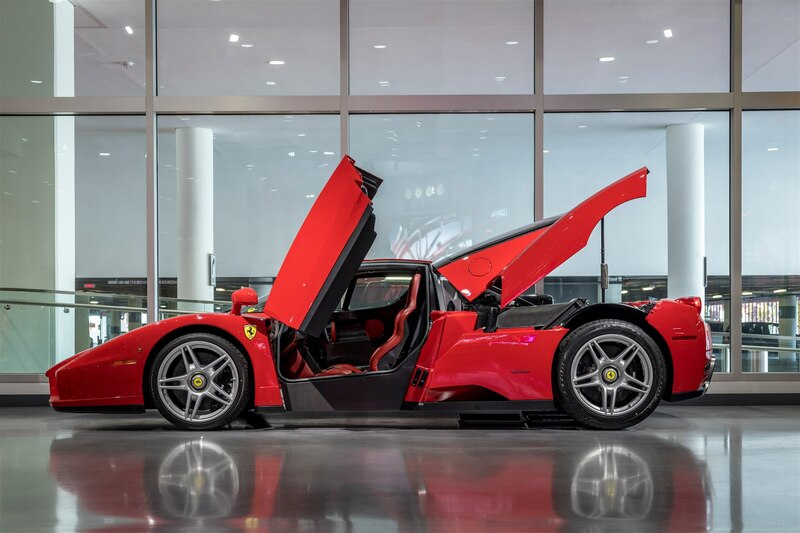 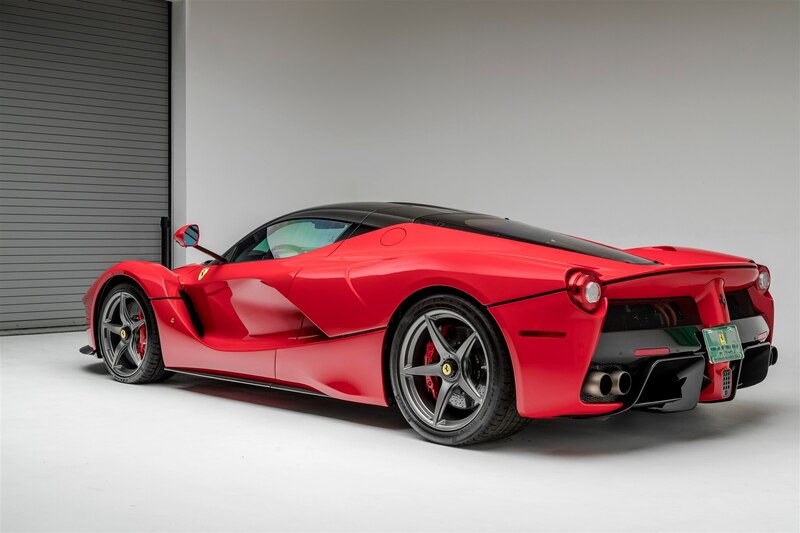 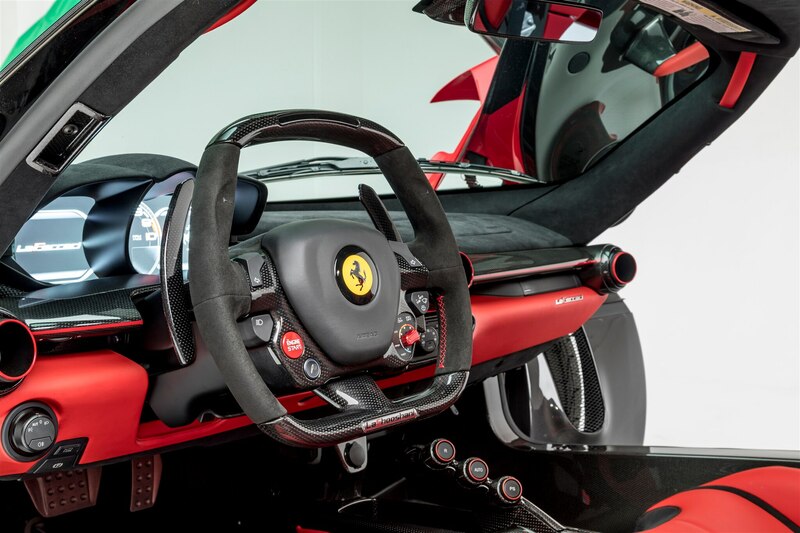 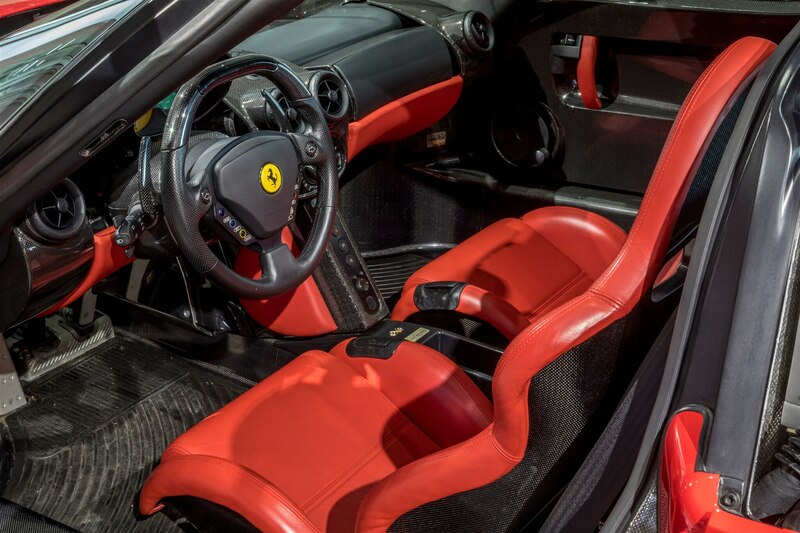 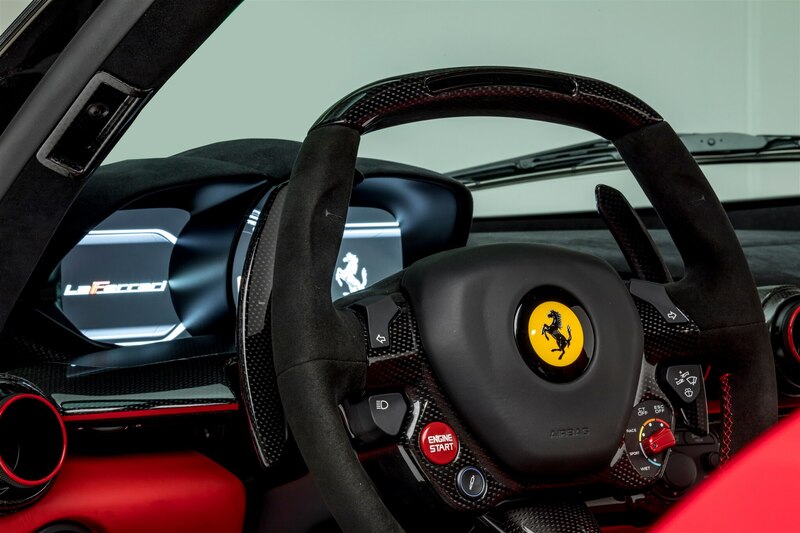 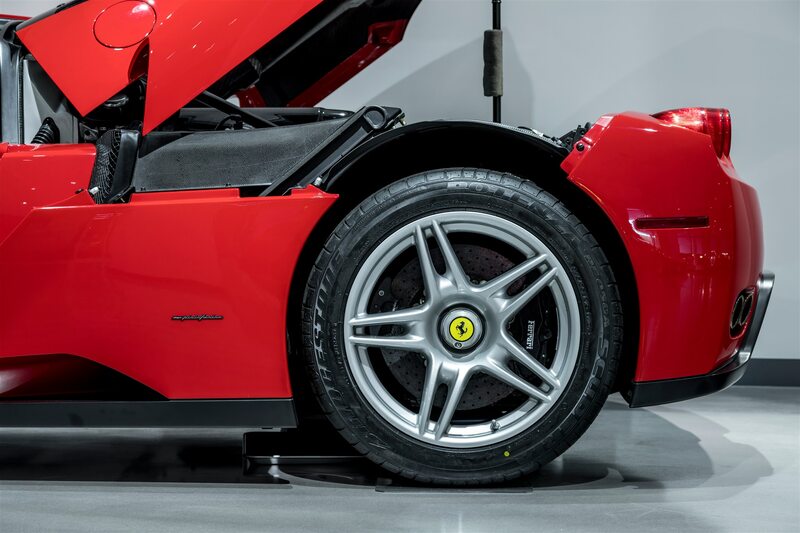 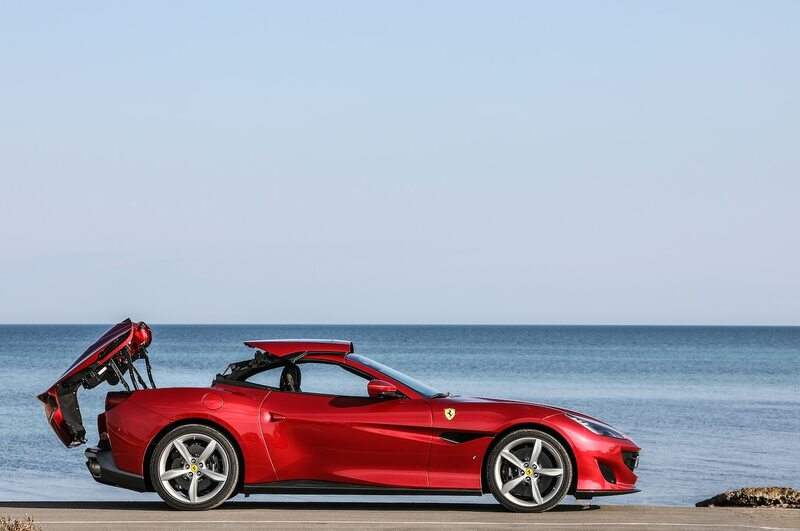 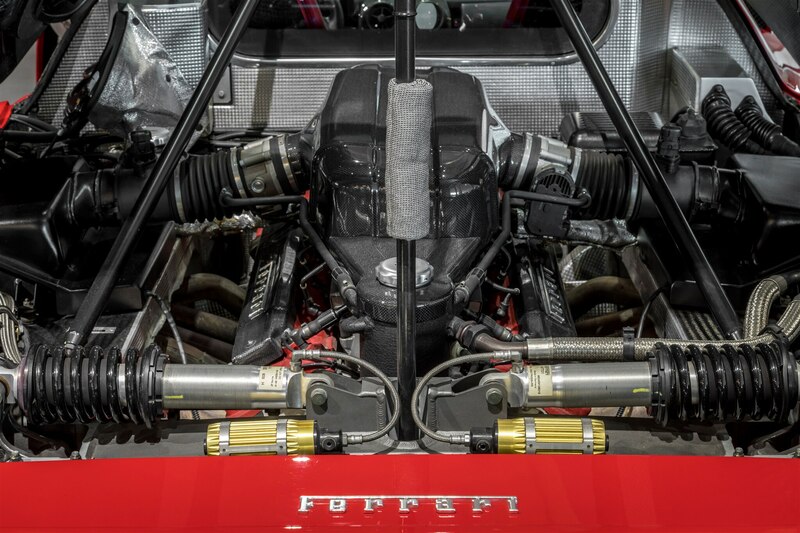 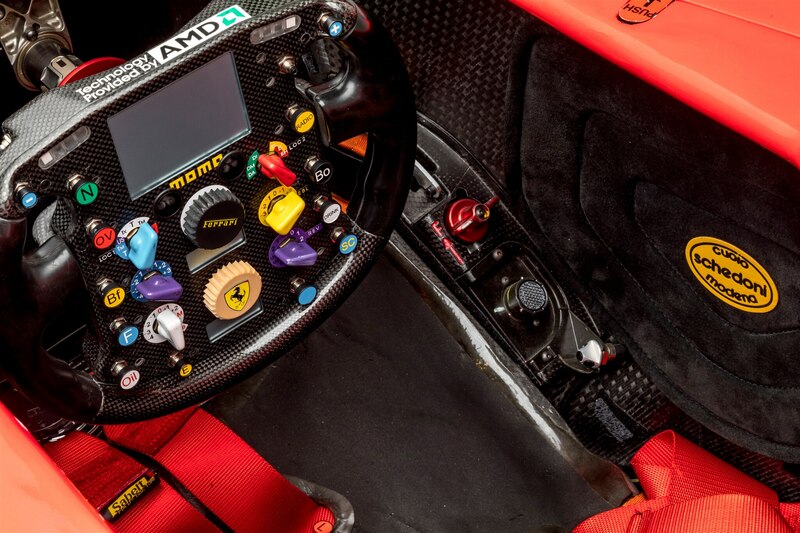 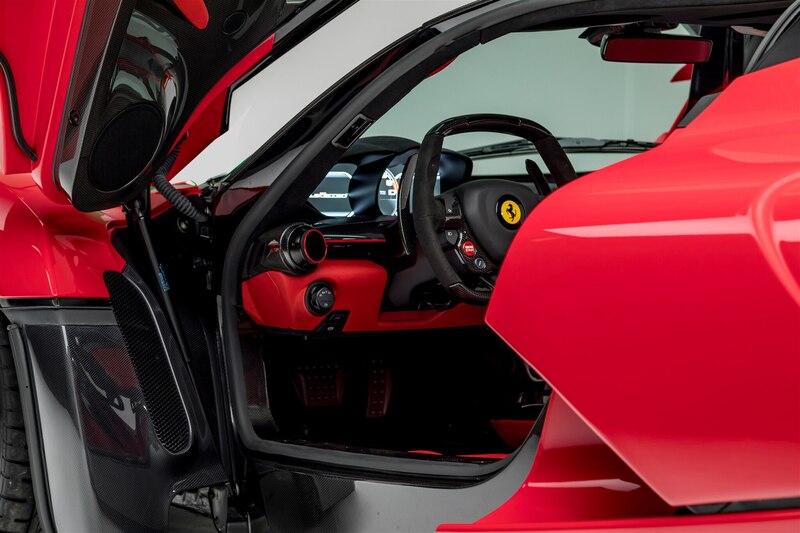 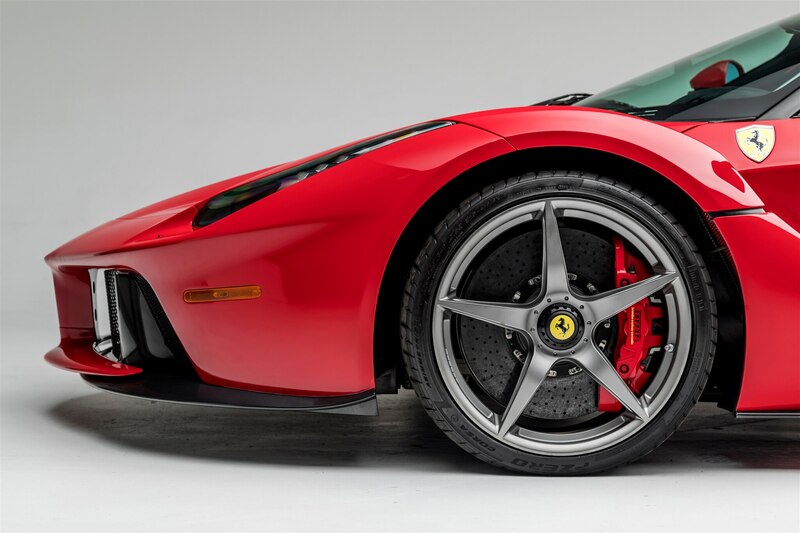 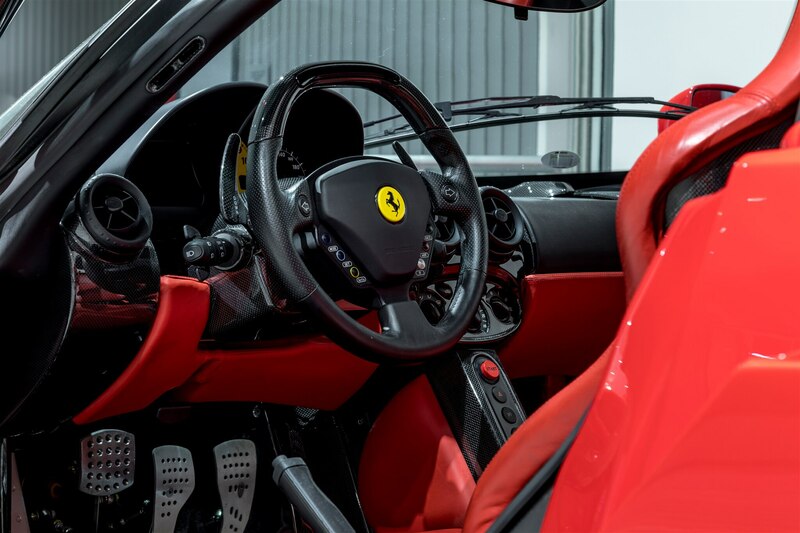 Additional non-traditional decisions such as integrating the seats directly into the chassis instead of bolting them down helped drop total weight and lower the LaFerrari’s center of gravity. 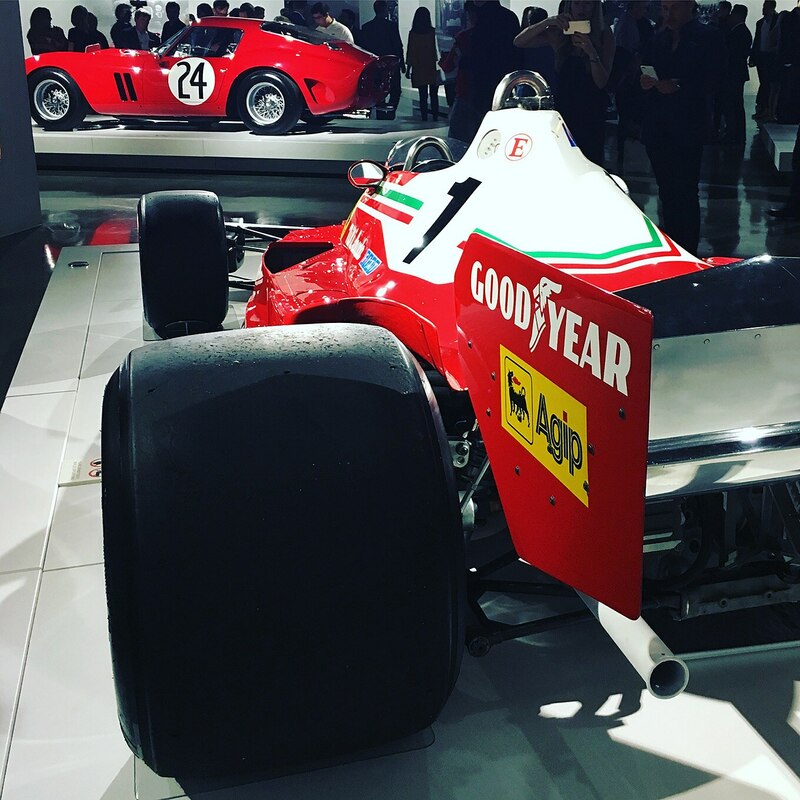 We’re glad that one of the 500 LaFerraris built is making an appearance here in LaLa Land. 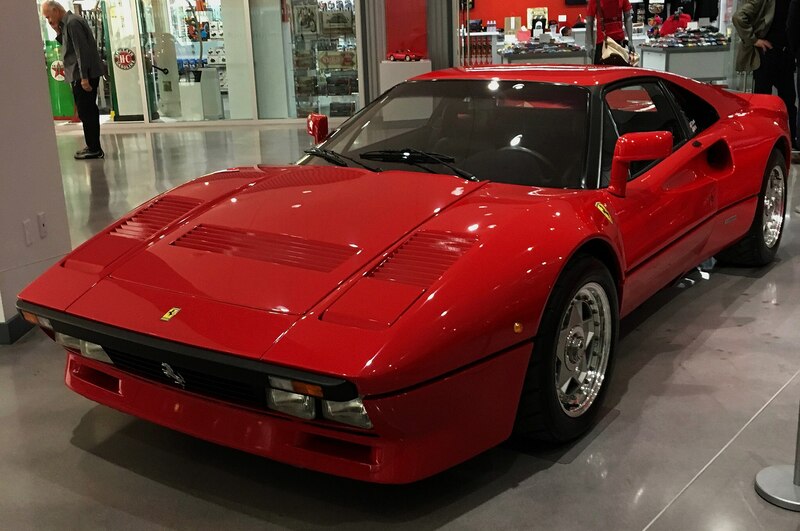 While not officially part of the exhibit, the Ferrari 288 GTO made a special appearance in the lobby of the Petersen on the evening of the exhibit’s opening gala. 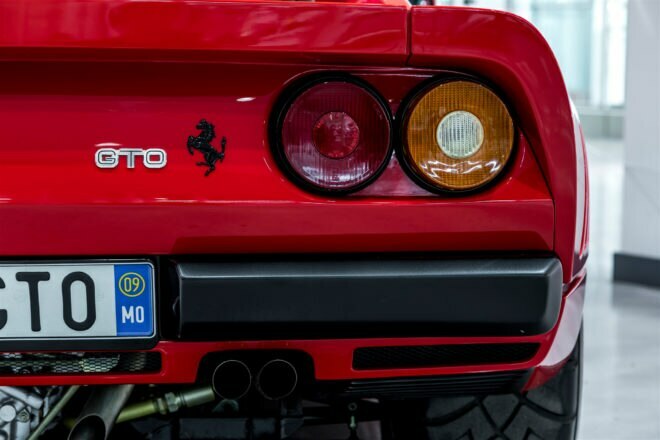 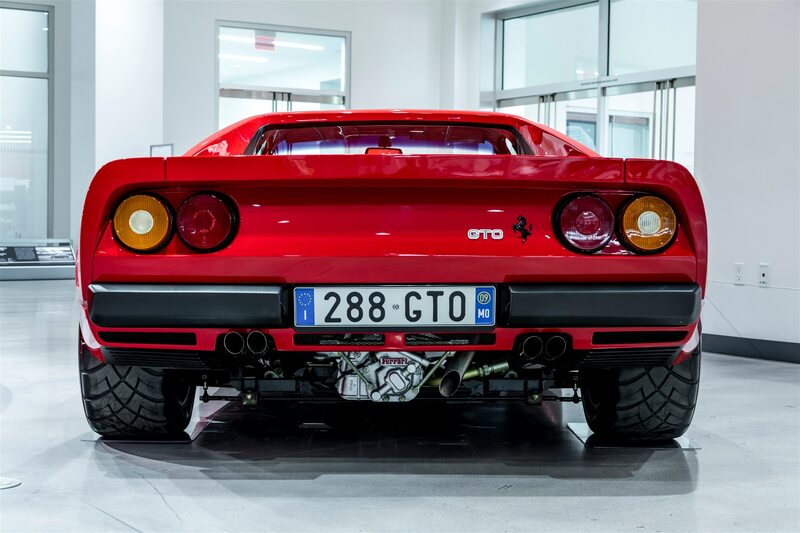 The 288 GTO is the second Ferrari to carry the Gran Turismo Omologato moniker after the 250 and one of only three total, the third being the 599 GTO. 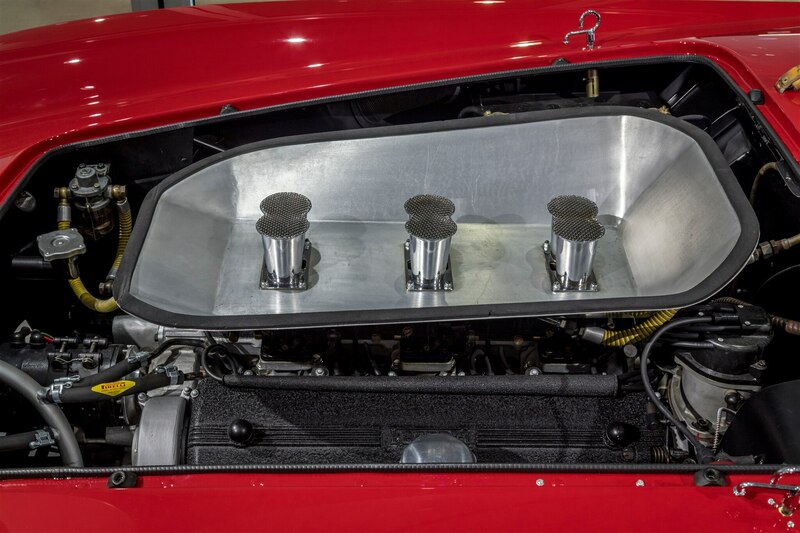 This 1984 mid-engine demon’s 2.9-liter V-8 was mounted longitudinally, making room for twin turbochargers and intercoolers. 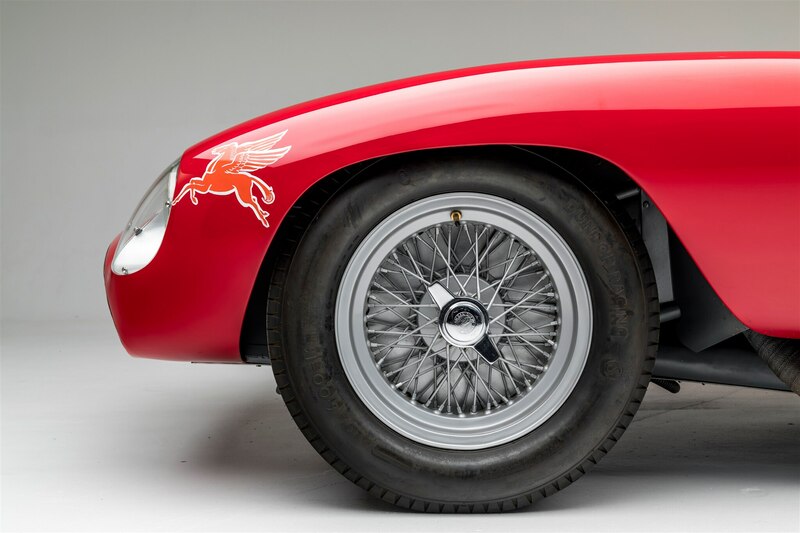 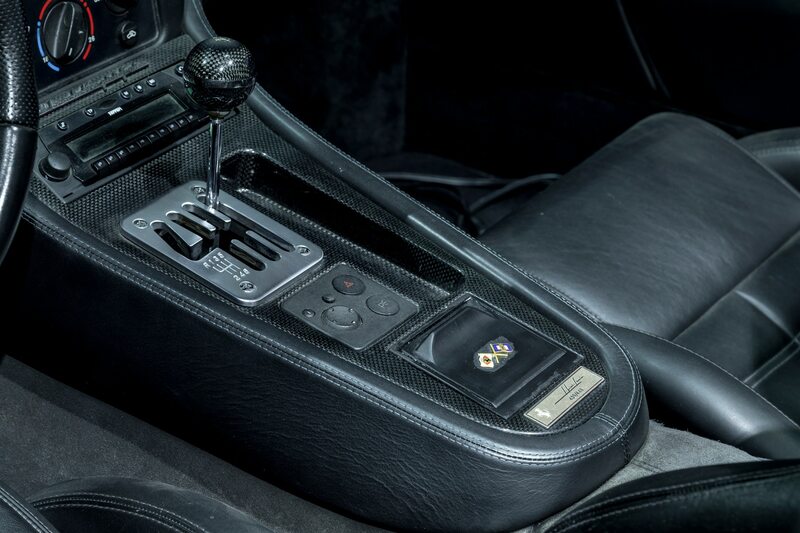 Its racing-derived transmission was mounted to the rear of the engine, necessitating a longer wheelbase than in its 308 predecessor, ultimately leading to improved handling and looks. 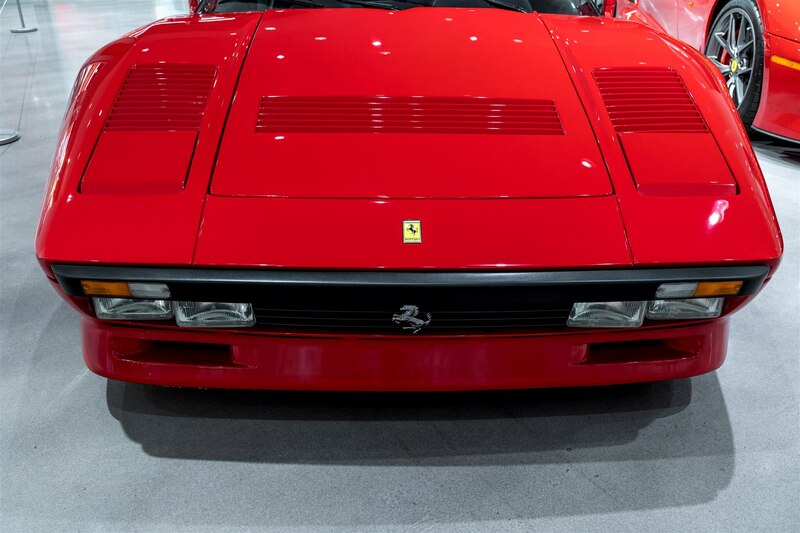 One of the coolest aspects of the 288 is that unless you really know your stuff, you’ll think you’re just looking at a garden variety 308. 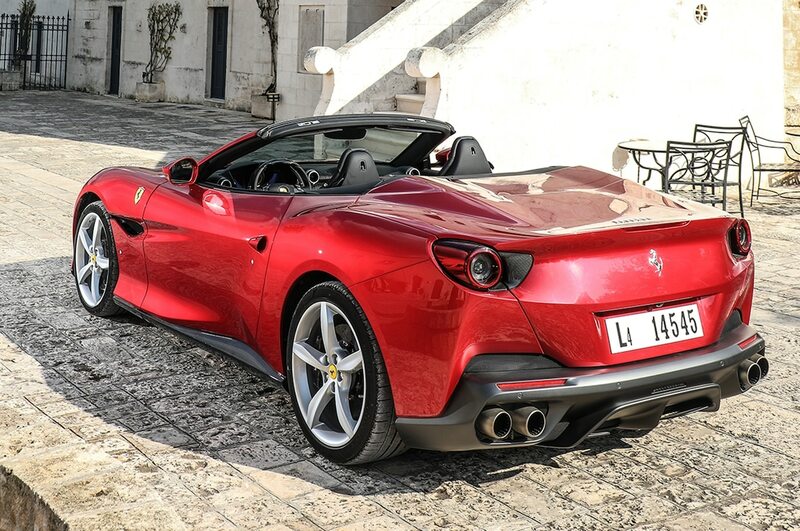 In that sense the car’s a Q-ship, as stealthy as any red Ferrari can be. 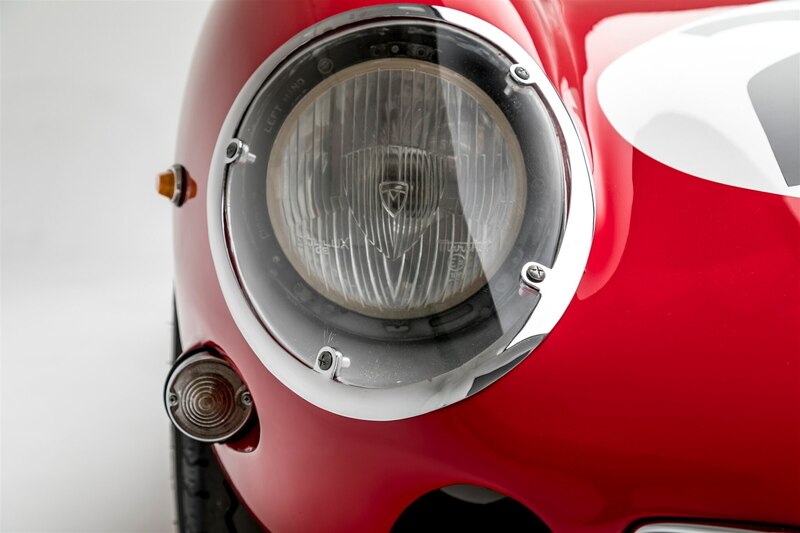 Only the connoisseur’s eye knows for sure. 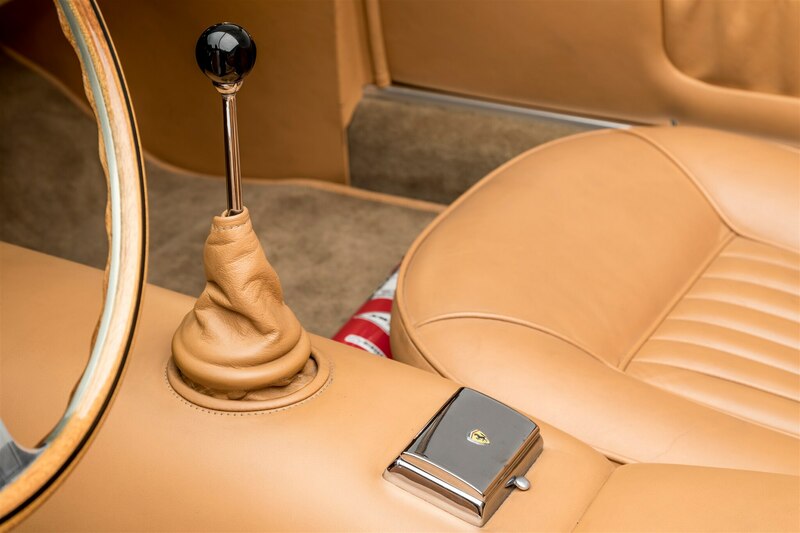 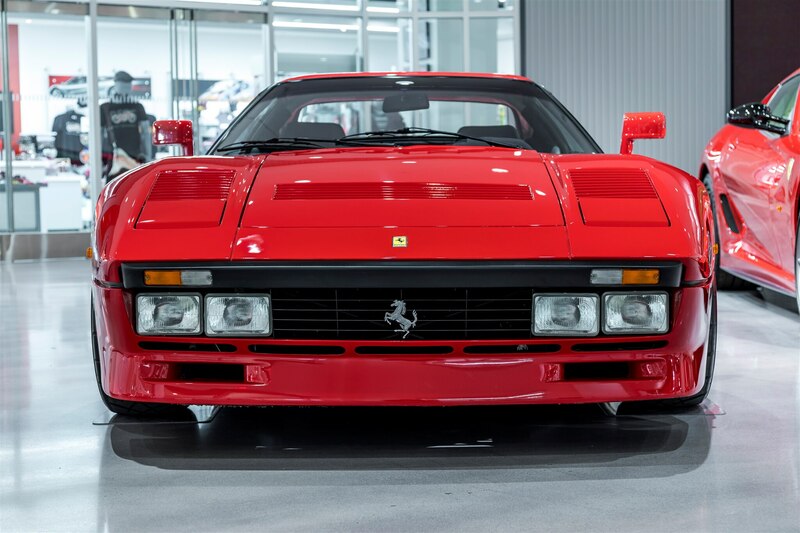 In 2015, the owner of this particular example put eight other Ferraris up for auction, including a 1990 F40 and a 1964 250 GT Lusso, but he simply couldn’t part with his 288 GTO, clearly knowing how special this car is. 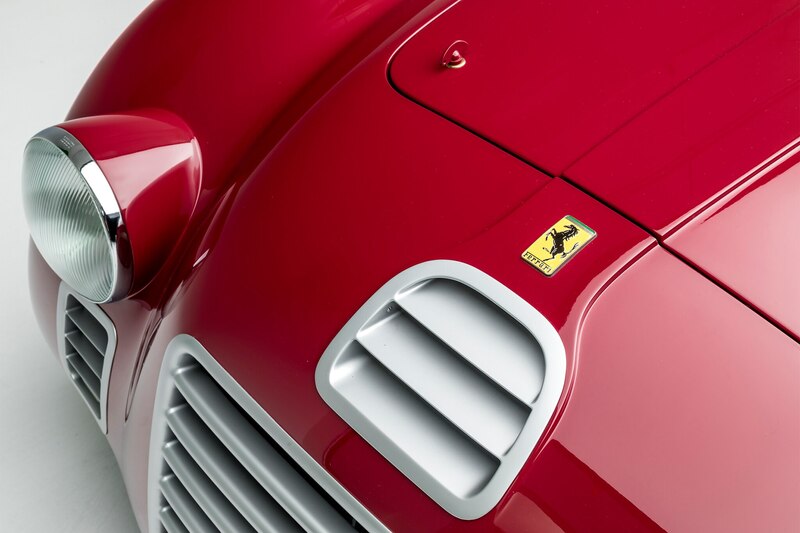 Enzo Ferrari’s first racing team, Scuderia Ferrari, was formed back in 1929 when he was just 31. 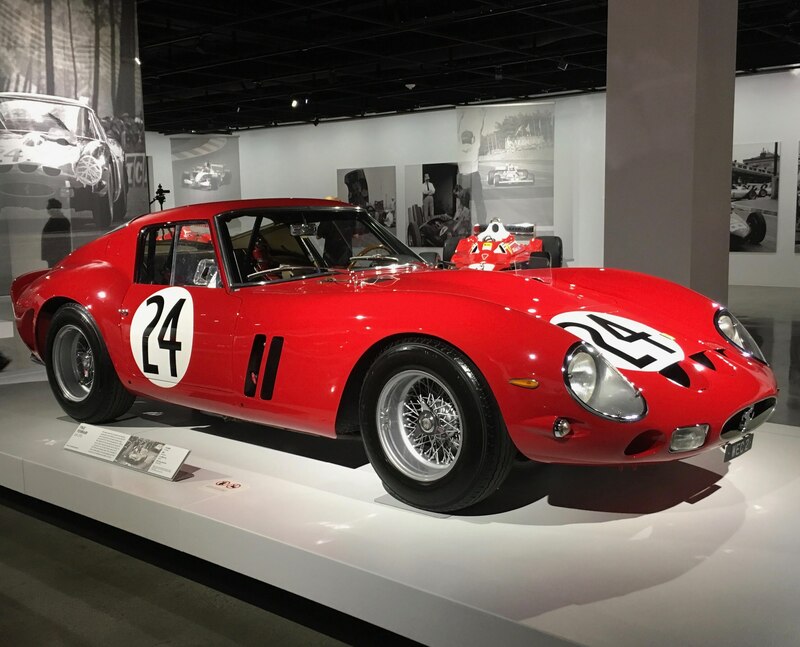 Two of the race team’s biggest winners are on display at the Petersen alongside the legendary road cars. 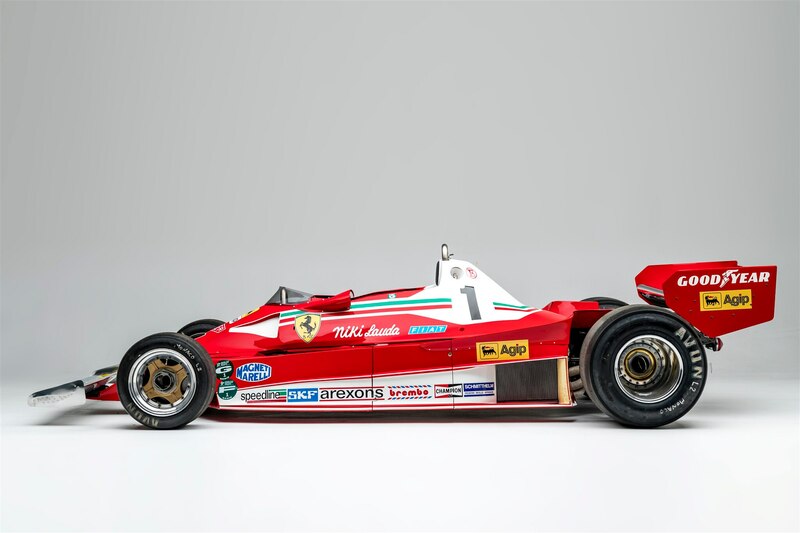 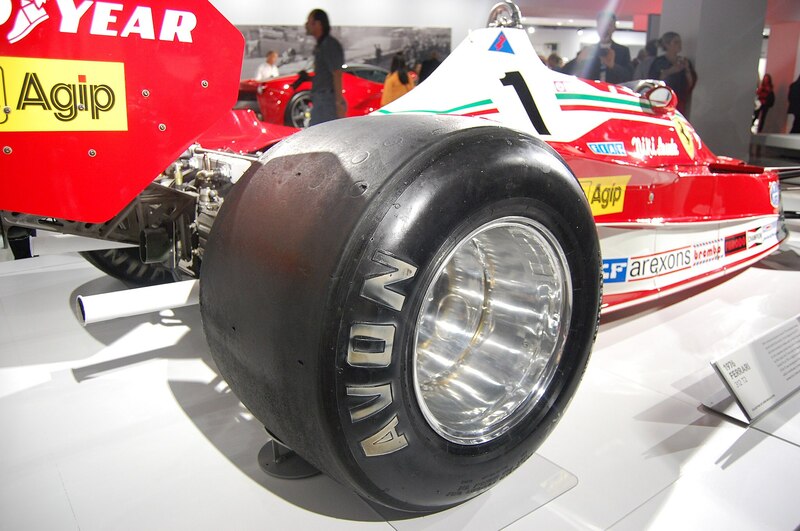 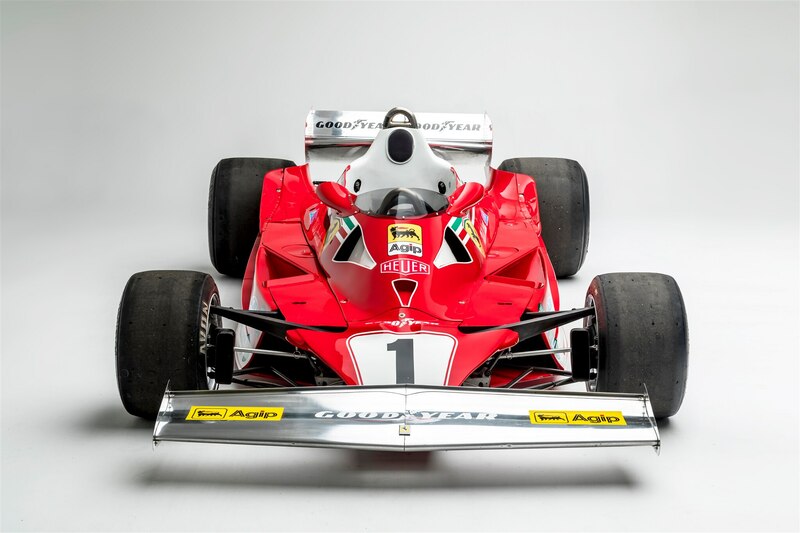 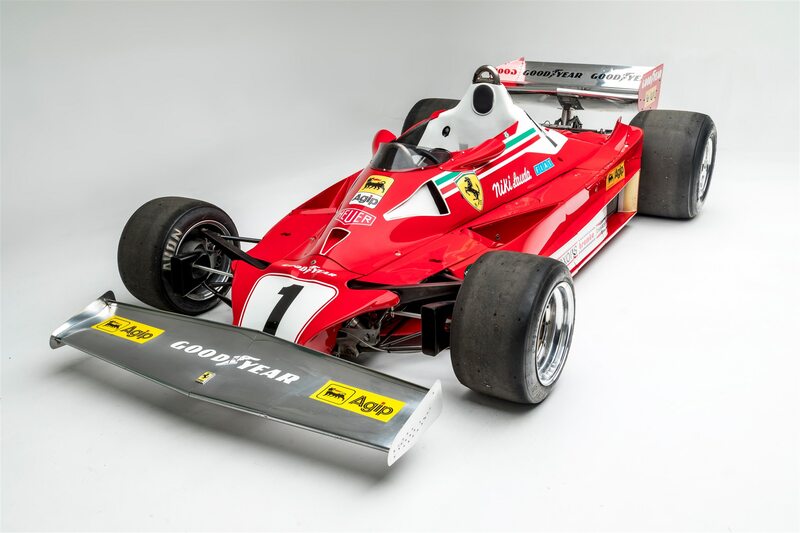 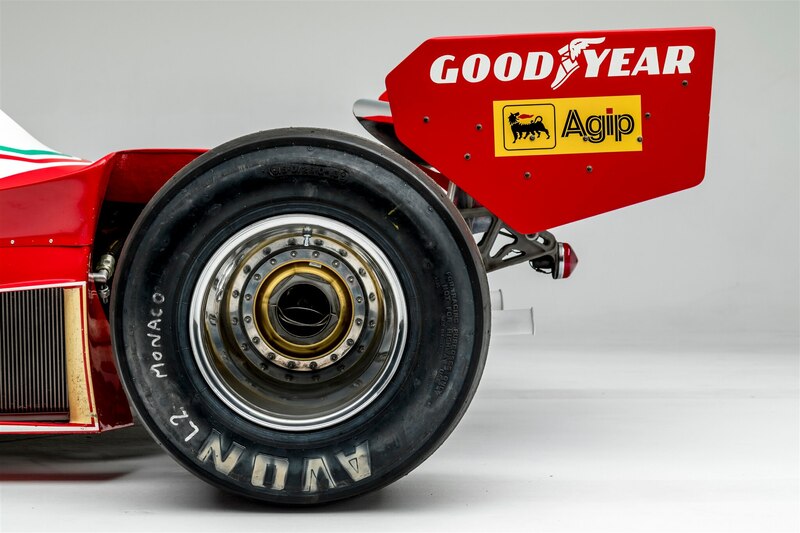 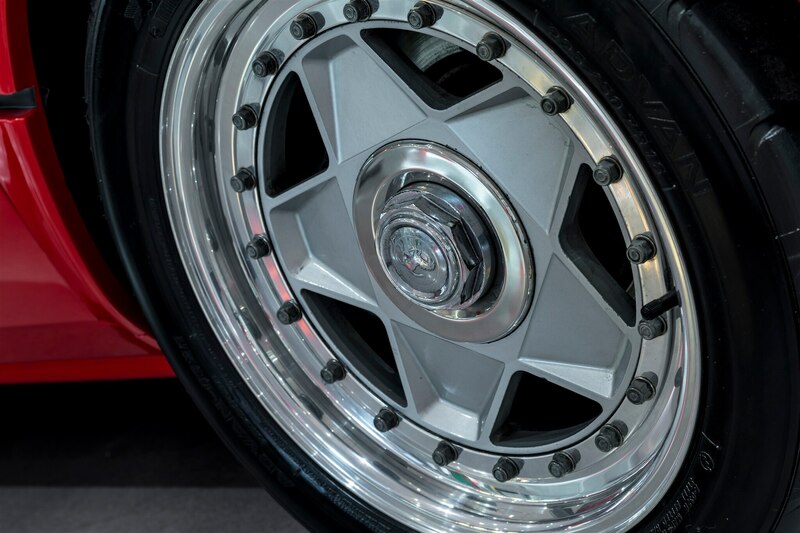 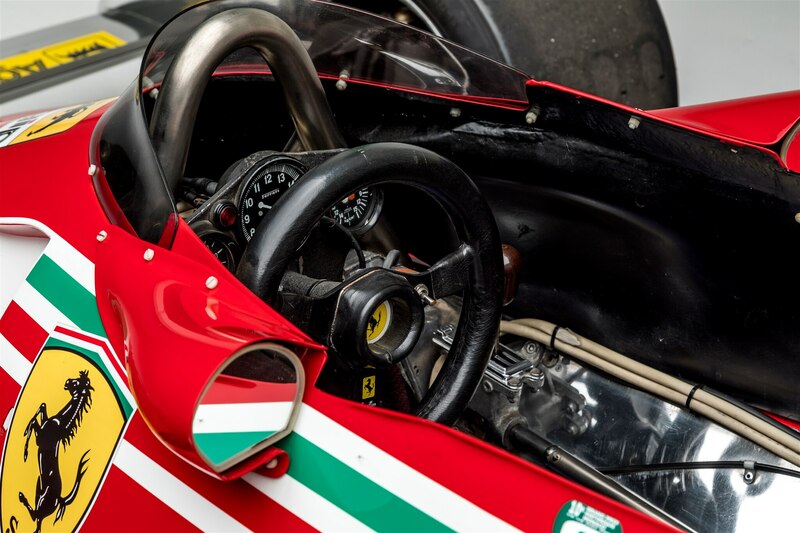 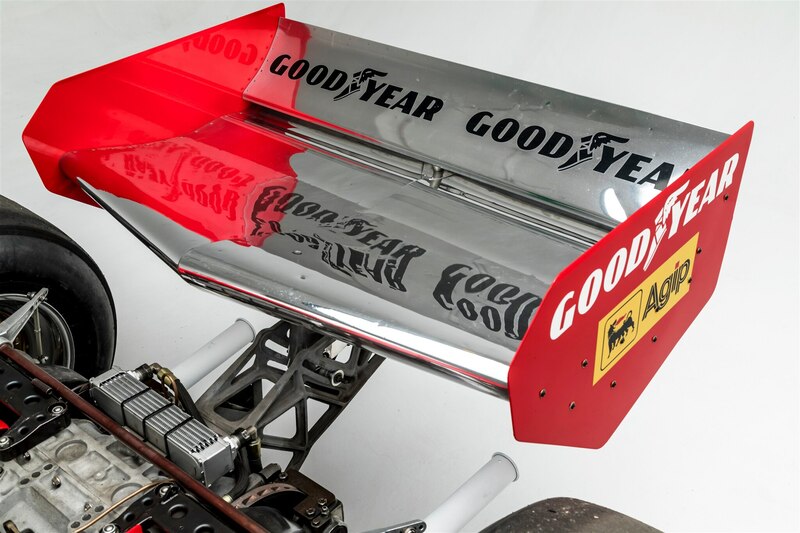 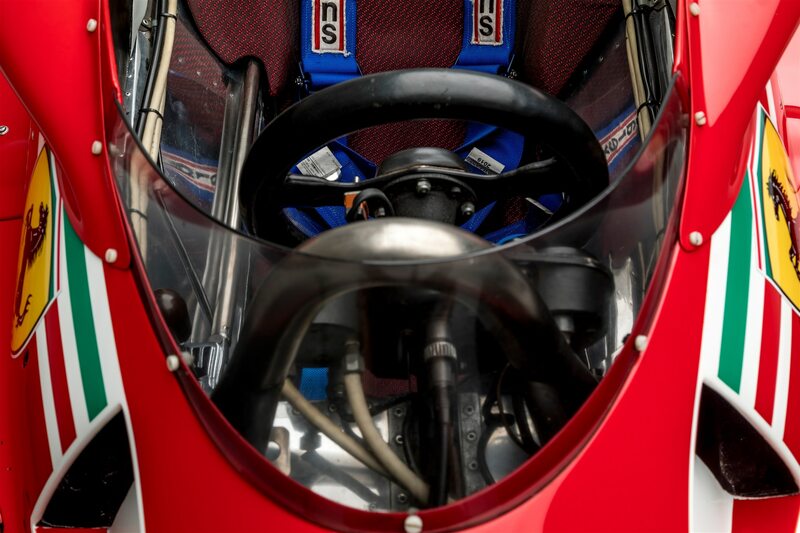 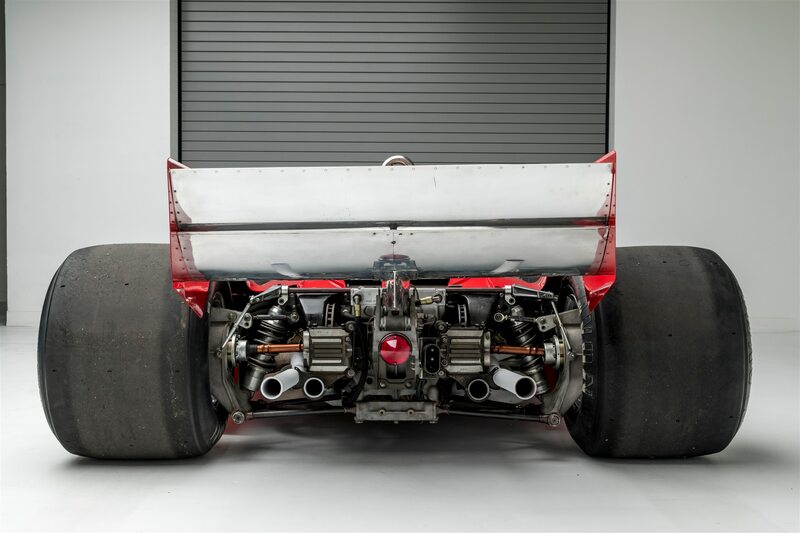 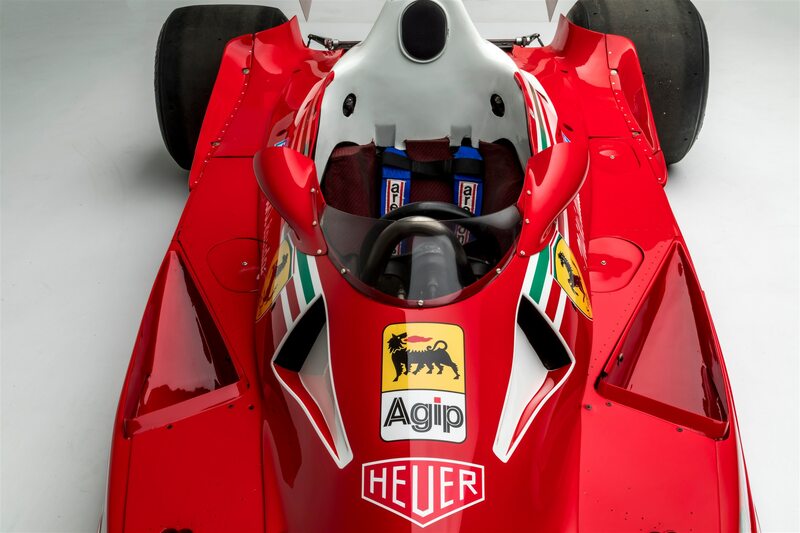 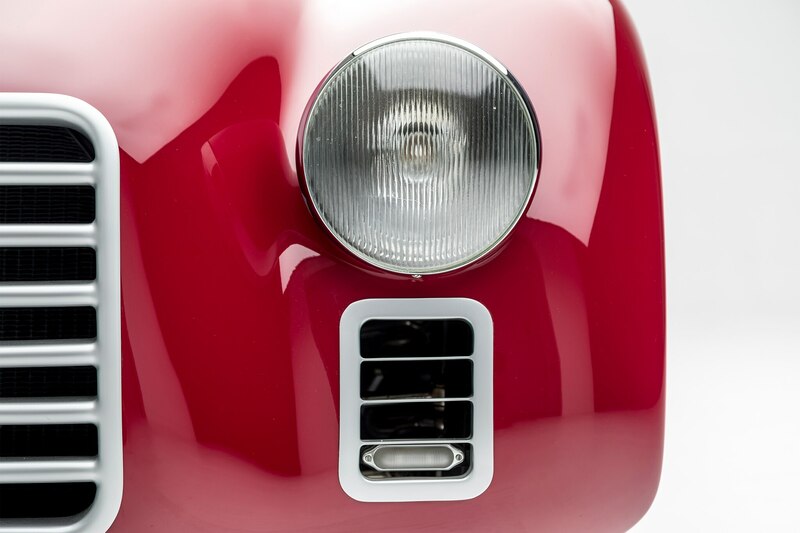 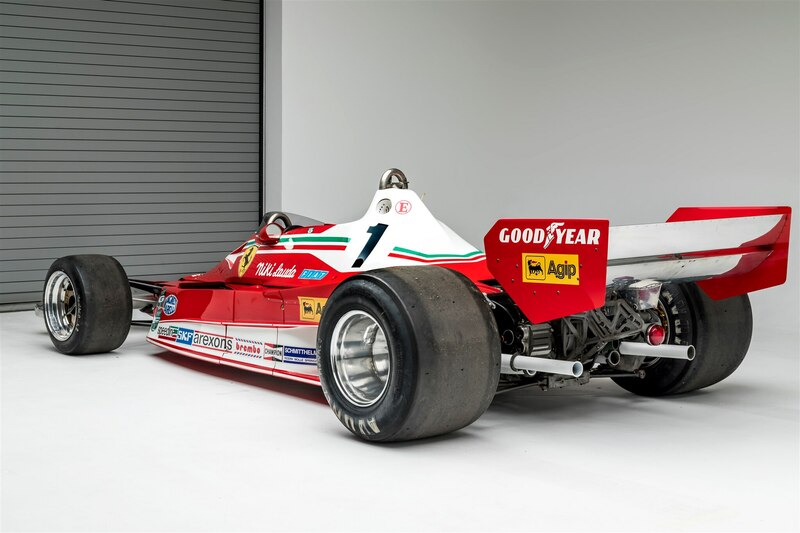 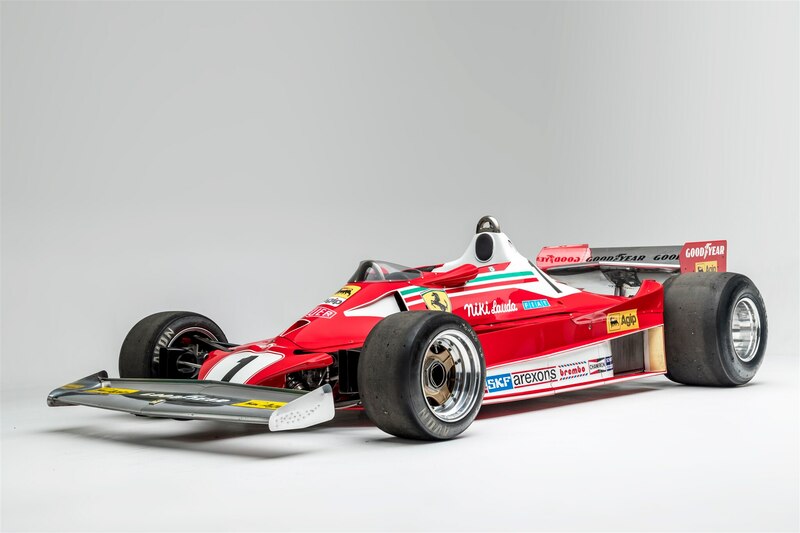 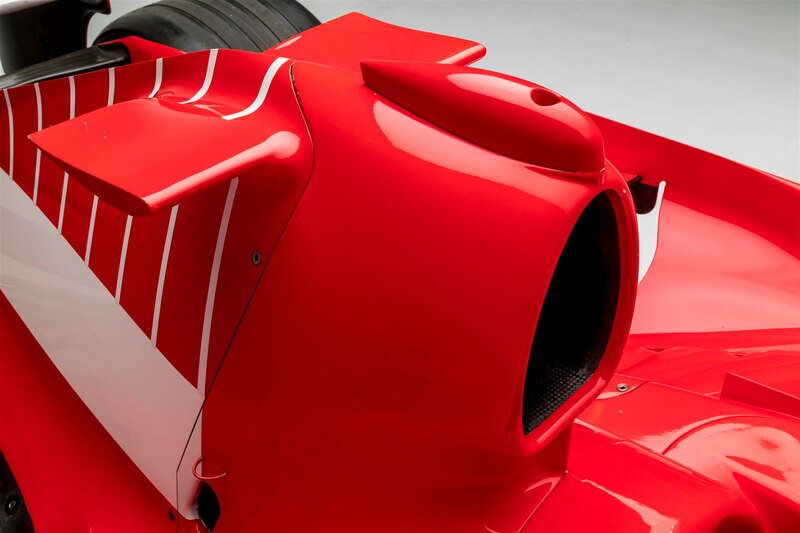 Driven by three-time F1 champ Niki Lauda, the 312T2 included new side-mounted air intakes, each channeling into a separate cylinder bank of the 3.0-liter flat-12 engine. 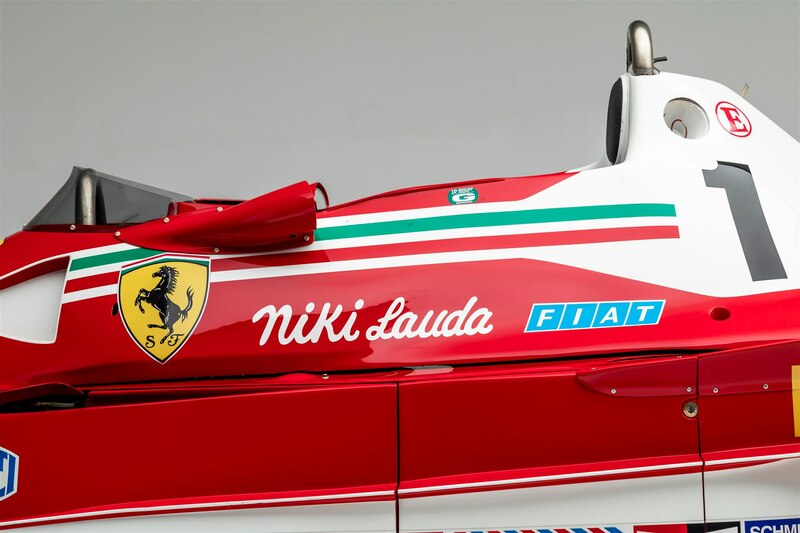 Lauda won the Belgian and Monaco Grands Prix in the 312 T2, which was raced between 1975 and 1980. 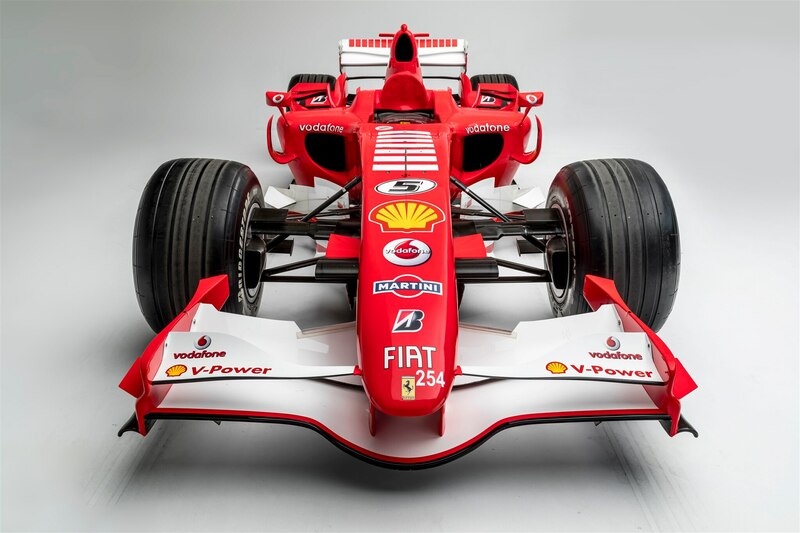 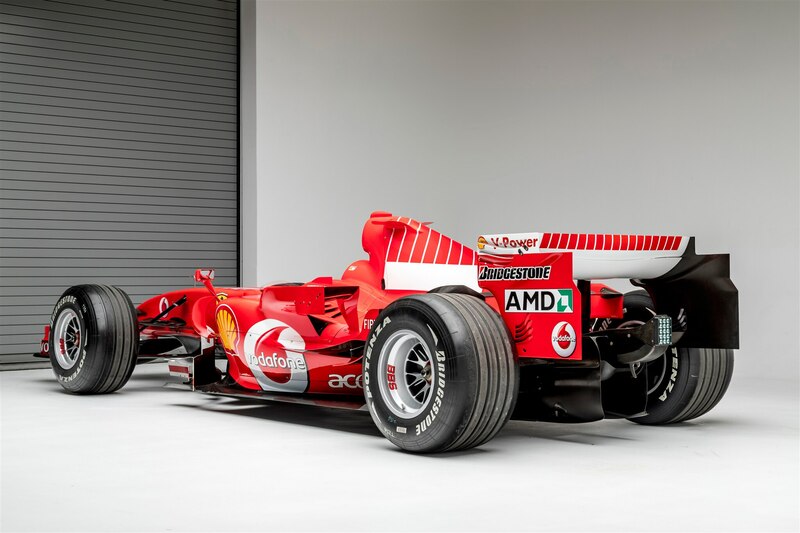 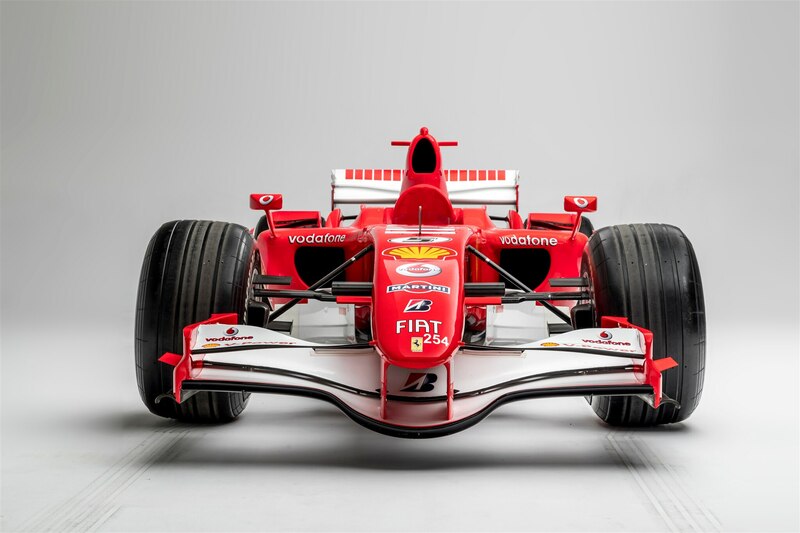 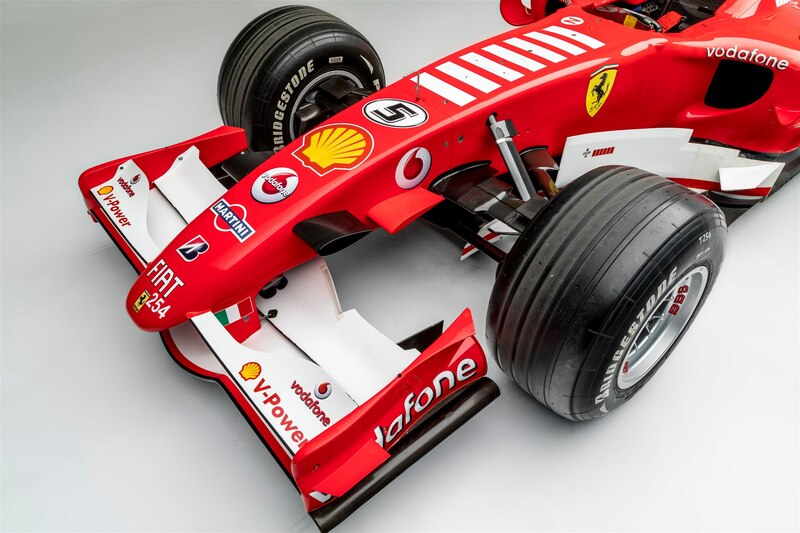 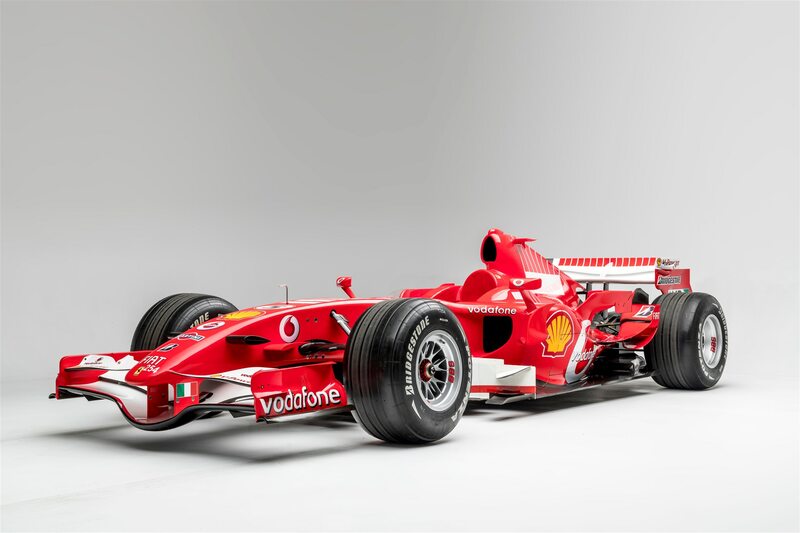 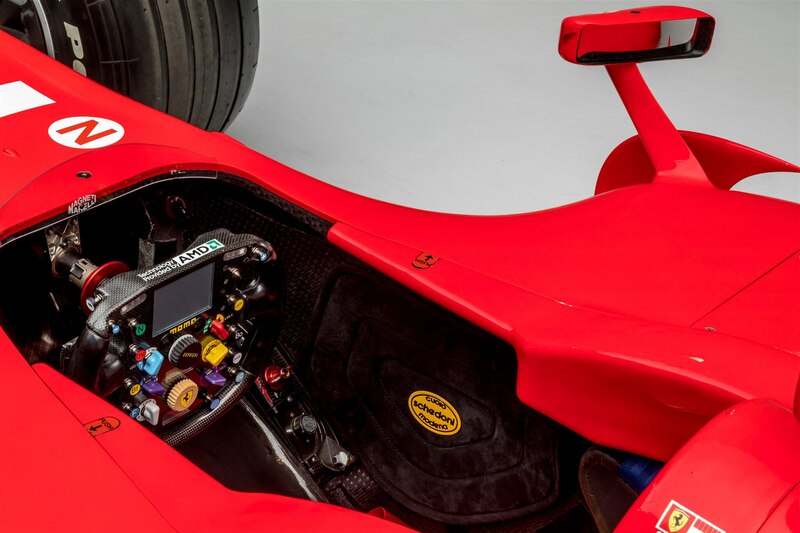 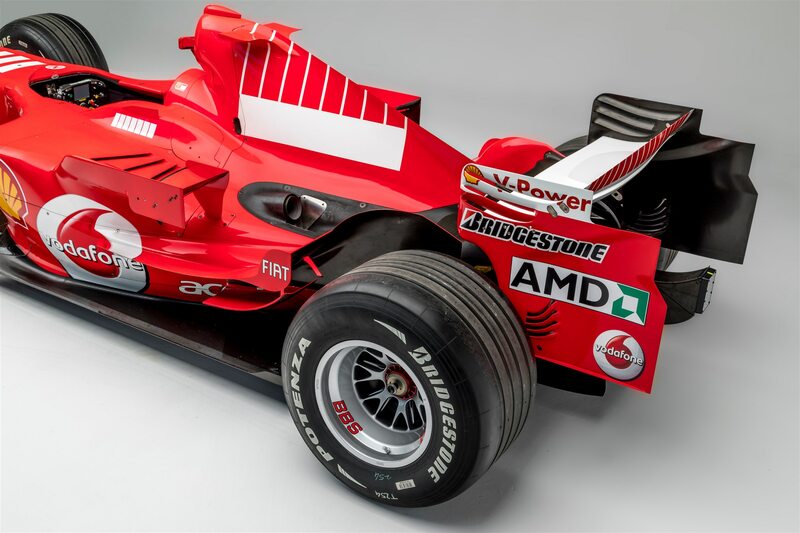 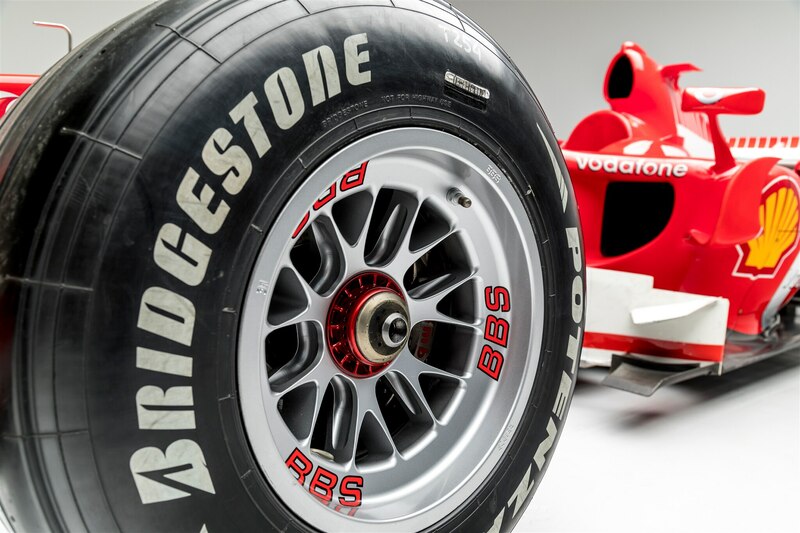 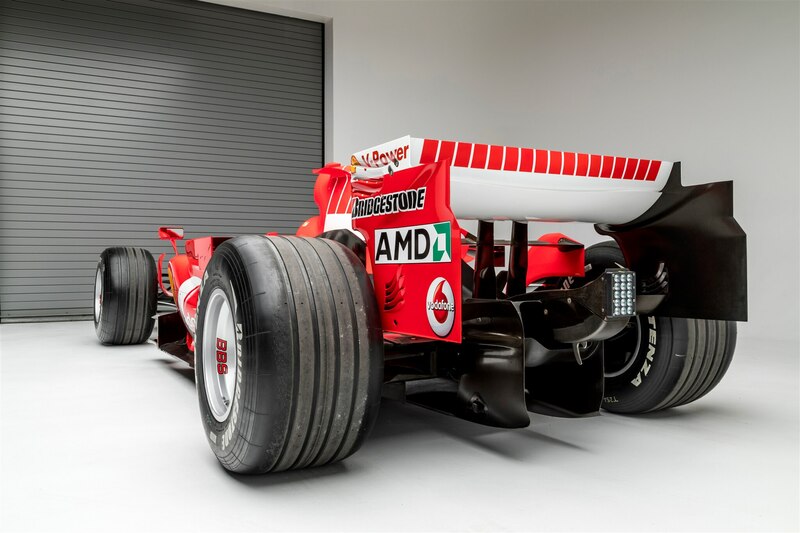 Seven time F1 world champion Michael Schumacher drove the 248 F1 in the 2006 Formula 1 season. 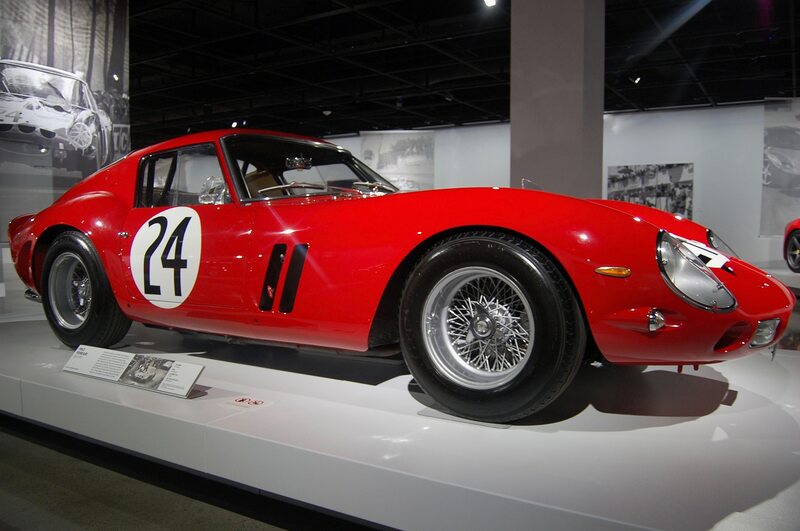 Named for its 2.4-liter V-8, the car packed 785 horsepower and a top speed of 217 mph. 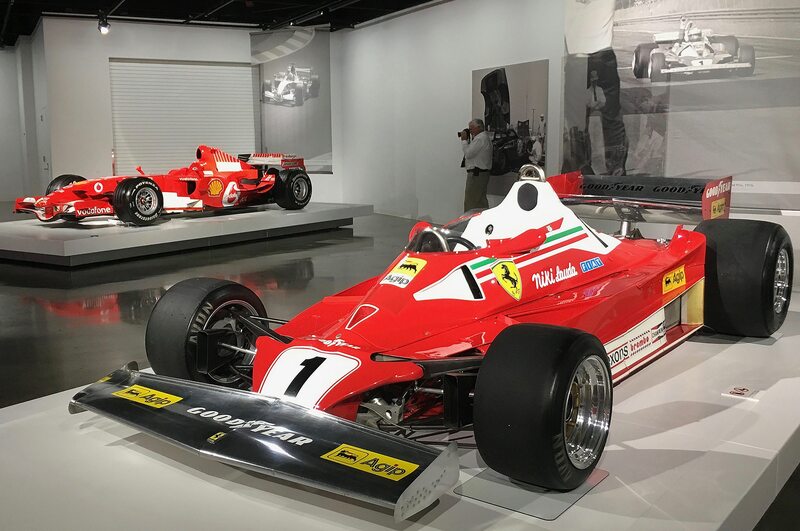 If you didn’t get to see these two racing legends compete on the track, then seeing them parked side-by-side here is surely the next best thing. 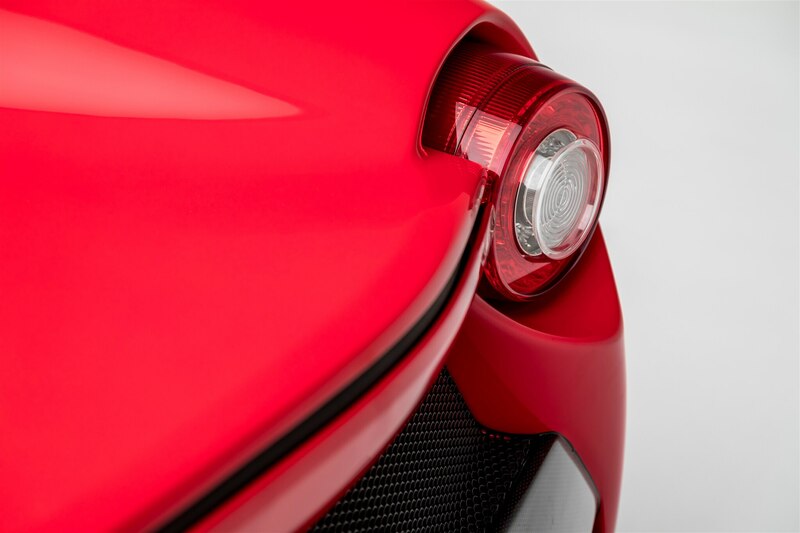 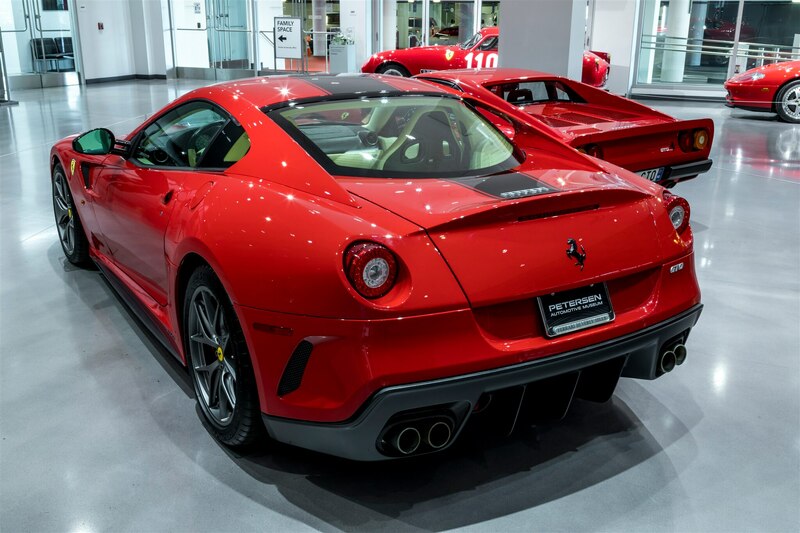 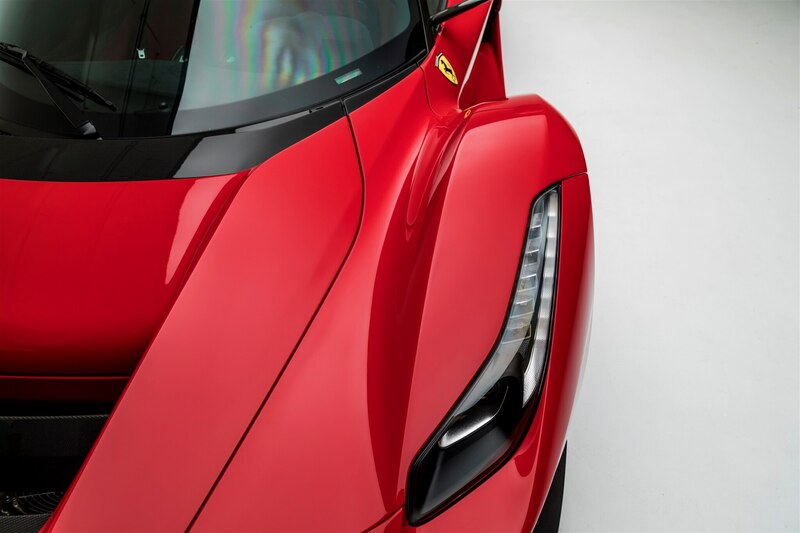 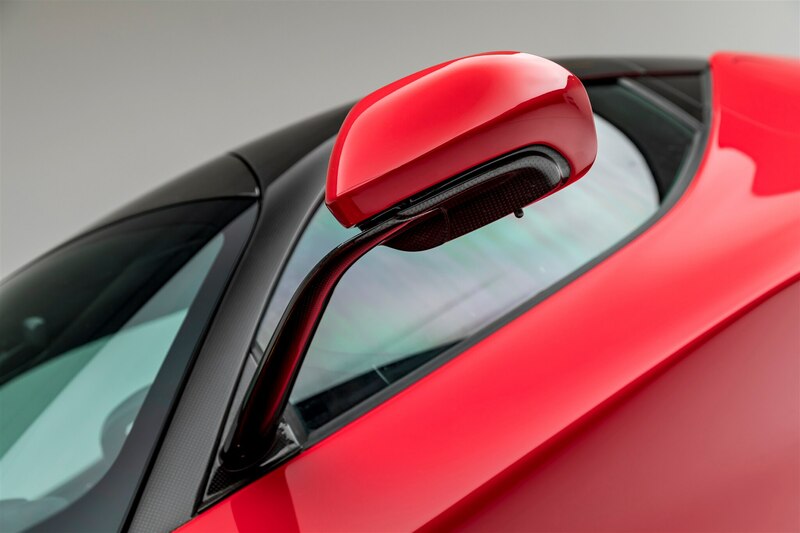 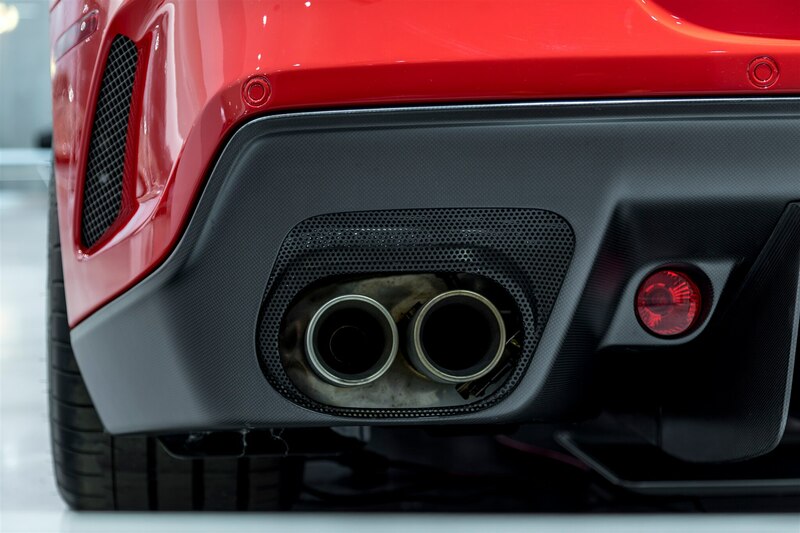 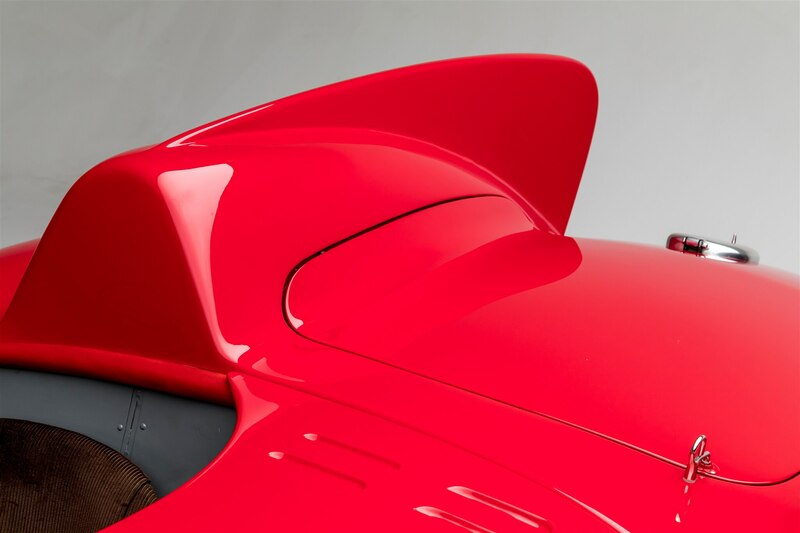 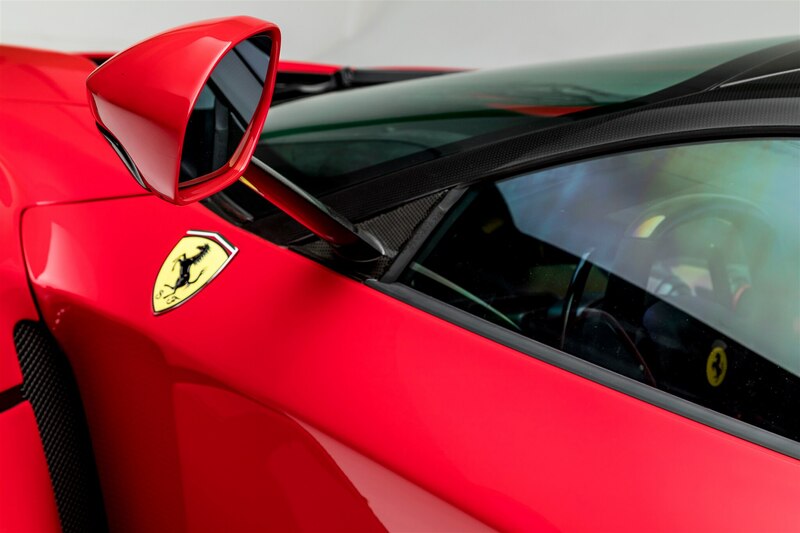 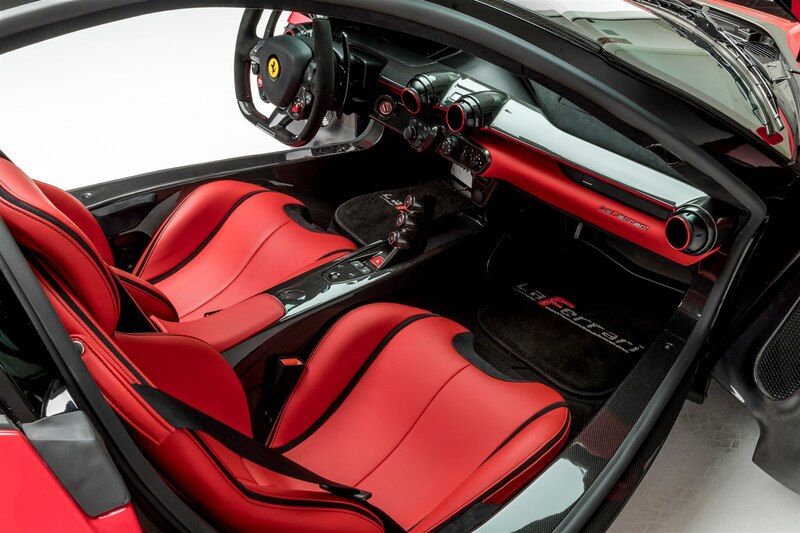 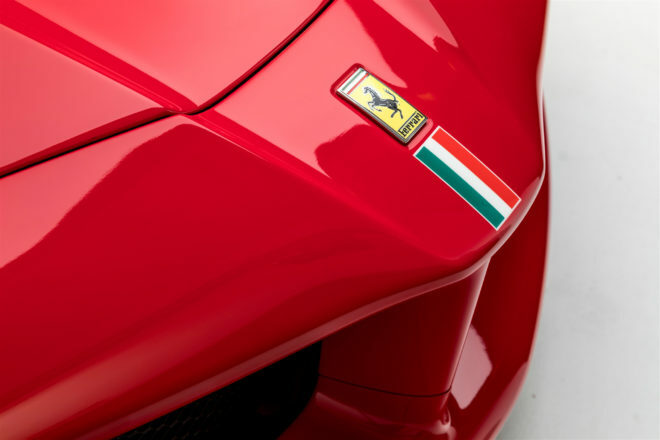 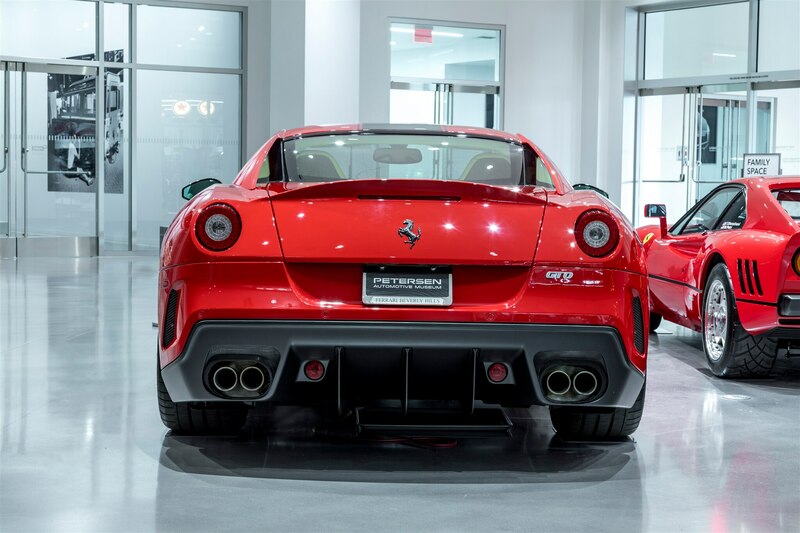 Italian for “Race Red,” Rosso Corsa has become synonymous with Ferrari. 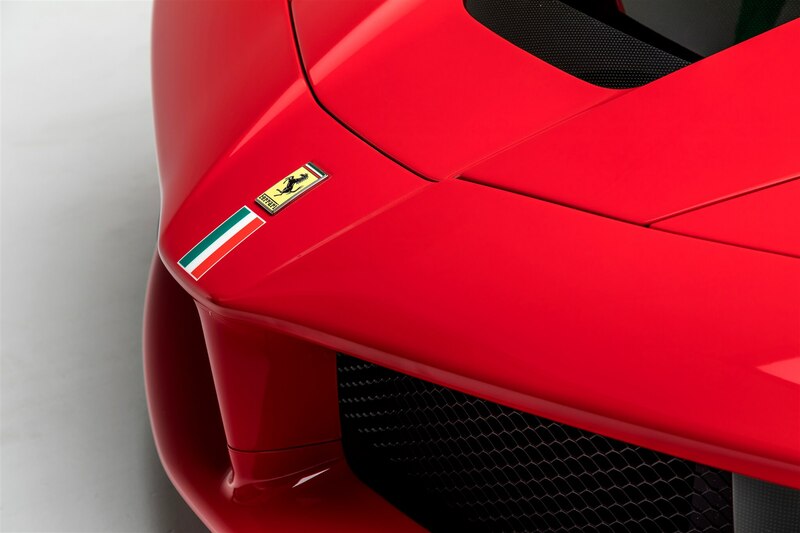 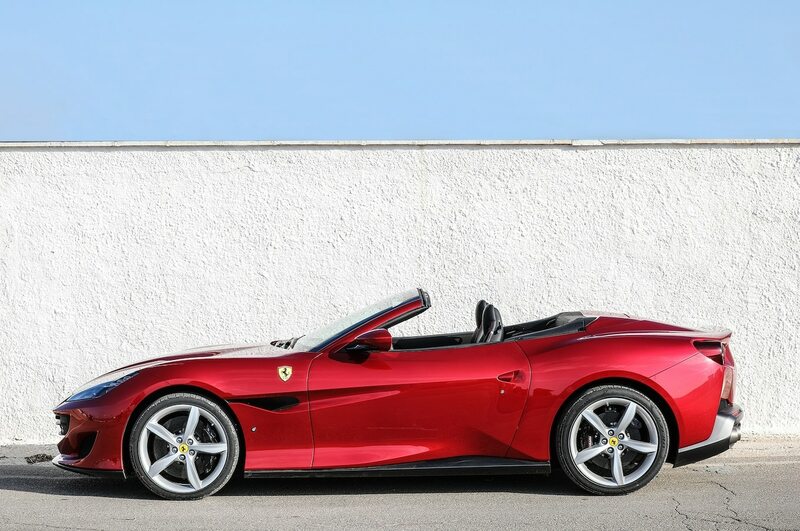 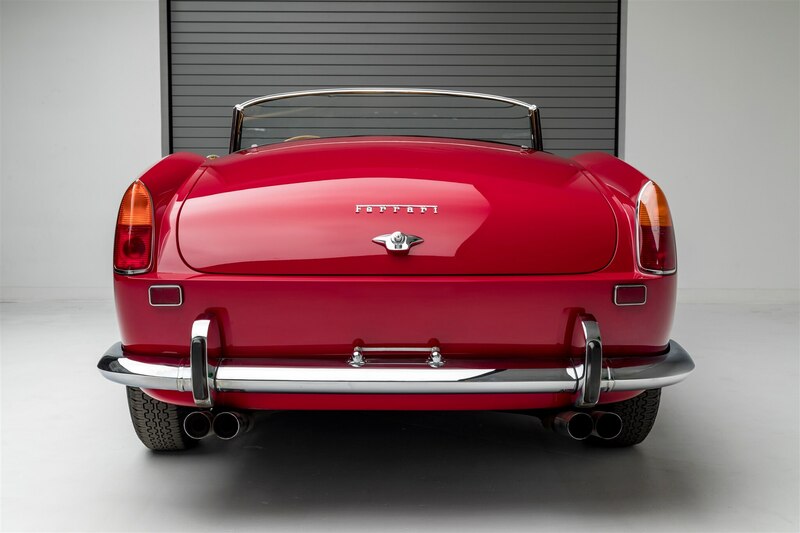 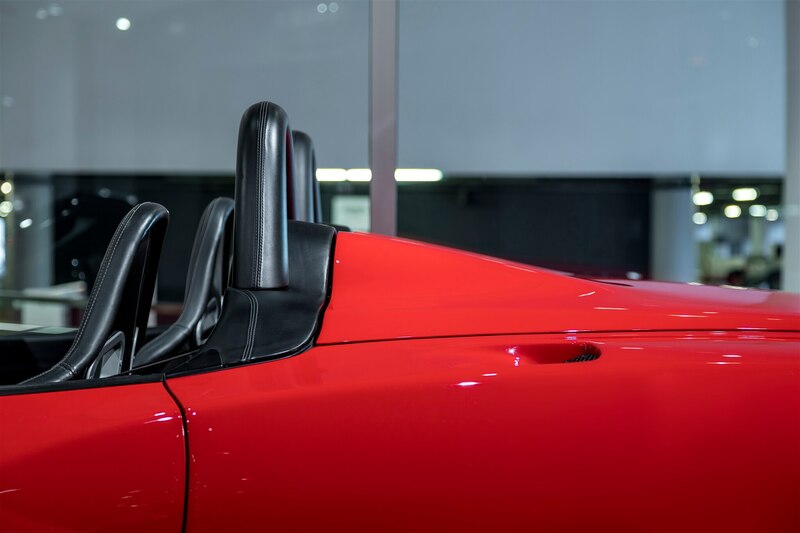 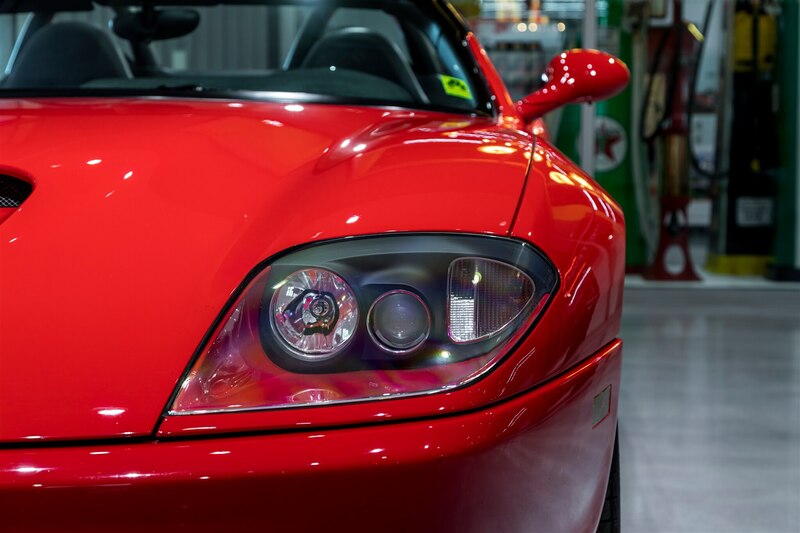 Most sports cars come in some variation of this color, because, well, red looks fast. 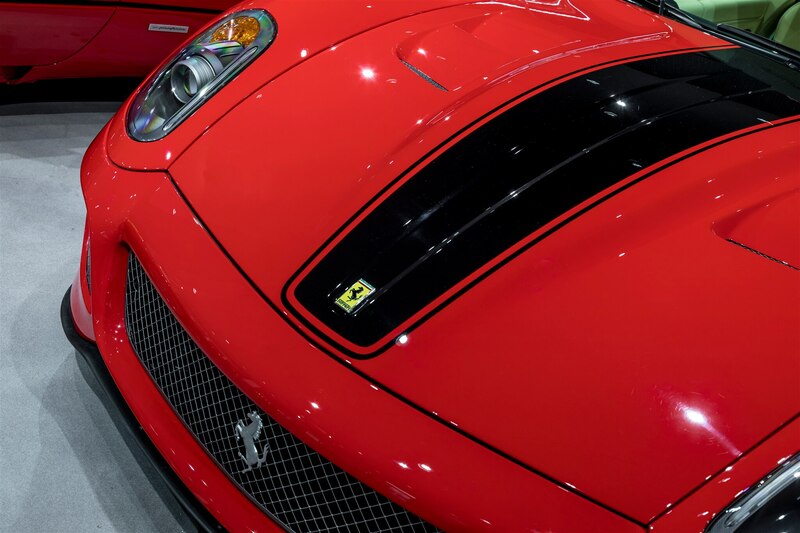 Initially, however, there was a specific reason for the scarlet hue. 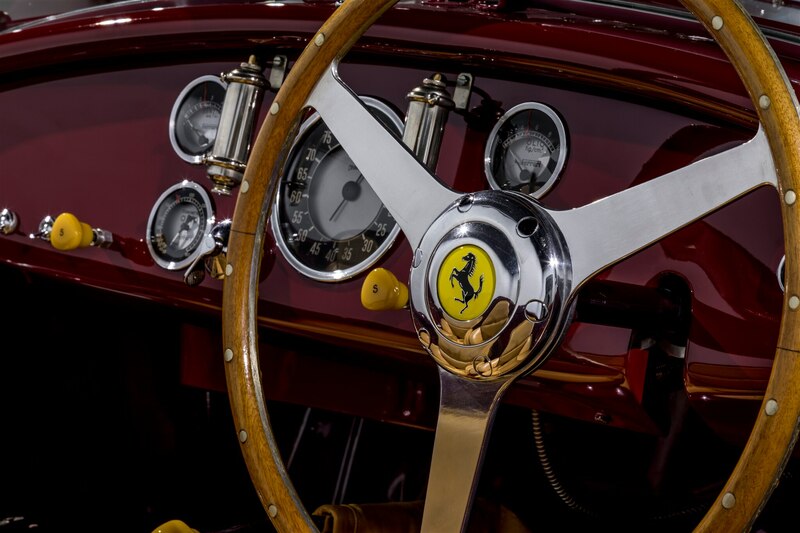 In the 1920s, cars racing on the European circuit were assigned colors according to their country of origin. 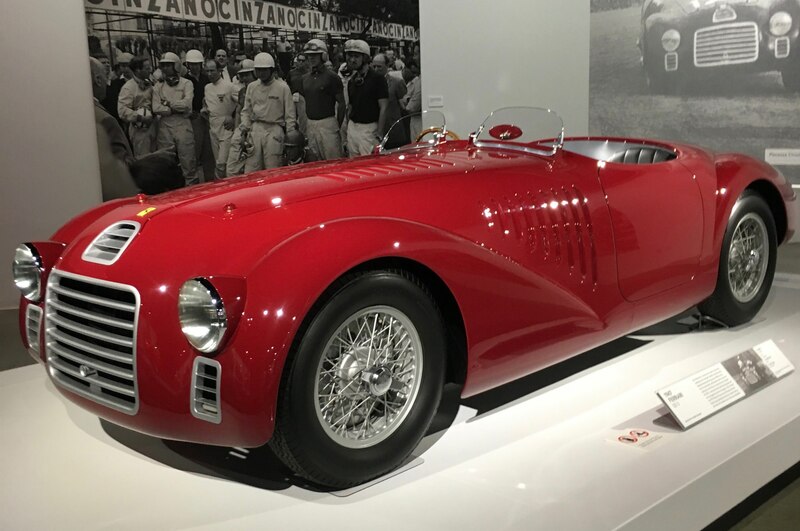 Rosso Corsa was the traditional racing color of Italy, which of course included Ferrari, but was also worn by cars from Alfa Romeo, Maserati, Lancia, and others. 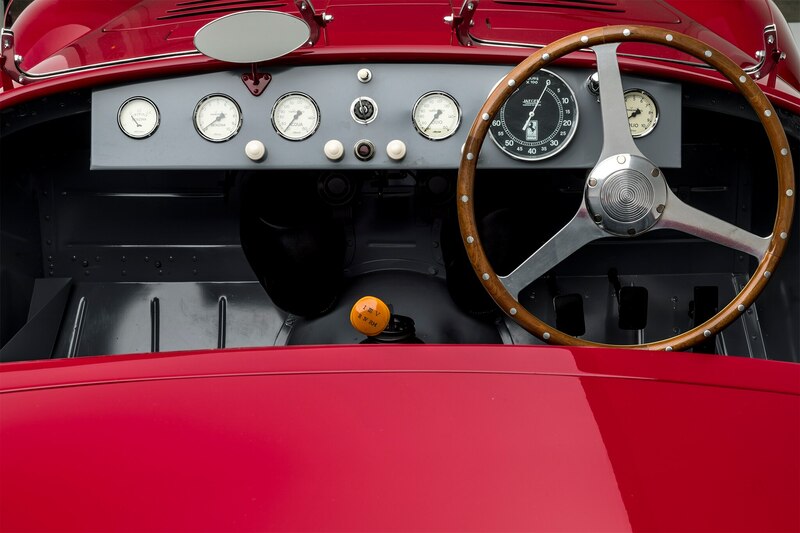 French race cars of the day from the likes of Bugatti, Peugeot, and Delahaye wore Bleu de France blue. 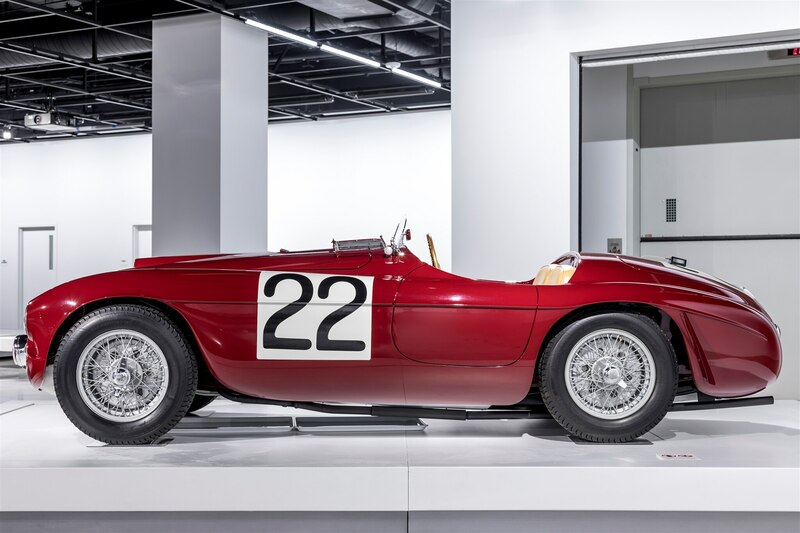 German entrants such as Mercedes and Porsche were initially white, but in the early 30s moved to silver or bare sheetmetal, becoming the legendary “Silver Arrows.” British Racing Green was applied to teams including Jaguar, Lotus, and Bentley. 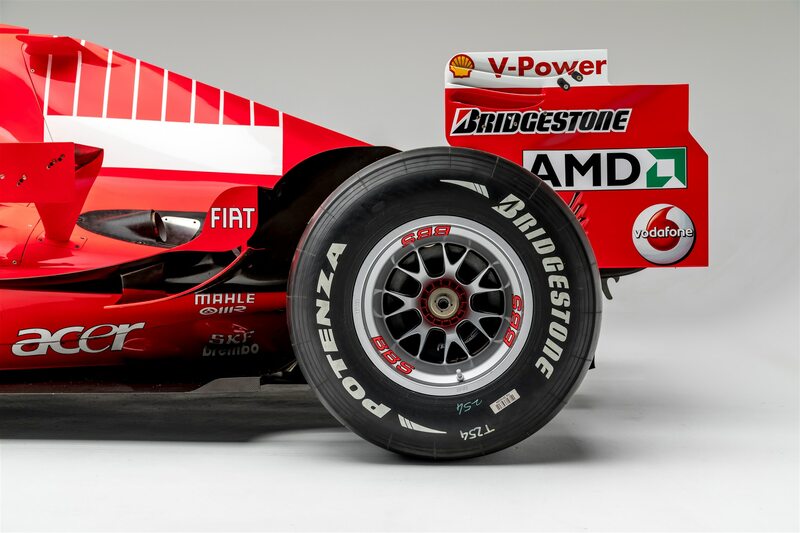 Just when you think you’ve got it down, Ferrari goes and changes it up on you. 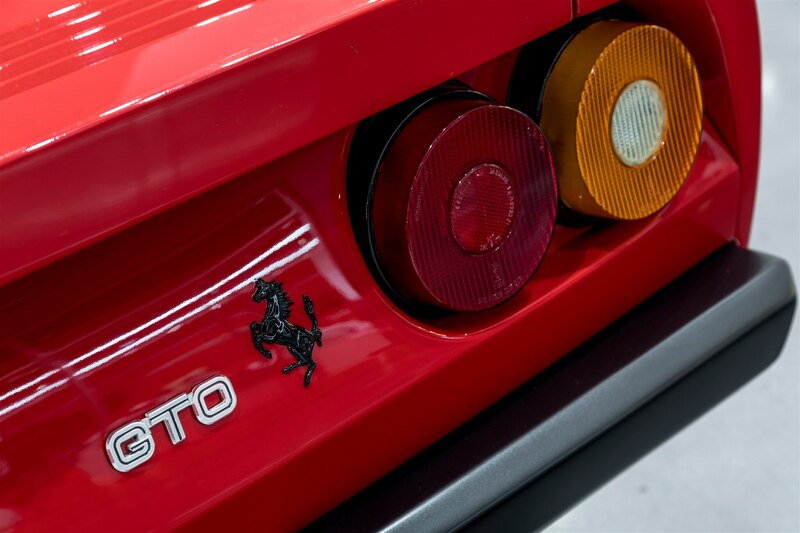 Until the early 1980s, Ferrari used a three-number naming system that was based on engine displacement for its V-6 and V-8 models. 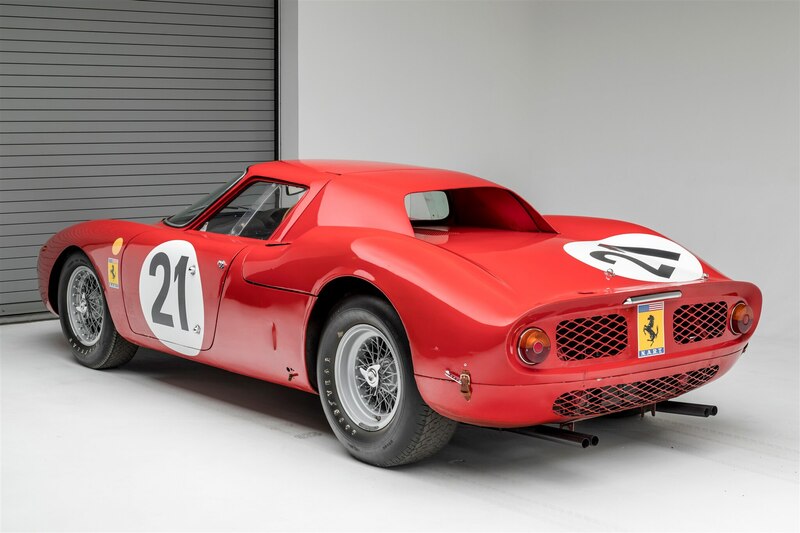 If it had a 2.4-liter V-6 it was the 246. 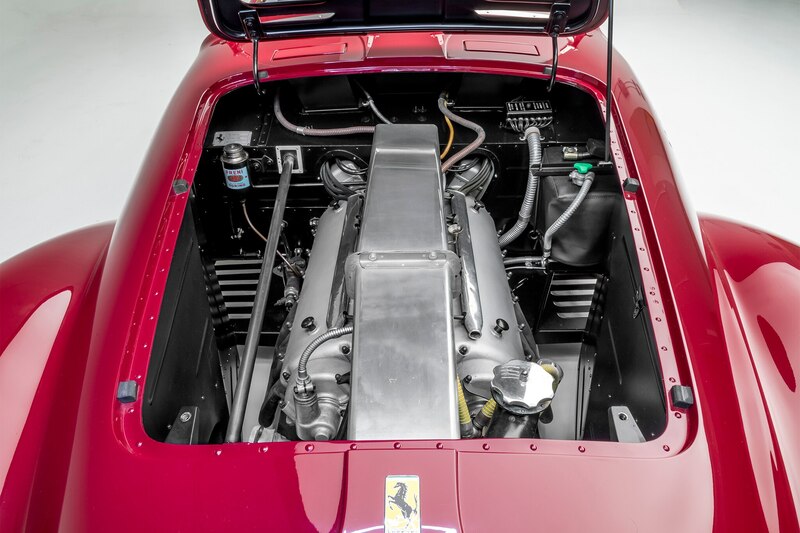 A 3.4-liter V-8 became the 348. 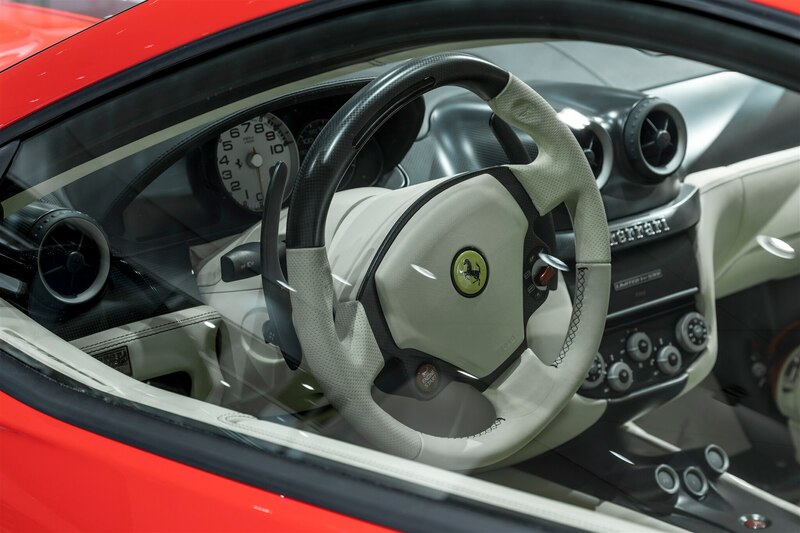 That ended for a time, only to be revived with the 458. 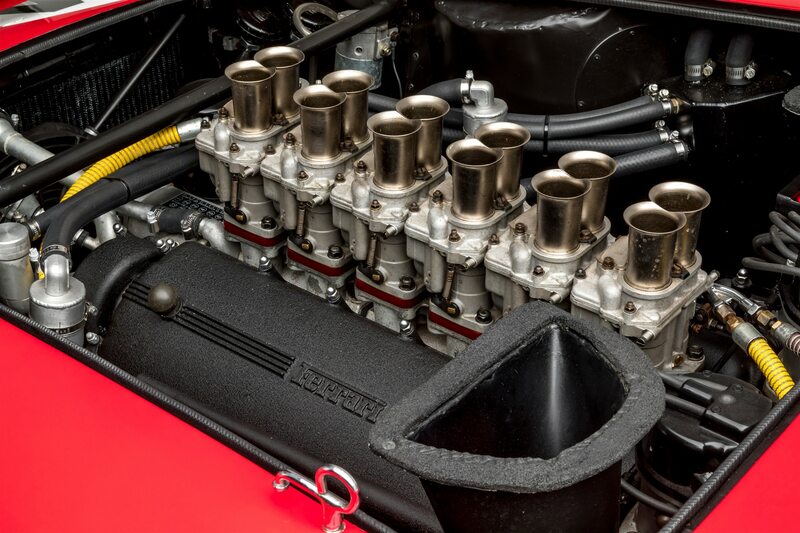 V-12 cars typically used the displacement of only one cylinder, but then only some of them did. 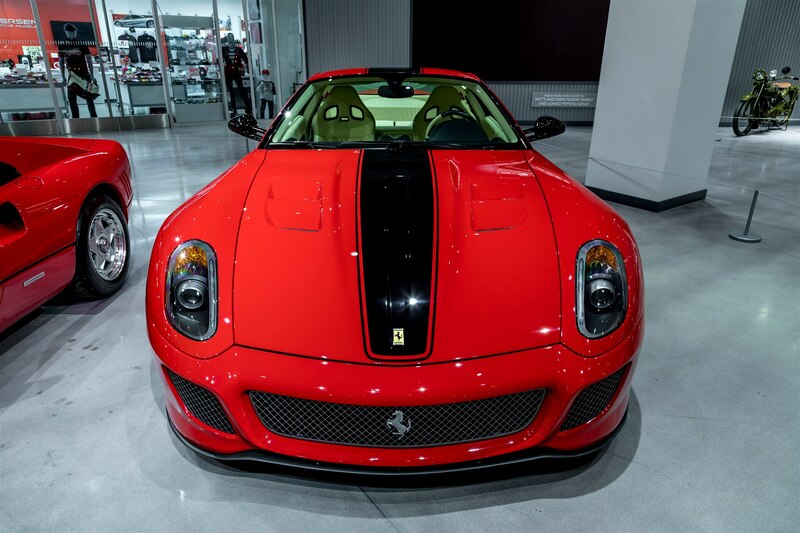 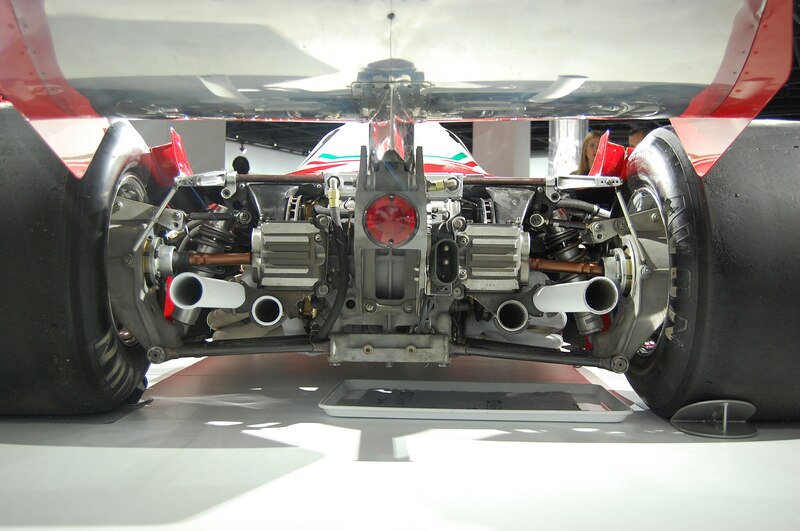 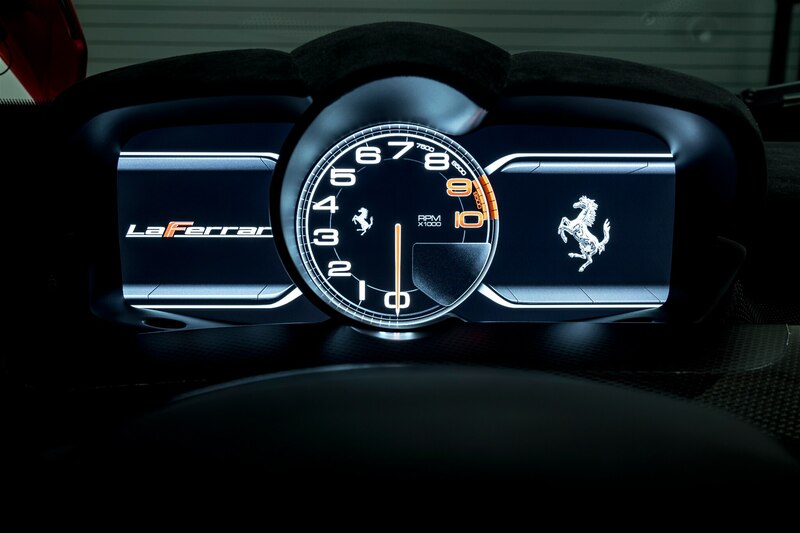 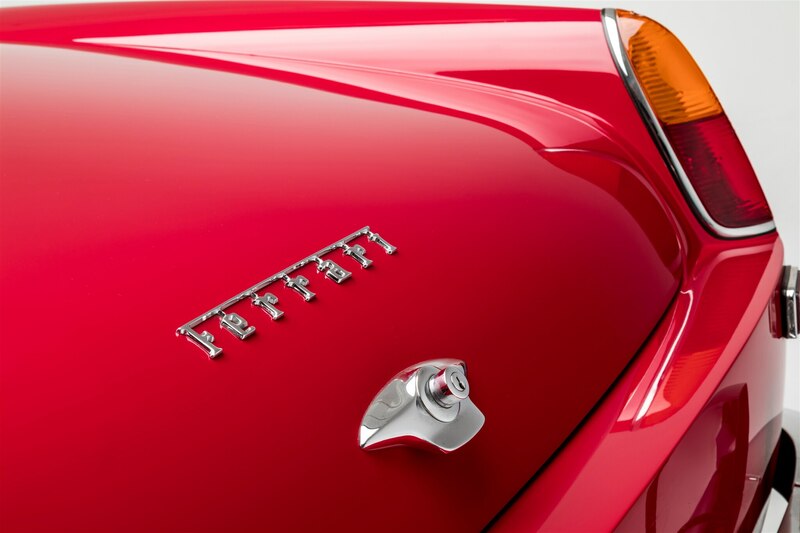 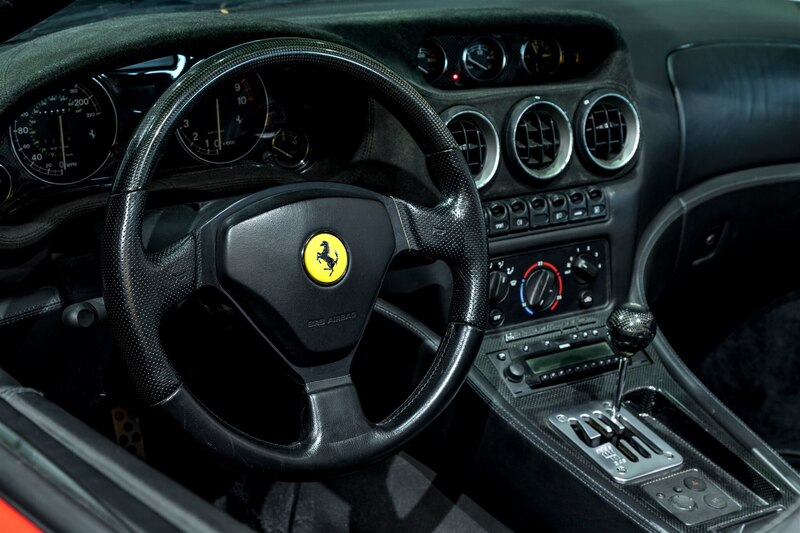 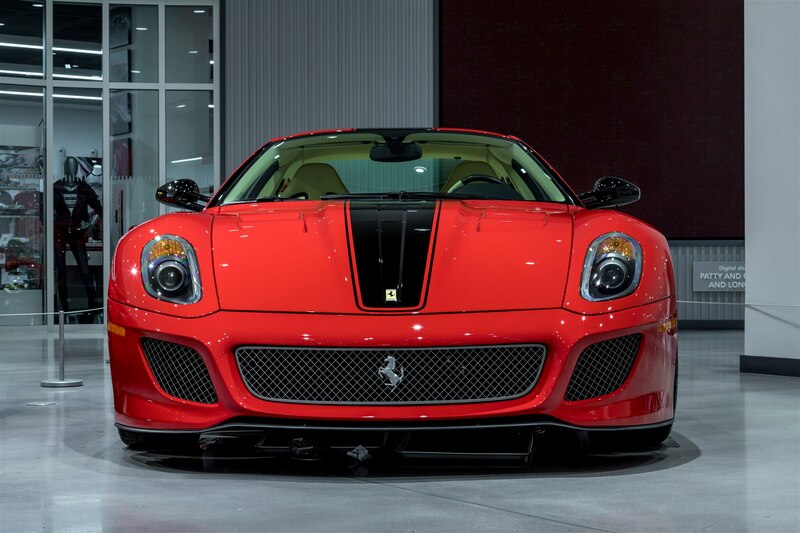 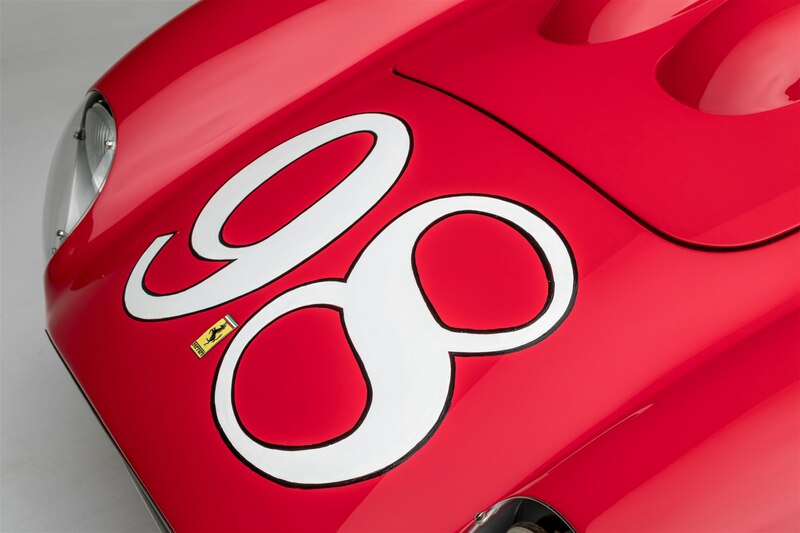 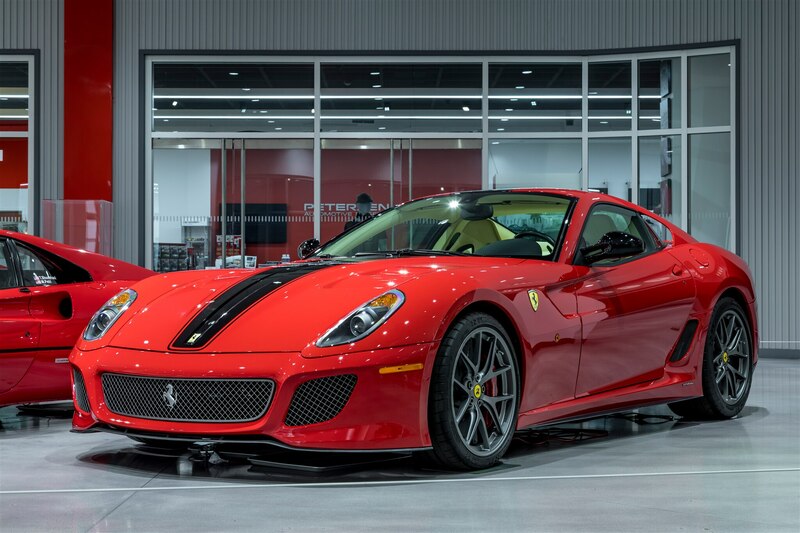 In the case of the newer 599, the three numbers refer to the engine’s total displacement of 5999 cc. 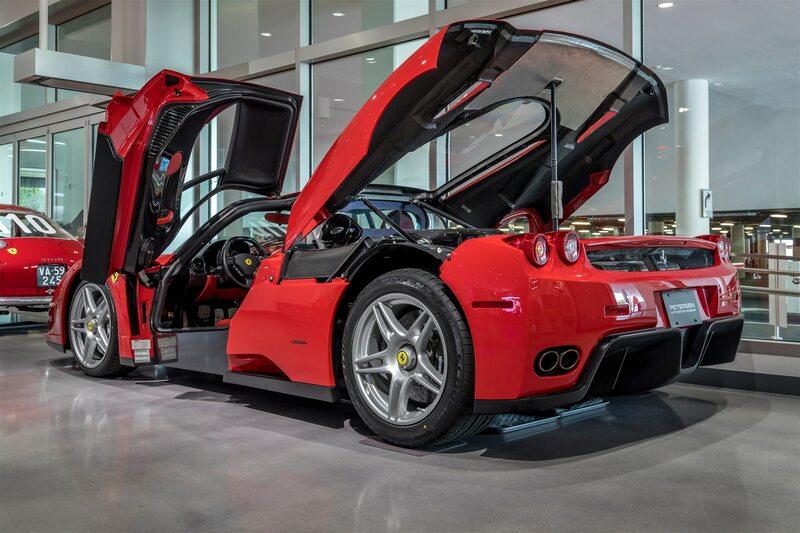 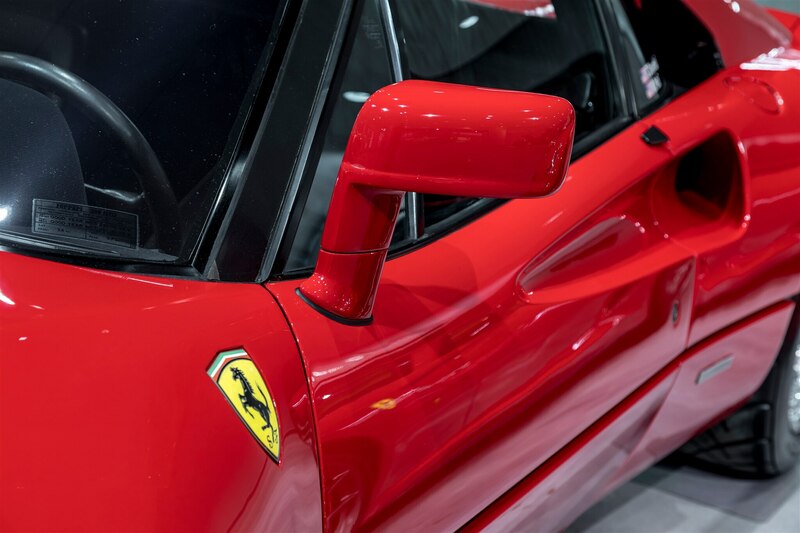 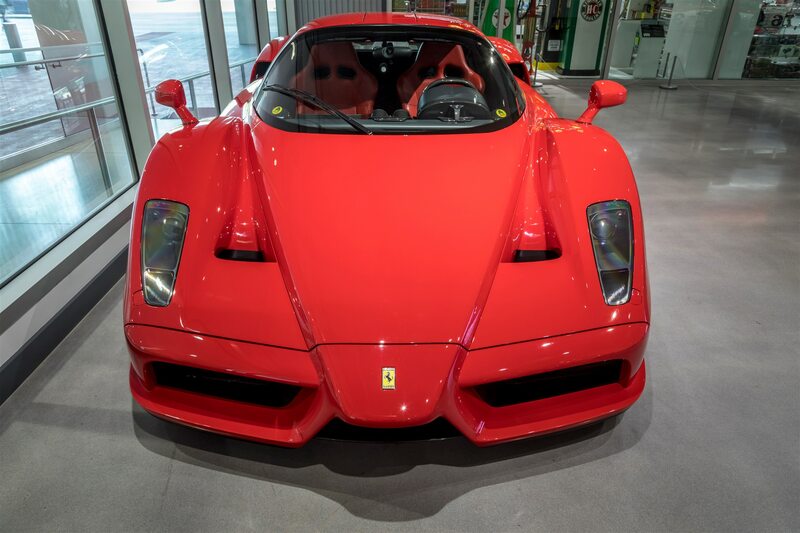 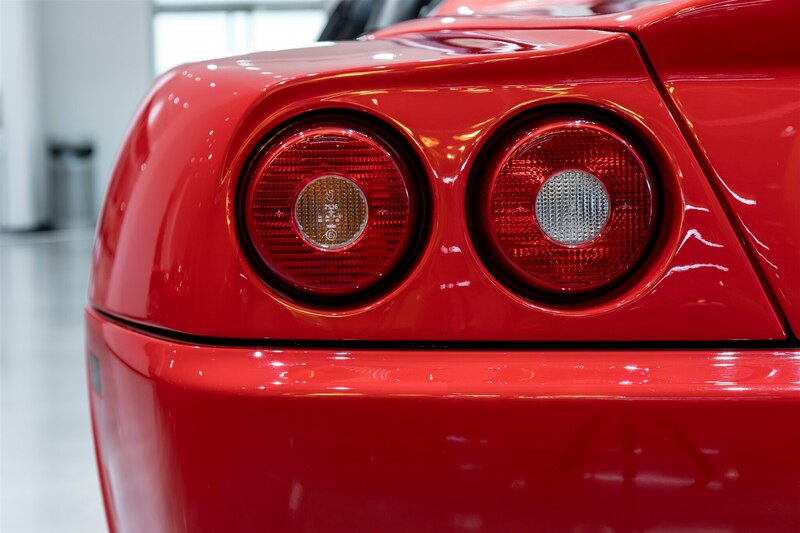 Flagship models used the “F” followed by the anniversary in years from Ferrari’s first car in 1947 — thus, the first-produced-in-1987 F40, The F50, first produced in 1995, almost-but-not-quite fit that scheme, and it ended entirely with the Enzo. 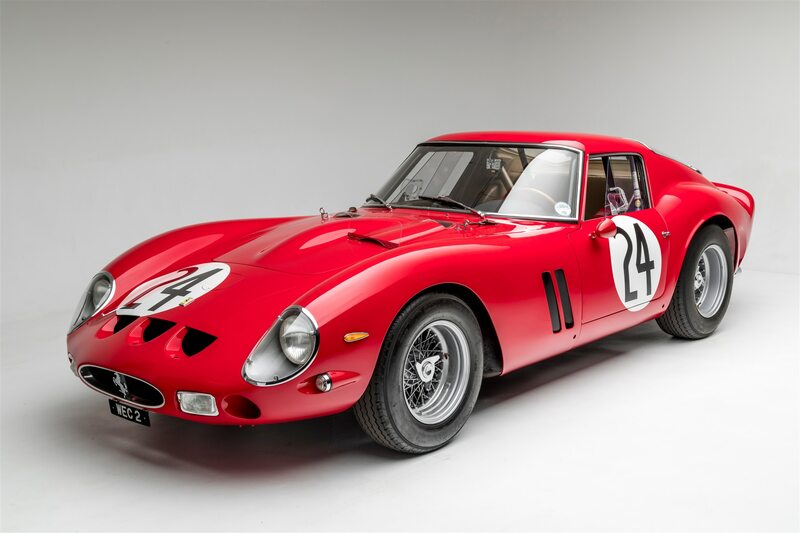 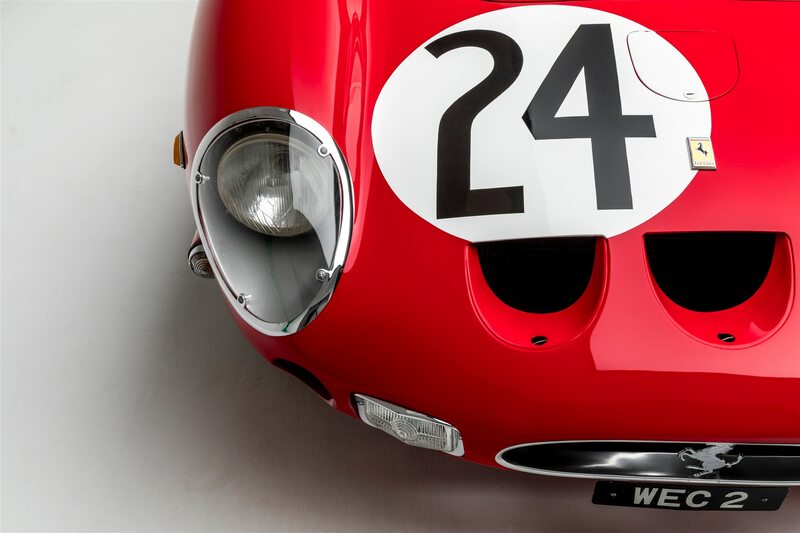 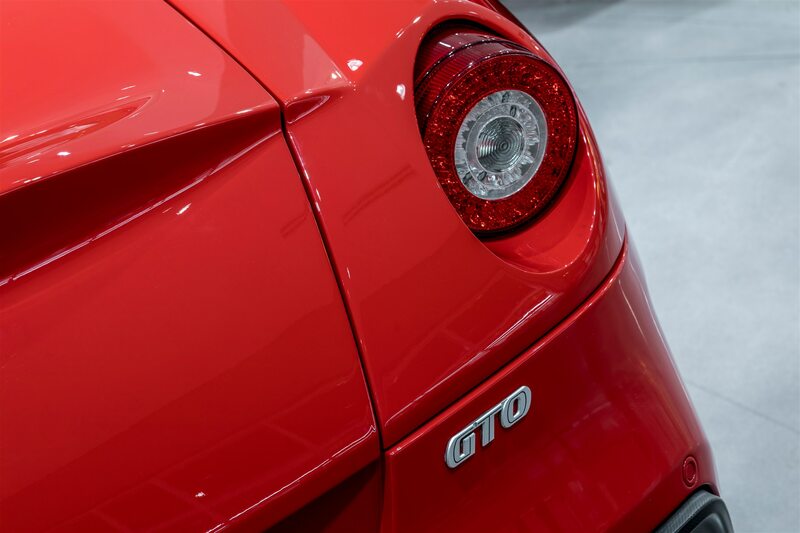 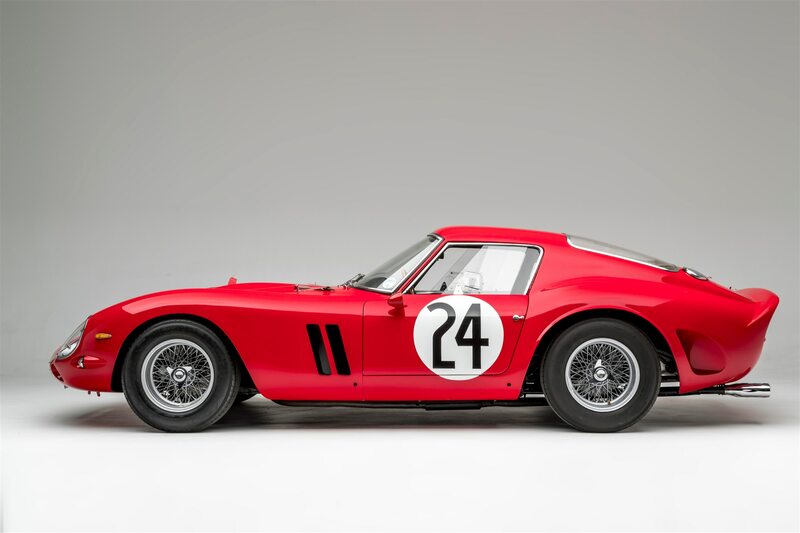 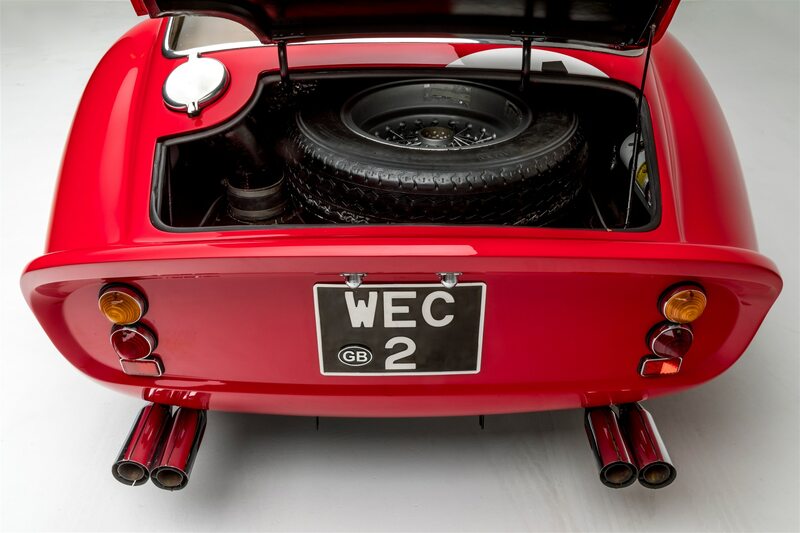 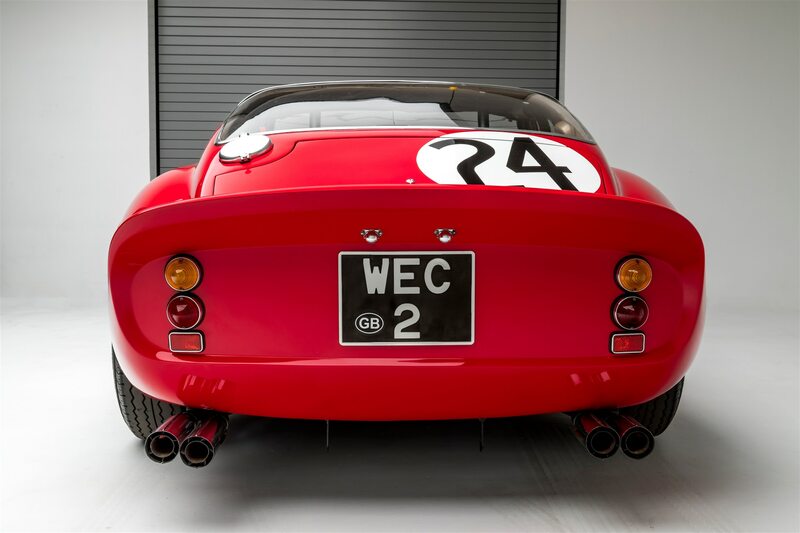 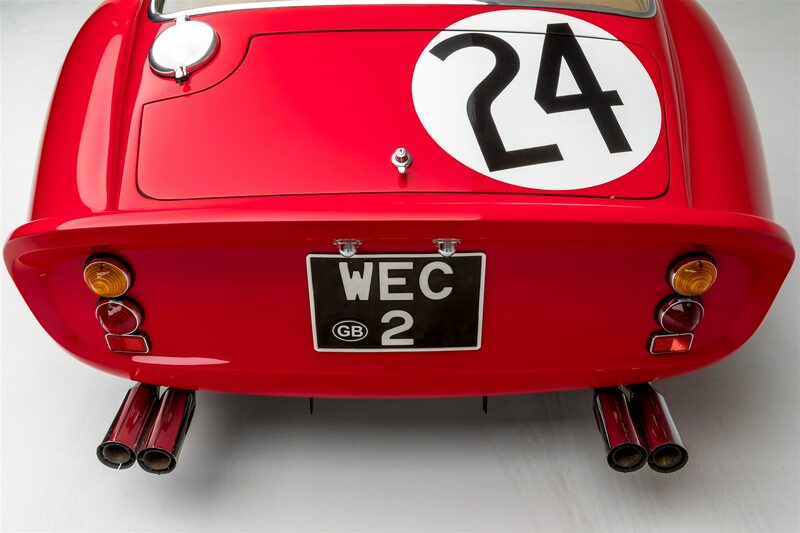 The letter “M” signifies a modified, not completely overhauled version of its predecessor, and the aforementioned “GTO,” which designates a model that’s been modified for use on the racetrack.